Brooklyn, NY & Greenville, NJ ..&..
and no affiliation or connection with those companies or municipalities is suggested or implied. This website and the information contained within has been compiled for the use of reference only, and any inaccuracies are purely accidental. This webpage sees revision for the purpose of the addition of information, or correction of inaccurate data. Return to Service in 52 Days! 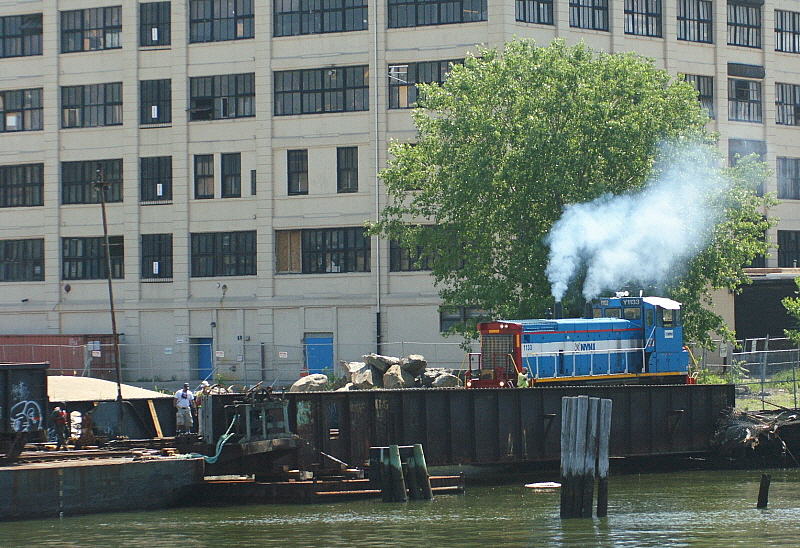 In 2006, the New York Cross Harbor Railroad (in name) ceased operation. 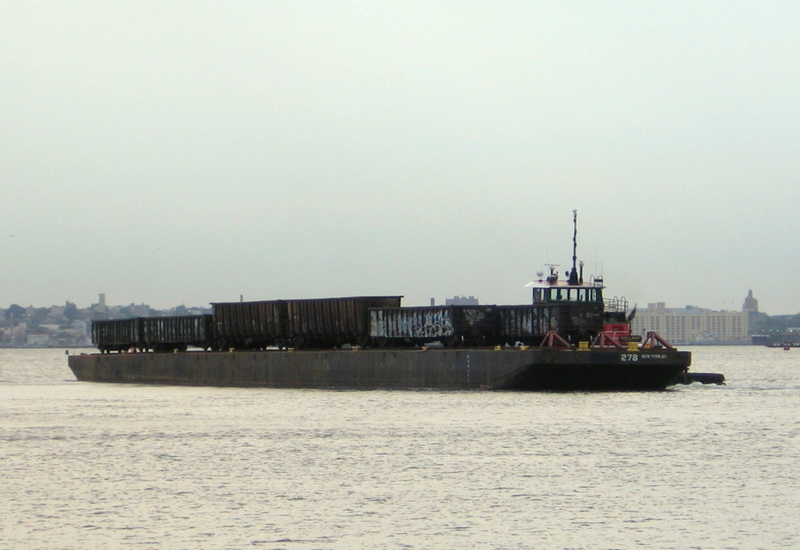 Following a change of ownership and administrative personnel, the operation would be renamed New York New Jersey Rail, LLC; but carfloating would continue to be part of New York Harbor. Now, just a short 5 years later; a lot of history is involved. 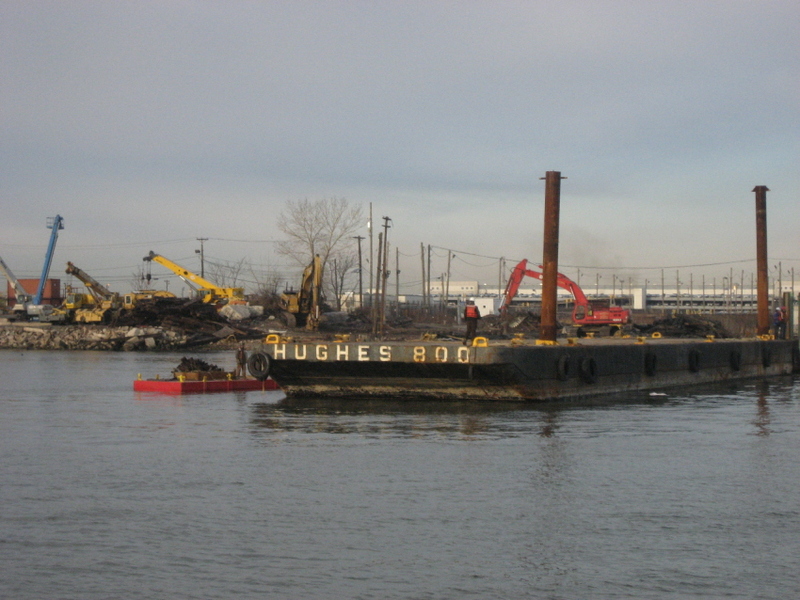 Regardless of the change of name, it is the last railroad to utilize carfloating operations in New York Harbor! 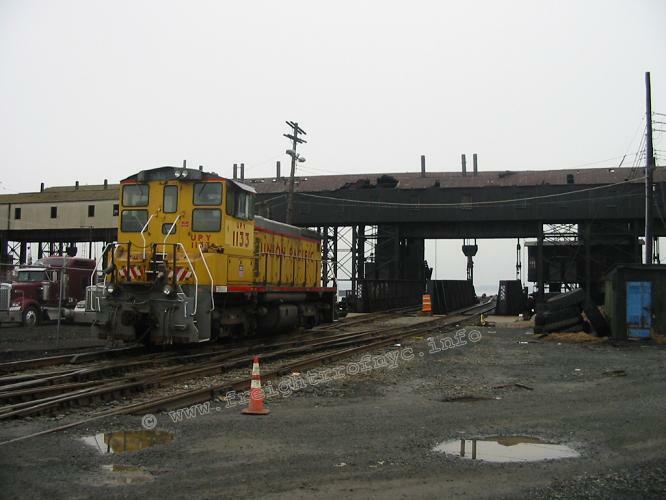 If you are interested in the in depth history of Offline Terminal / Common Carrier Railroads that make up the 100 year predecessor history of the New York New Jersey Rail, please read the pages on: Bush Terminal, New York Dock, and New York Cross Harbor Railroad. 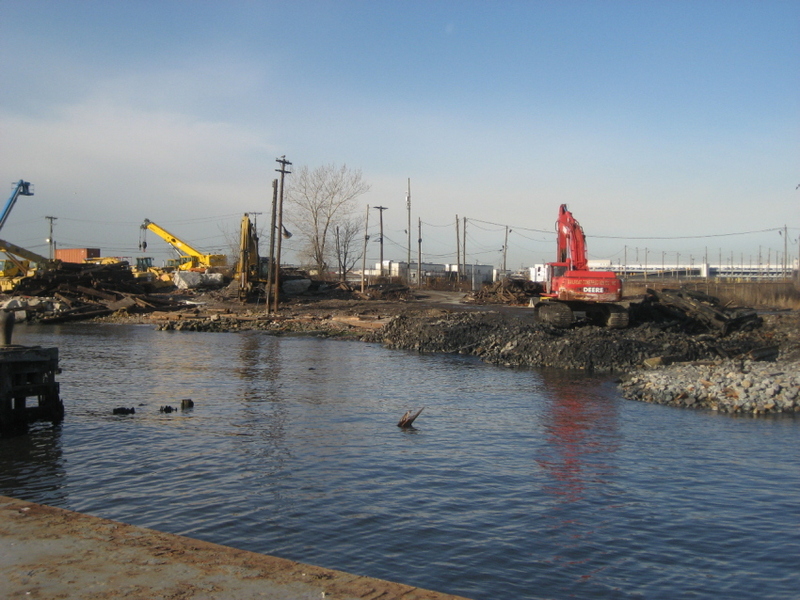 It can be said there are two eras of of operation of New York New Jersey Rail: and two siginificcant events pretty much coincide with each other: the relocation of the base of operations and Hurricane Sandy damage. 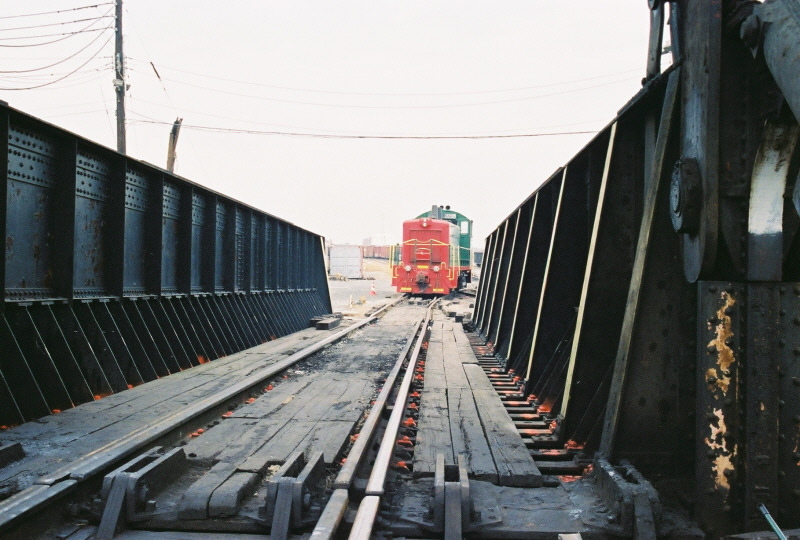 The old era of operations refers to when service was based out of Bush Terminal Yard; the Bush 2 pontoon float bridge was used in Brooklyn, the ex-PRR Greenville transfer bridges serviced Greenville Yard. 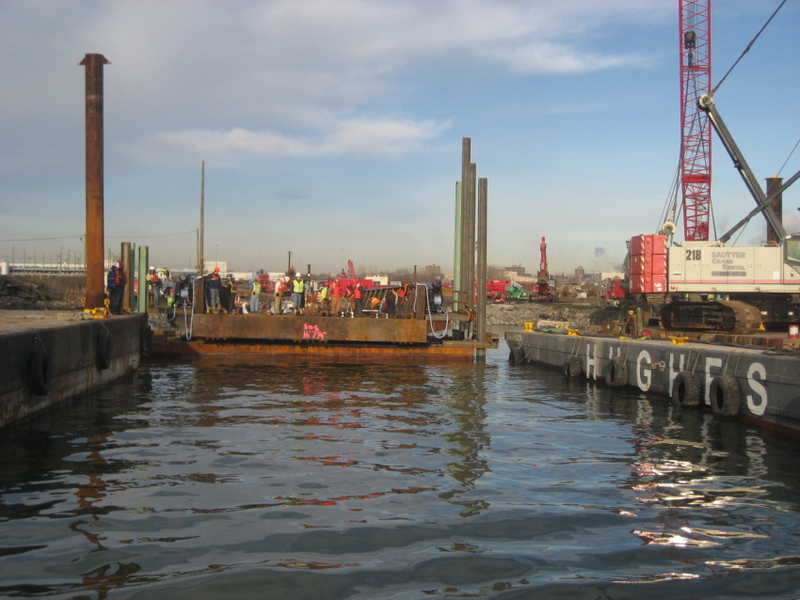 New era (current) base of operations began in April 2012 at which time it was relocated to the 65th Street Yard and the transfer bridges at that location were activated, and Bush 2 float bridge placed out of service. 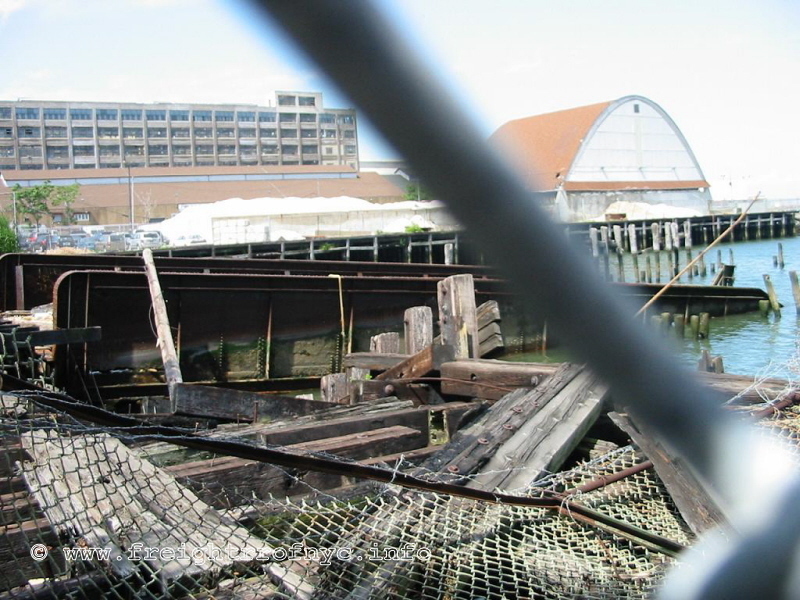 Just a few months later in October 2012, Hurricane Sandy's storm surge irrepairably damaged the Greenvillle Transfer Bridges and had to be demolished. The Bush 2 float bridge was relocated to Greenville so that operations could continue. Presentlly, requests for proposals, engineering drawings and the preliminarys have been drawn up for the construction of two modern 4 track carfloats to utilize the proposed new transfer bridges at Greenville. 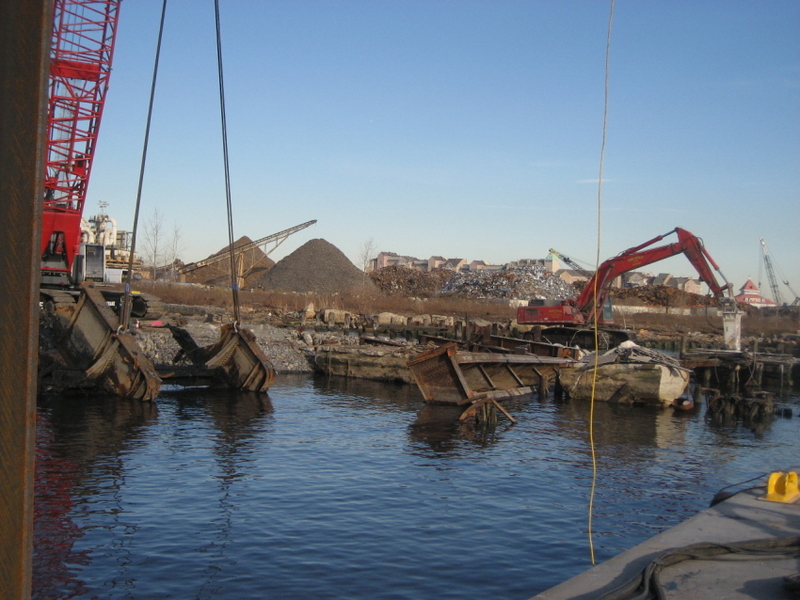 In 2006, the New York Cross Harbor Railroad would officially become a "Fallen Flag". 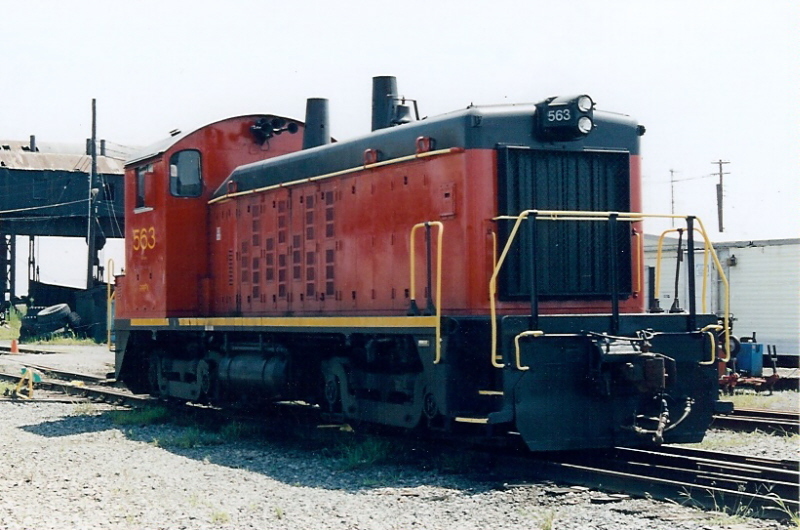 A new company: Mid Atlantic New England Rail, LLC; based out of West Seneca, NY; had purchased and assumed control of New York Cross Harbor Railroad. At this time it had the operation renamed to "New York New Jersey Rail, LLC". Nevertheless, the carfloating operation continued, as it was at that point essentially nothing more than a "name change and a paper shuffle". Ironically, this Mid Atlantic New England Rail ownership did not last long, because in November of 2008, the Port Authority of New York & New Jersey announced that they had purchased New York New Jersey Rail. The Port Authority of New York & New Jersey (PANYNJ for short) is a bi-state government agency dating it roots back to 1921. It administers to and oversees all aspects of transportation operations in the Port of New York, which includes the west shoreline of the Hudson River, which is within the State of New Jersey. 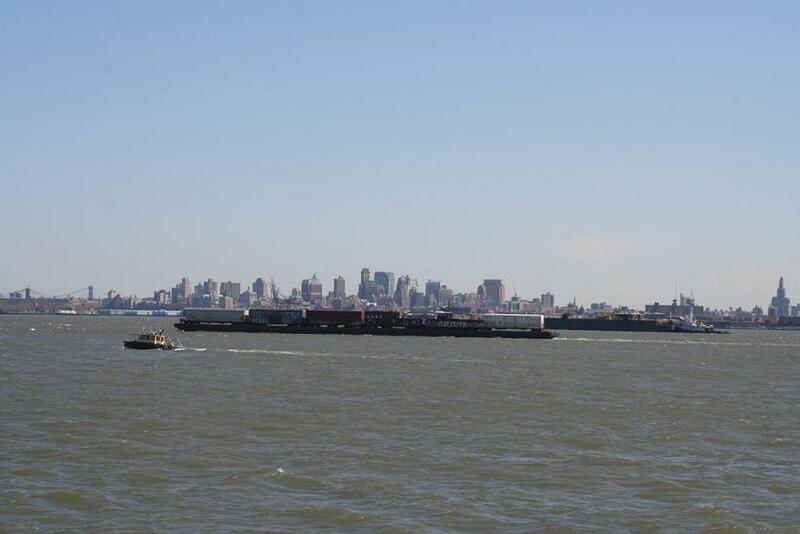 and many other Seaports, Piers and Basins throughout the New York and New Jersey waterfront. It should also be noted, that railroad operations are not new to the agency, as it acquired the Hudson and Manhattan Railroad in 1962, a passenger carrying railroad between downtown Manhattan and Hoboken, NJ; as part of an agreement when planning and construction of the World Trade Center was undertaken in the mid 1960's. The Hudson & Manhattan RR was renamed "Port Authority Trans Hudson" (or as most New Yorker's call it by its acronym: "PATH"). PANYNJ is also responsible for the construction and operation of the both the Newark and John F. Kennedy Airport's "AirTrains", a monorail type passenger transport system to link the various passenger terminals within the airport itself and to connect the airport the nearest passenger rapid transit station. This PANYNJ purchase of the New York New Jersey Rail could get quite interesting, as the PANYNJ appears to be quite in favor of revitalizing and expanding rail hubs and links. As the PANYNJ is a government agency, I would expect a lot of resistance that was or might have been previously met and encountered by the private holders and owners that were looking to expand, modify, or otherwise improve their rail operation; should no longer be a factor. One would not expect one governmental agency to incur resistance from another. If this does not sound plausible; one only has to look across New York Bay at either the New York Container Terminal in Howland Hook, Staten Island or the Express Rail facility located in Newark, New Jersey to see the extensive improvements made to the rail hubs by the Port Authority of New York & New Jersey, and within a relatively short period of time and with a minimal of bureaucratic resistance. From a financial standpoint, as the PANYNJ is a bi-state agency (New York and New Jersey), the costs are shared by two states instead of one, which in effect should make the cost of major infrastructure improvements easier to bear financially. 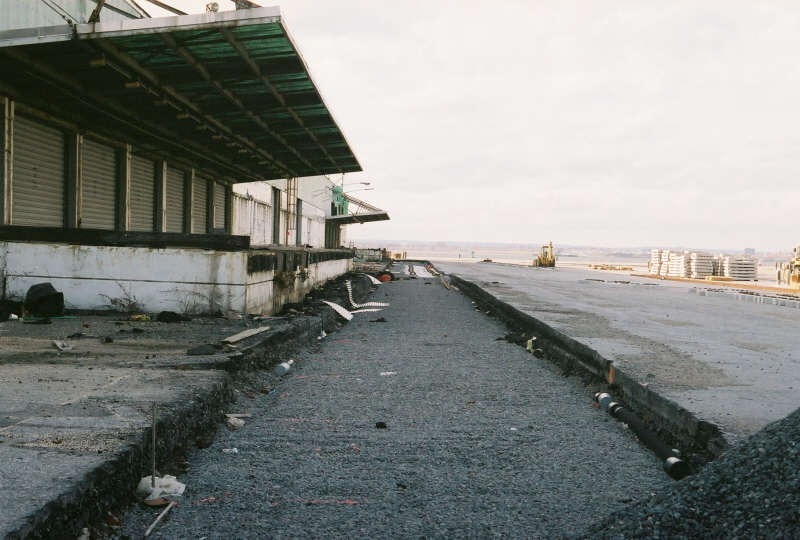 Whereas a private owner might experience problems in significant funds to improve their operation; whether it be adding a rail siding, tearing down an obsolete structure, etc; the PANYNJ merely adds it as a budgetary line item. Granted this may be overly simplified, but I think you can get the point. The success story of New York New Jersey Rail continues as the PANYNJ has purchased the Port Jersey Railroad and added it to the operations of New York New Jersey Rail in late 2010. This acquisition will add 2.4 miles of trackage to the New York New Jersey Rail operation in the State of New Jersey. Details of this purchase can be read in the Port Jersey chapter of this page. 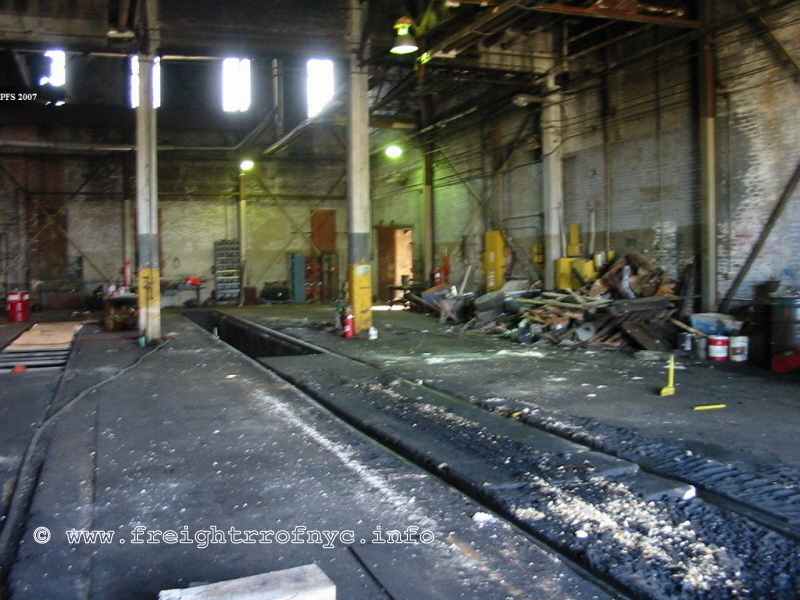 In short, we shall see where this new ownership will take this very historical and last remaining aspect of New York Harbor freight handling. I know I can say with all sincerity, I wish them the best of success! this chapter has been created to keep the reader abreast of the status of ongoing and completed improvements. The following information comes from numerous sources and will be updated as it is provided to us. South Brooklyn Marine Terminal 9/2010- Current In September 2010, service to the "Yi Pin" siding was terminated. 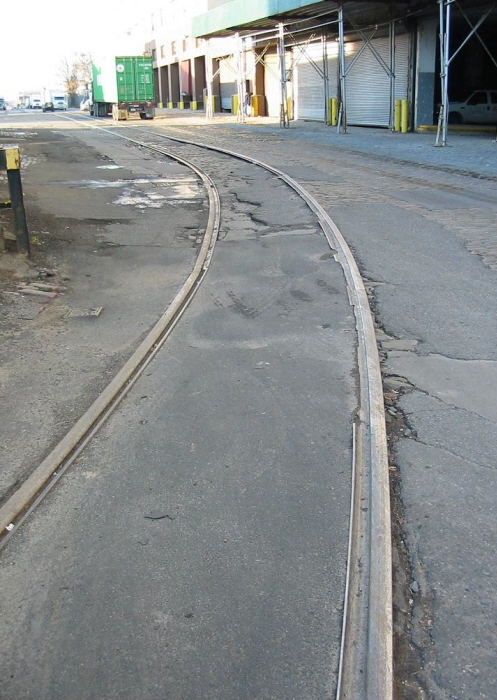 The existing tracks along First Avenue was ripped up May 2011 and reinstalled through October 2011. Street trackage between Bush Terminal Yard entrance at 43rd Street through 41st Street on First Avenue has been replaced. 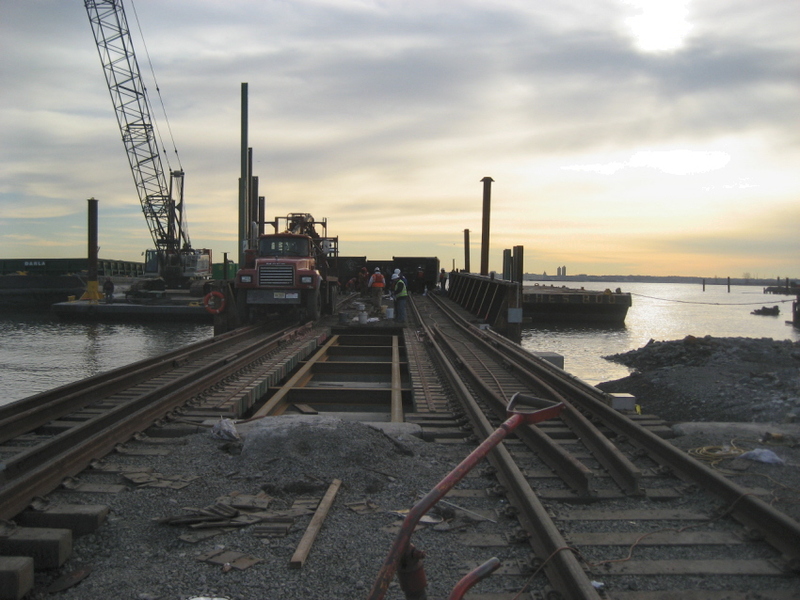 The new trackage alignment (where none existed at all previously) along First Avenue between 40th Street and South Brooklyn Marine Terminal (39th Street) was also installed and completed as of March 2012. 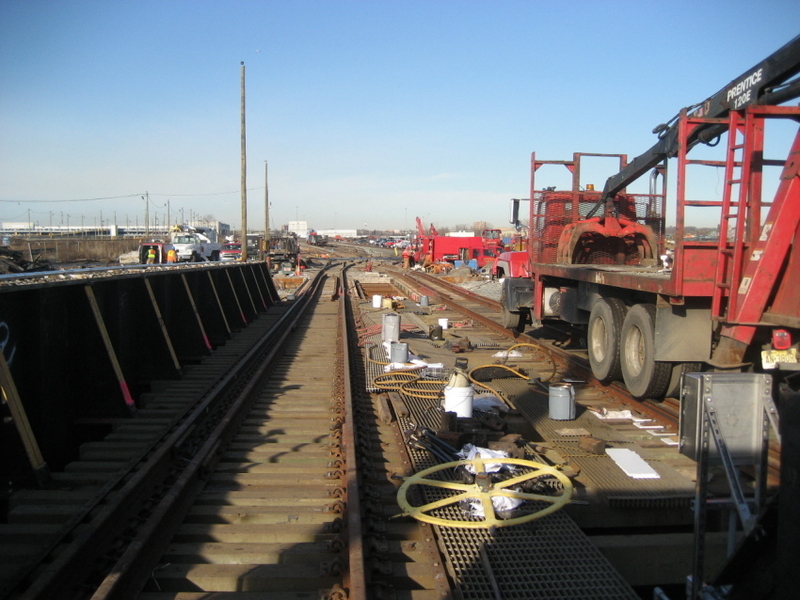 All trackwork from 43rd Street through 39th Street was expedited in anticipation of start up of rail service to and through South Brooklyn Marine Terminal, and before a planned sewer realignment project was to commence. But this rail traffic did not materialize. Now, realignment of sanitary & storm sewer lines has commenced (April 2012) to avoid being under street trackage and has required removal of this new segment of trackage between 40th - 39th Streets. Upon completion, trackage will be reinstalled. Also, this expedited track segment did not provide a turnout and siding for the customer "Yi Pin" at 40th Street and customer(s) began offloading in Bush Terminal Yard. When the sewer realignment project is completed, permanent trackage will be installed INCLUDING a new turnout and siding at 40th Street for "Yi Pin". 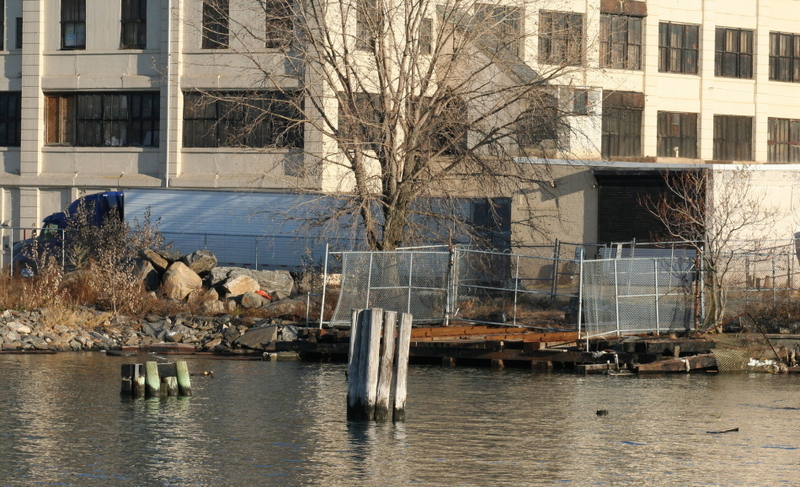 This work is expected to be completed late May / early June 2012. 65th Street / Bay Ridge Yard 4/2012 Also in operations of 65th Street / Bay Ridge Yard has been leased to NYNJ Rail and storage and switching of railcars has commenced. 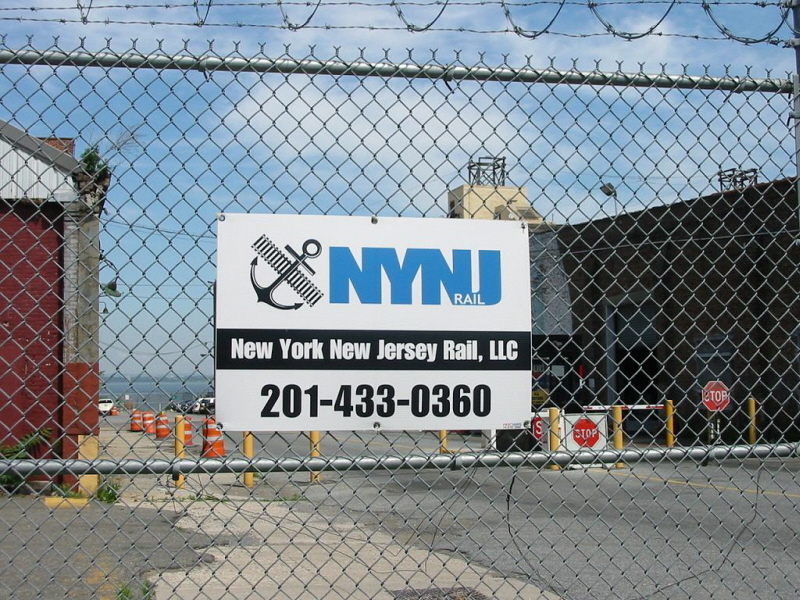 NYNJ Rail has installed a semi-permanent office trailer for train crews. 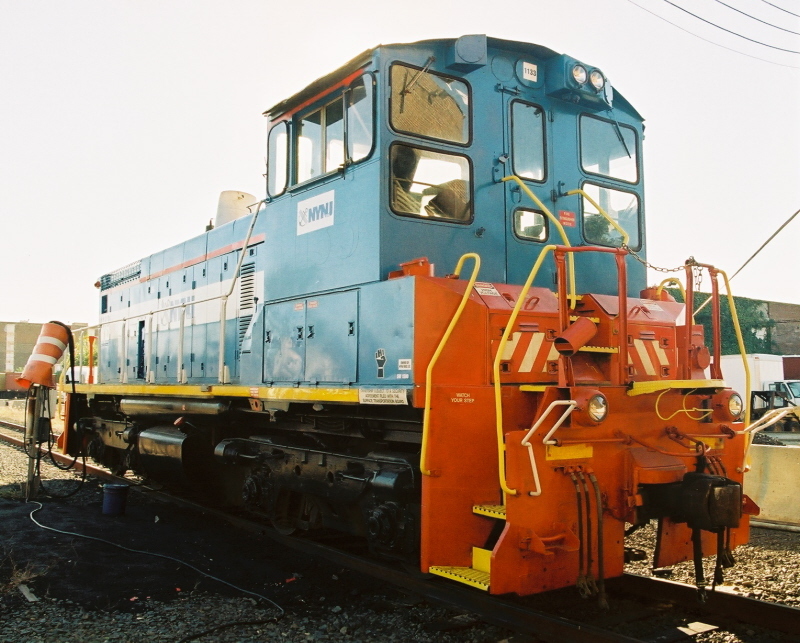 NYCTA equipment 5/-6/2012 Furthermore, the New York City Transit Authority has ordered 28 +/- diesel-electric work train locomotives and is expecting imminent shipment (May 2012) to Greenville, New Jersey. 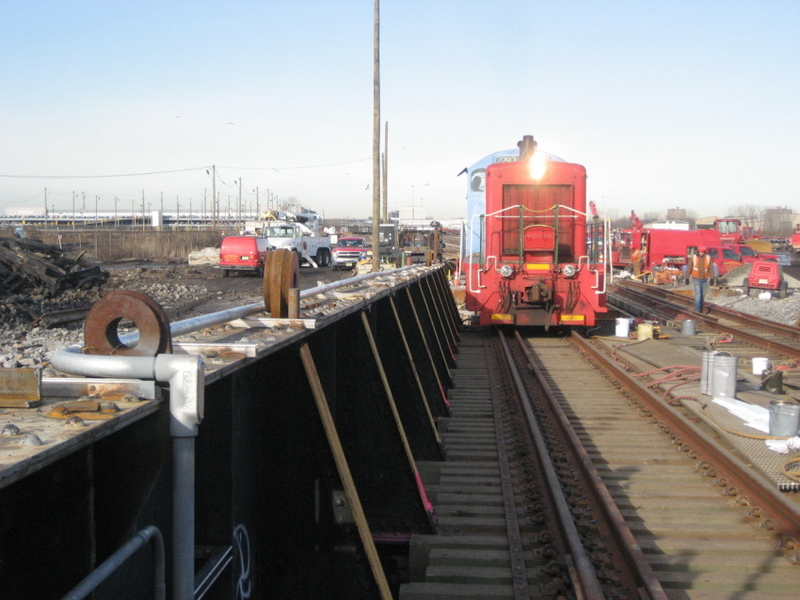 NYNJ Rail will be carfloating the locomotives to Brooklyn, but this will not take place until sewer realignment work along First Avenue is completed, and thereby allowing test runs of the new trackage between 43rd Street and 39th Street, prior to the trackage placed in revenue service. Furthermore, delivery of the next orders of new subway cars R179 and R188) is expected to be carfloated eastbound (brought into Brooklyn), but this is not confirmed. Also at this time it is said R44 subway car for scrapping will be carfloated westbound (to New Jersey). 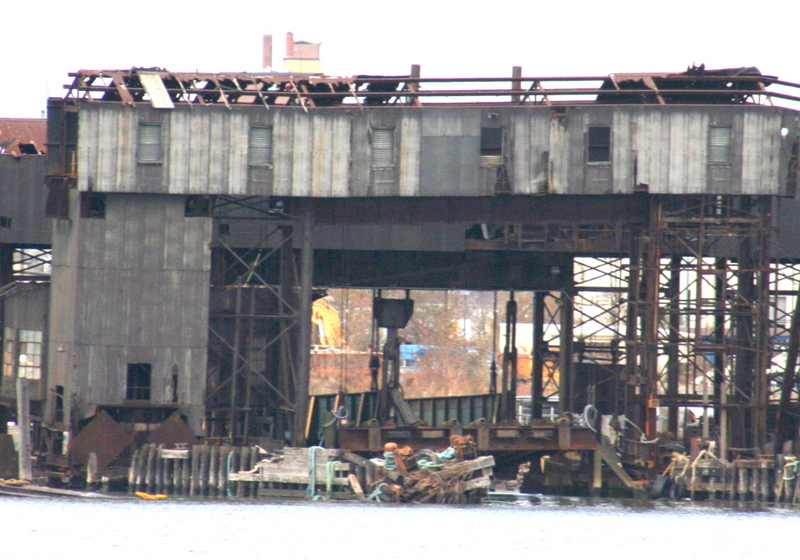 However it has also been said the scrapping of these cars will take place in South Brooklyn Marine Terminal at Sims Metal Management (Hugo Sims). New York New Jersey Rail inherited the operational locations of its predecessor, the New York Cross Harbor Railroad. As mentioned in the above paragraph, it is also expanding and adding other areas and has acquired a new property in December 2010. Bush Terminal Service to several spurs and customers as well as team tracks in yard until July 2012. All customer transloading now takes place at 65th Street. Operational rights granted April 2012, in use, interchange with Long Island Railroad / New York & Atlantic Railway. 39th Street Yard former interchange with South Brooklyn Railway - property not owned by NYNJ Rail, formerly South Brooklyn Railway location. 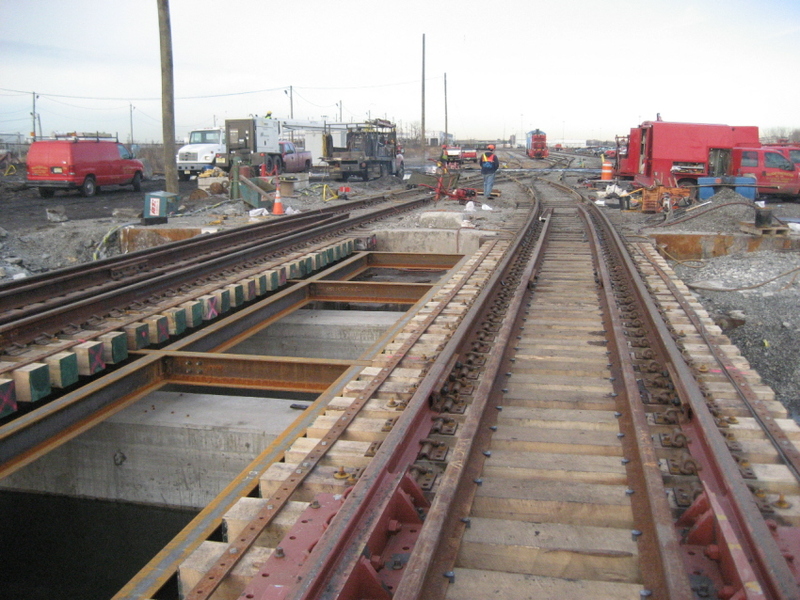 new interchange with South Brooklyn Railway at NYCTA 38th Street Yard between 3rd & 4th Avenues. 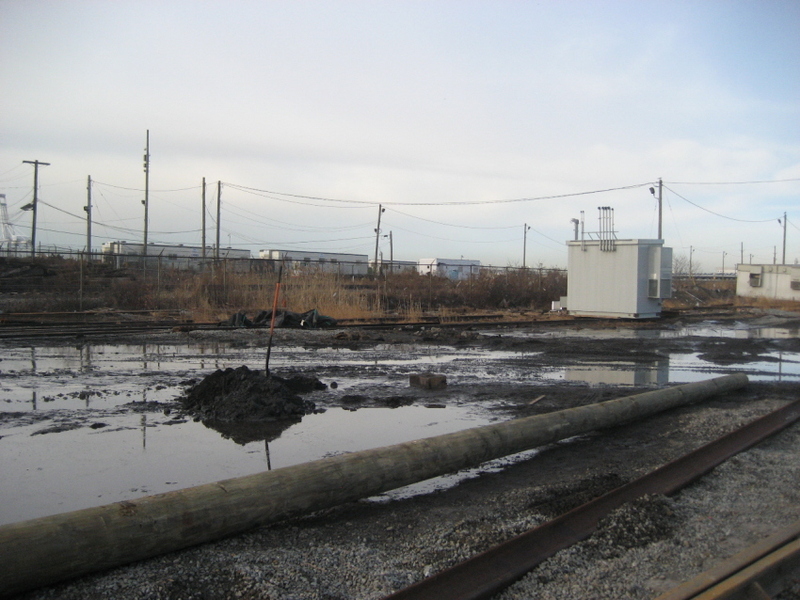 property not owned by NYNJ Rail, railroad operational rights when Terminal reconstruction is completed. and solid waste transfer stations, new float bridges, etc. 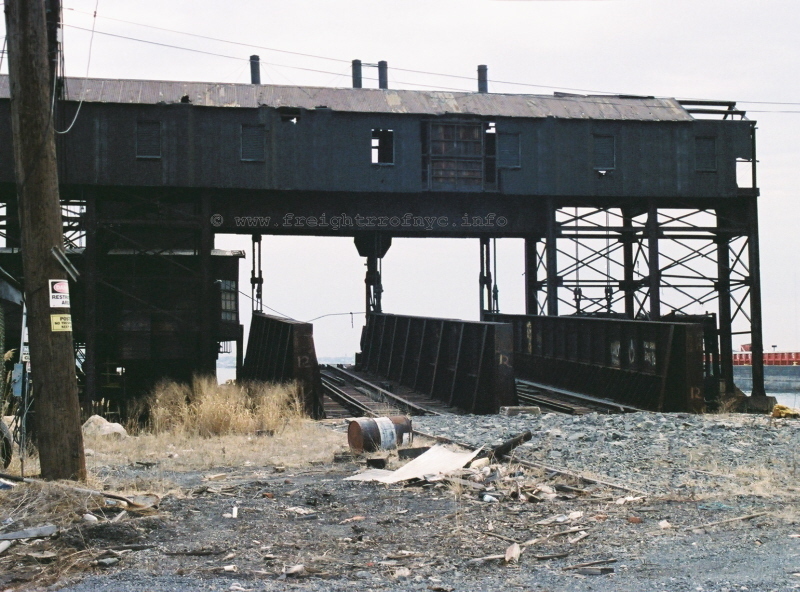 Bush Terminal was New York New Jersey Rail's most active terminal and base of operations until April 2012 and was a significant part of the "old era" of operations. 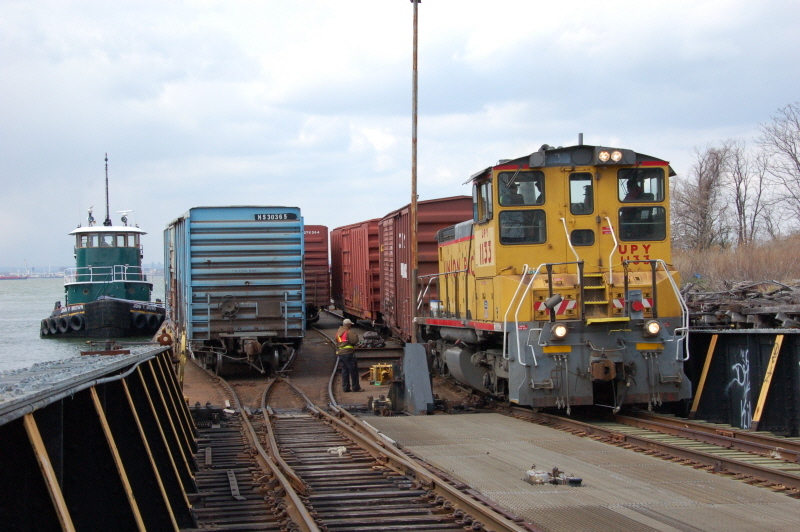 All customers shipping and receiving freight from Bush Terminal Yard have been relocated to the 65th Street Yard as of July 2012 and constitues the "new era" of operations. 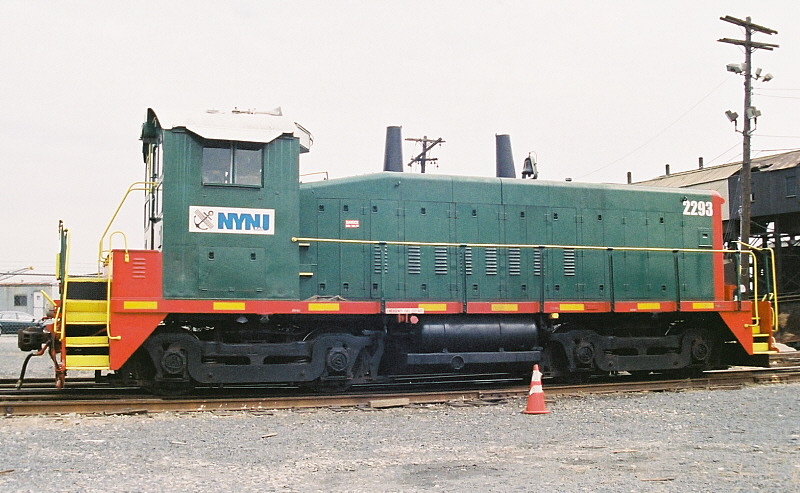 New York Cross Harbor Railroad (1983-2006). 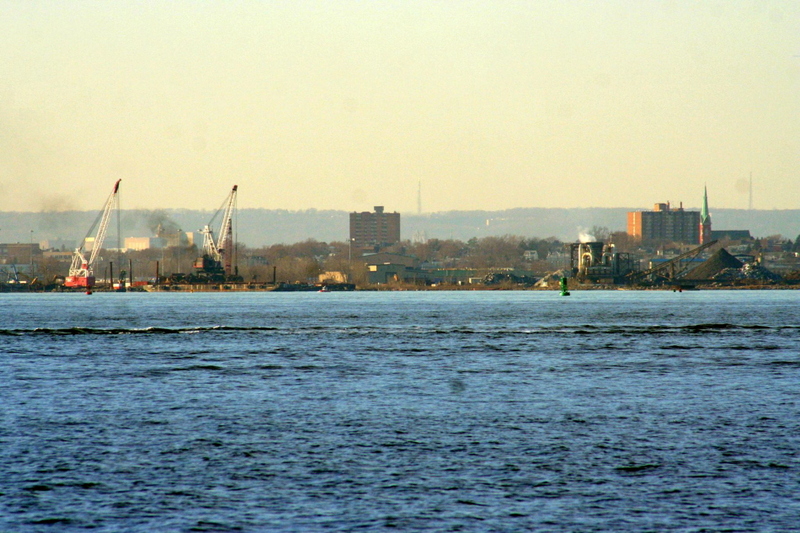 Bush Terminal is located on the east side of Upper New York Harbor in the Sunset Park neighborhood of Brooklyn. 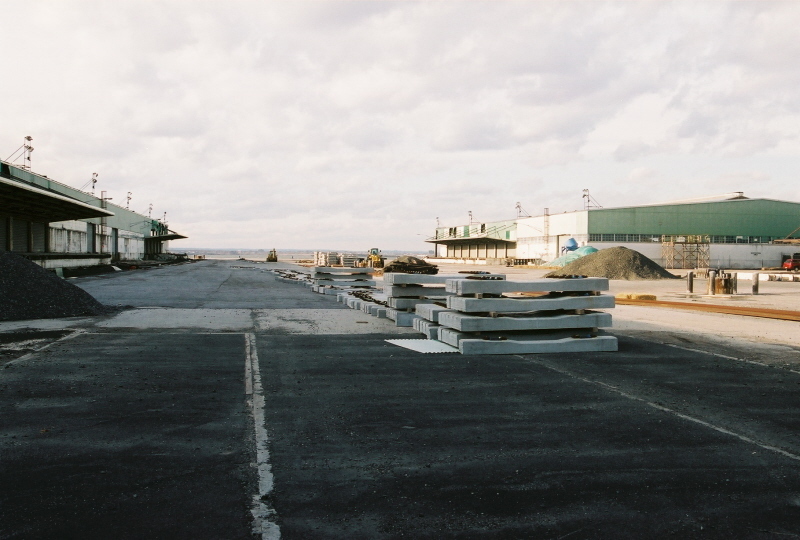 The Bush Terminal property occupies real estate from the bulkhead on the New York Harbor north to 39th Street, east to Second Avenue, south to 65th Street yard, returning west to the Bulkhead. It is strategically located directly across from New Jersey with a minimum of navigation and obstacles in Upper New York Harbor. This is predominately the reason why the Bush Terminal location has survived into the the present day, as maritime traffic will not have to navigate up the East River as it did with traffic to and from New York Dock or the Brooklyn Eastern District Terminal. 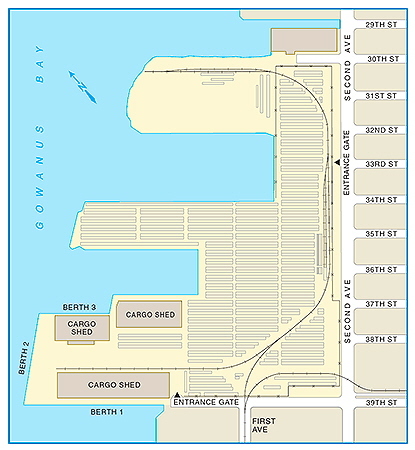 The Bush Terminal Railyard is located west of First Avenue between 50th and 43rd Streets. Several spurs branch out of the yard and run east up several side streets. The following map, which was part of a Transportation System Management Study; is not totally accurate in the representation of current existing and operational New York New Jersey Rail trackage, but serves as a general representation of the Bush Terminal Property layout. 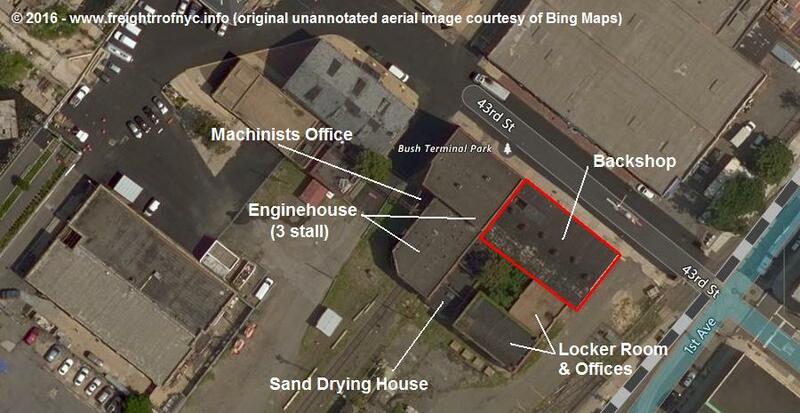 The Bush Terminal enginehouse is located at the northwest corner of the yard, off of 43rd Street. 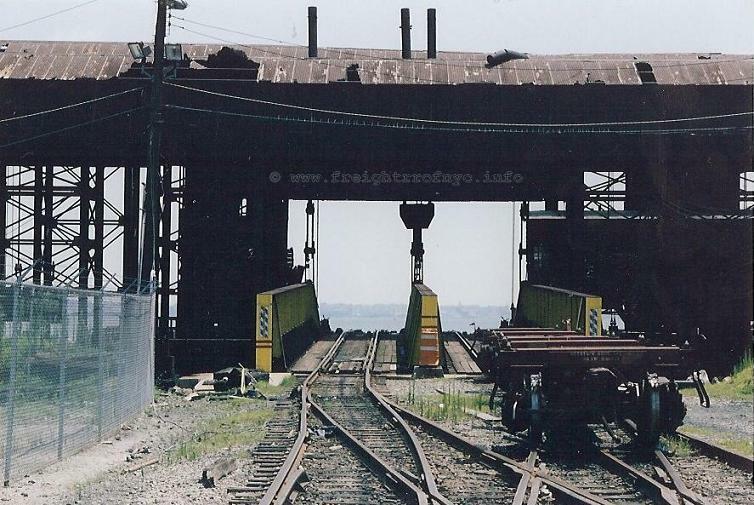 However, the structure has been condemned and is no longer used for the storage of locomotives, and administrative offices have been relocated to Greenville Yard, NJ..
To get into the north end of the Yard, you must access it through the 43rd Street entrance. This is a guarded entrance, and requires business on premises to access. The structure is three tracks wide, of brick construction, and had offices in the rear (north) upstairs portion. To the right (east) of the #3 door, is a small office / workshop. A couple of tracks did pass along the west wall of the enginehouse to access a service alley running parallel to and between First Avenue and the Bulkhead. 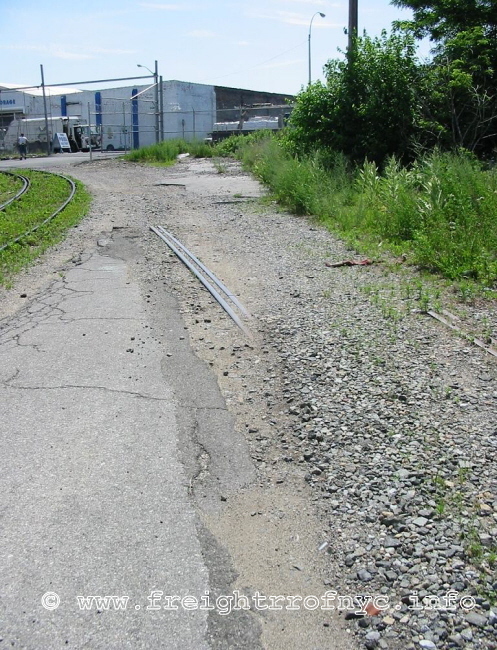 These tracks have now been "cut" and rail service is no longer possible to the industries in the yard and north of the enginehouse. As stated above, this structure is condemned. 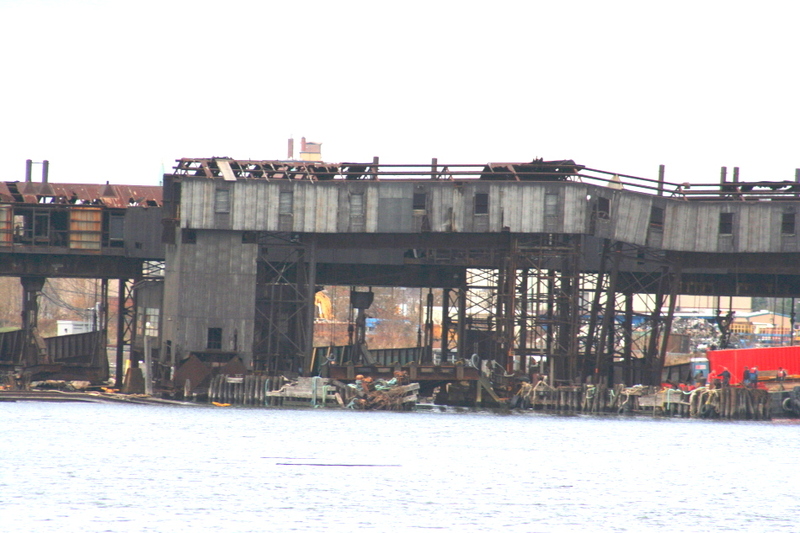 On 07 April 2011, it was learned that this structure is NOT slated for demolition as previously stated here. At the present, the plans are to keep the structure and when funds permit, renovate or reconstruct to bring the structure up to code. On 01 June 2016, the backshop collapsed and was subsequently demolished. The event was covered in the broadcasts of many of the New York area news stations. The area bounded by red was the old Bush Terminal backshop, that collapsed on 01 June 2016. 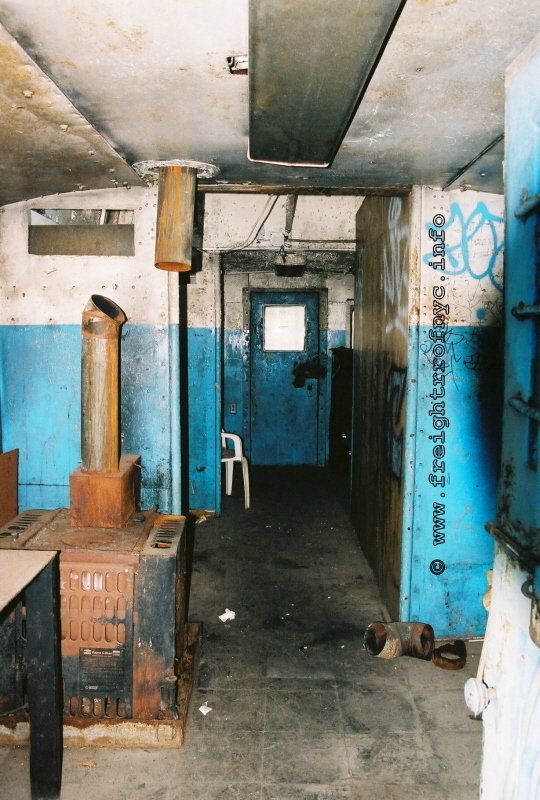 The track at the bottom left corner runs north alongside the west wall of the enginehouse into a service alley. The track directly in front of the caboose is the enginehouse lead. The track at the bottom runs behind the photographer through the north track entrance gate and onto First Avenue. 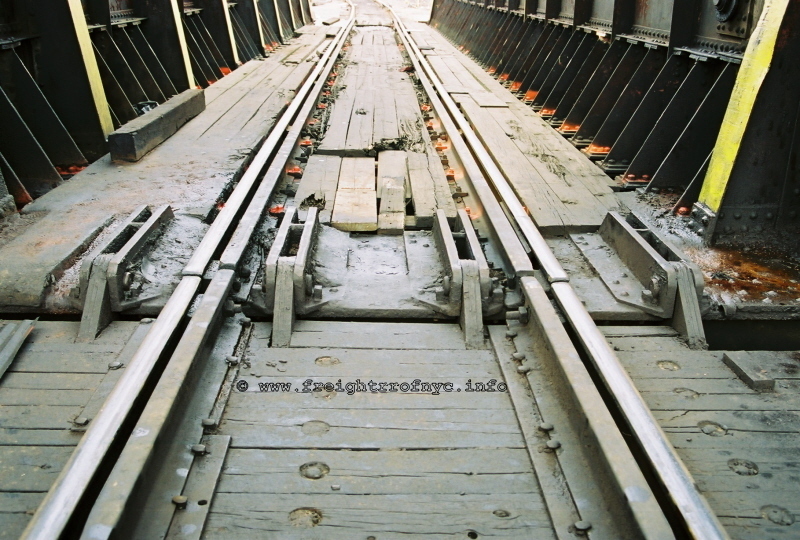 The right track runs onto the subway car unloading ramp. The left track is the yard leads paralleling First Avenue. but have their turnouts located on the west side of First Avenue just inside the fenced property line of the Yard. the customary switchstand set off to the side of the track. So a "low profile between the points" switch throw is used. 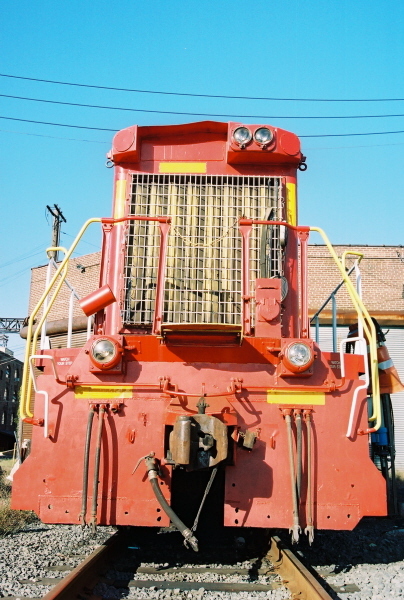 for locomotives to access the center track of a carfloat. 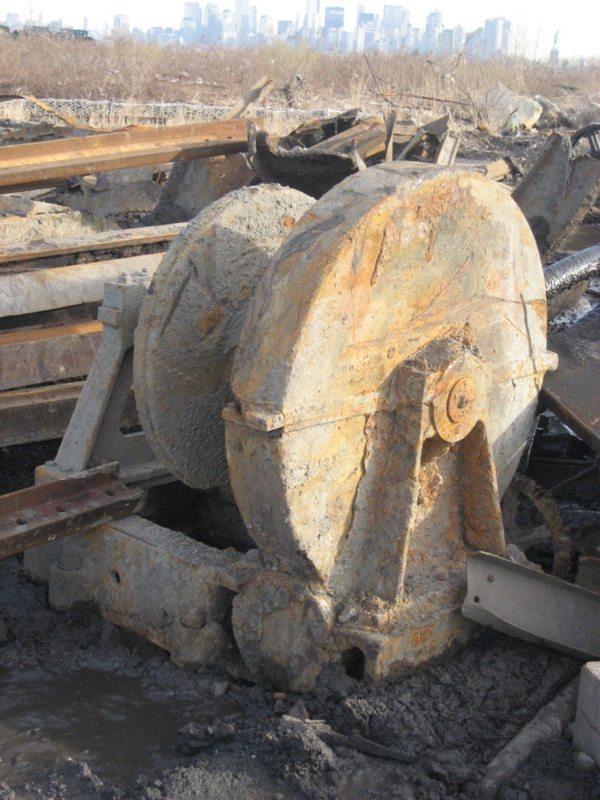 This is a Bethlehem Steel model 1222 ground throw. 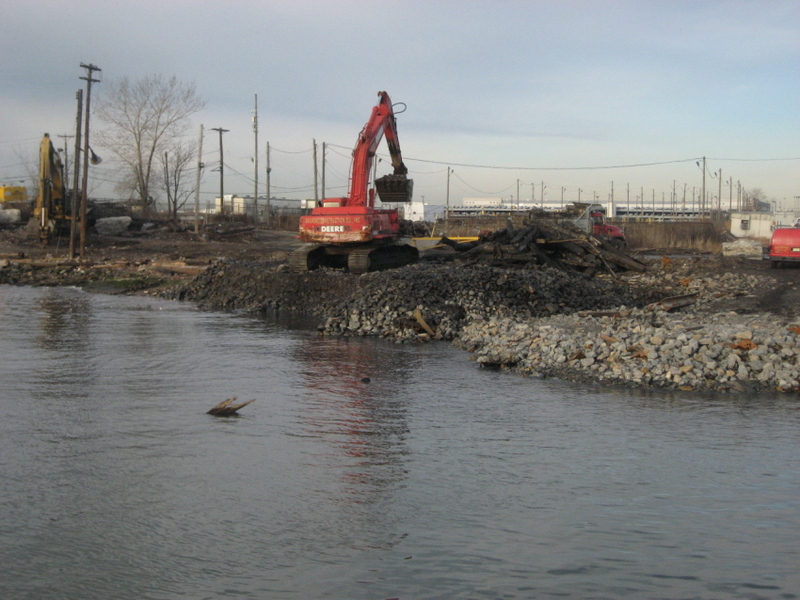 As of April 2012, carfloat service to Bush Terminal float bridges was discontinued. 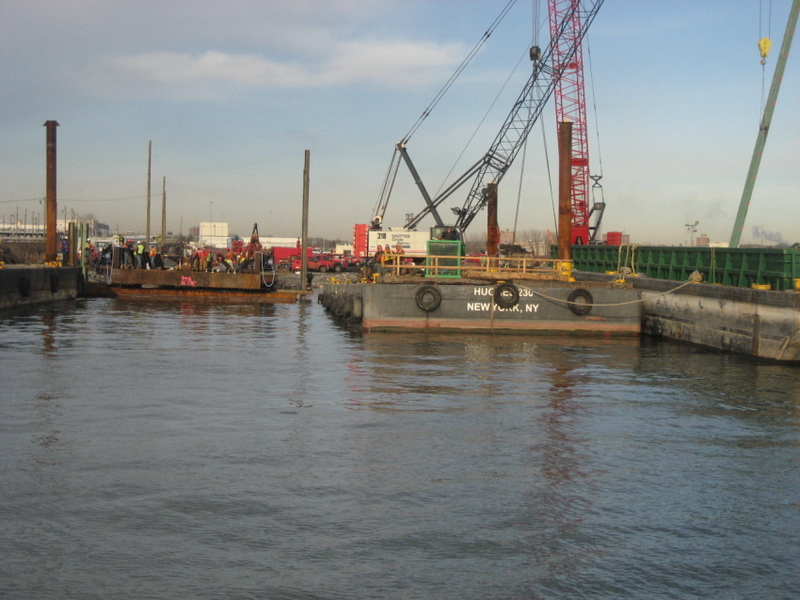 The eastern terminus for carfloat service for Brooklyn has been moved to the Bay Ridge / 65th Street Yard. 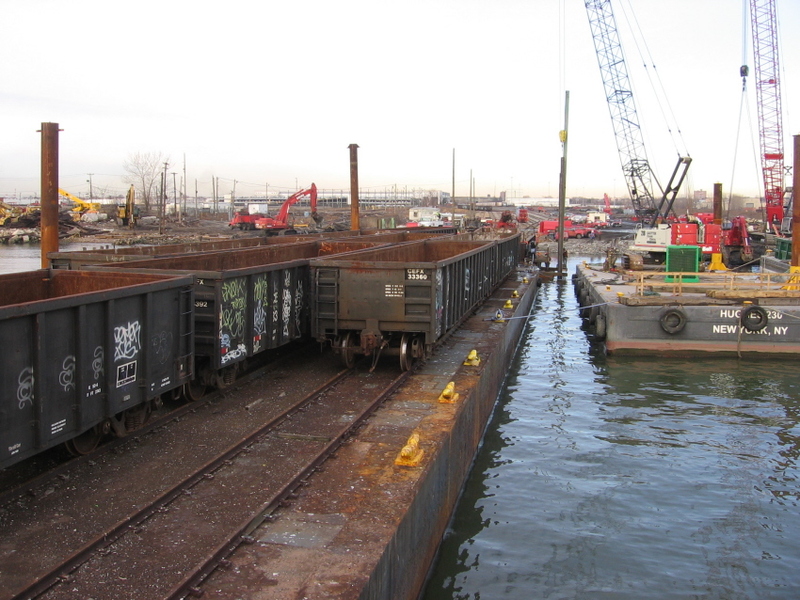 At the foot of 50th Street and at the southwest corner of the railyard, the Bush Terminal property hosts two carfloat aprons (also commonly referred to as float bridges) that the New York Cross Harbor Railroad utilizes for carfloat service to Greenville, New Jersey. : "Bush 1", (the southern float bridge) and "Bush 2" (or the northern float bridge). Both float bridges are located at the foot of 50th Street..
Only the Bush 2 (the northern float bridge) is in service. Bush 1 is sunk, and remains so due to a leaky pontoon. Both float bridges are of pony plate girder construction. 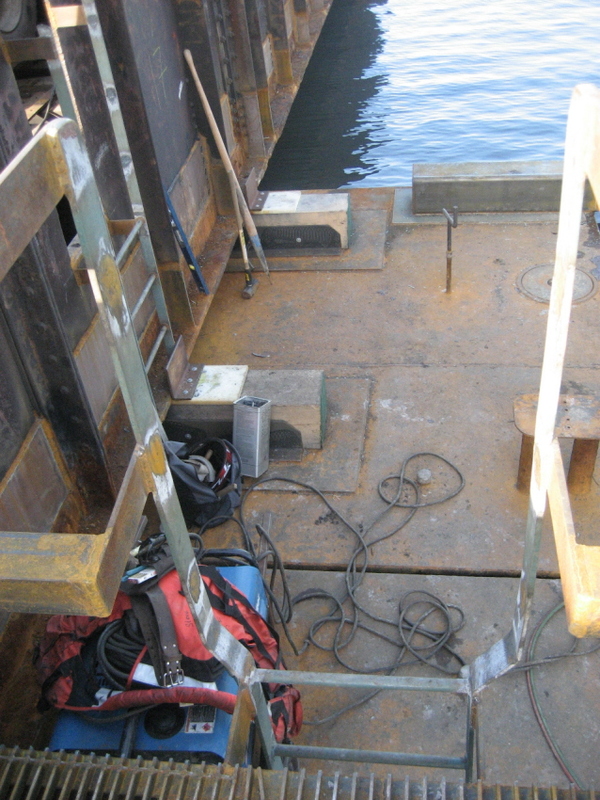 In the summer of 2007, a long overdue and necessary repair, in the form of a brand new steel pontoon was constructed for Bush 2 by the Great Lakes Shipyard of Cleveland, Ohio. 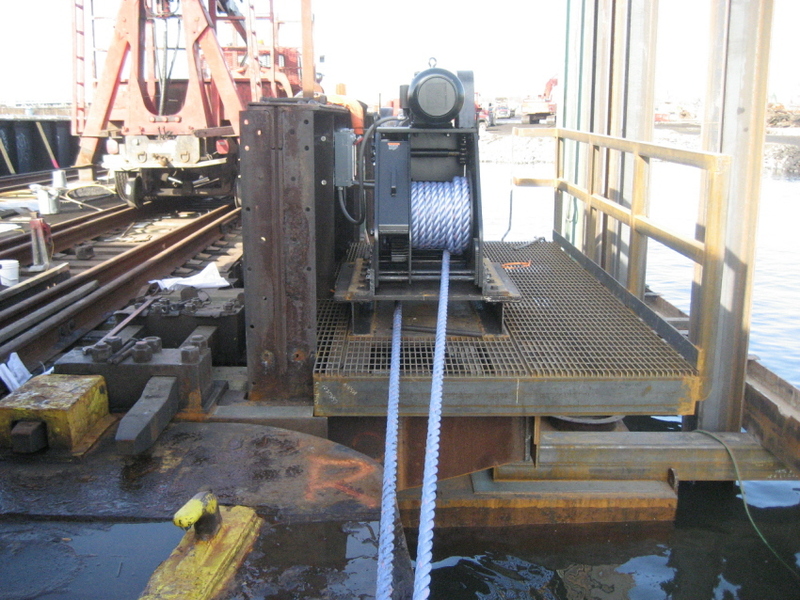 This new pontoon, constructed in two parts (two separate air chambers) was transported by rail in a disassembled state to the rail yard at Greenville. 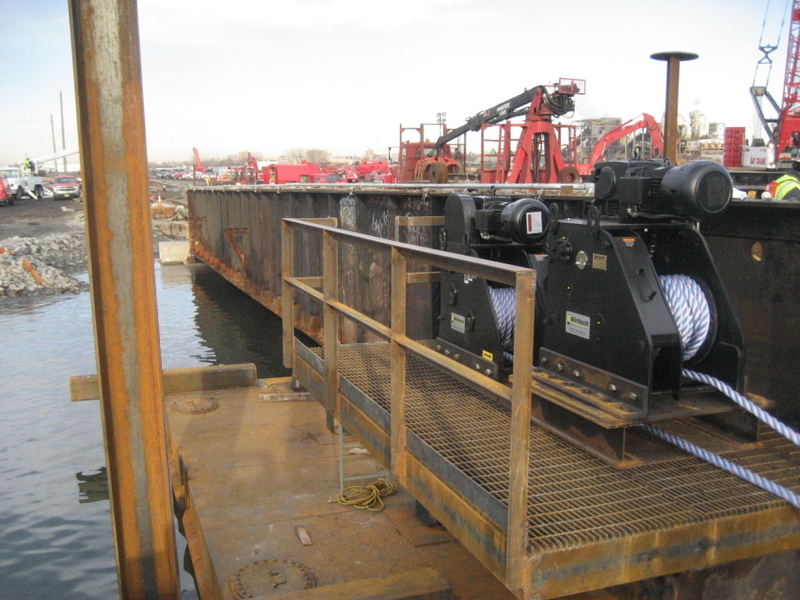 The pontoon was assembled in the water and floated across to the float bridge in Brooklyn, where it was installed. After rebuild with new deck and pontoon. "Bush 1" in foreground (sunk) "Bush 2" in background. Bush 2 lead on right, and curves into Bush Terminal Yard. New York New Jersey Rail like its predecessor, can take advantage of two interchanges in its Brooklyn side of operations, but only one is actually taking place. 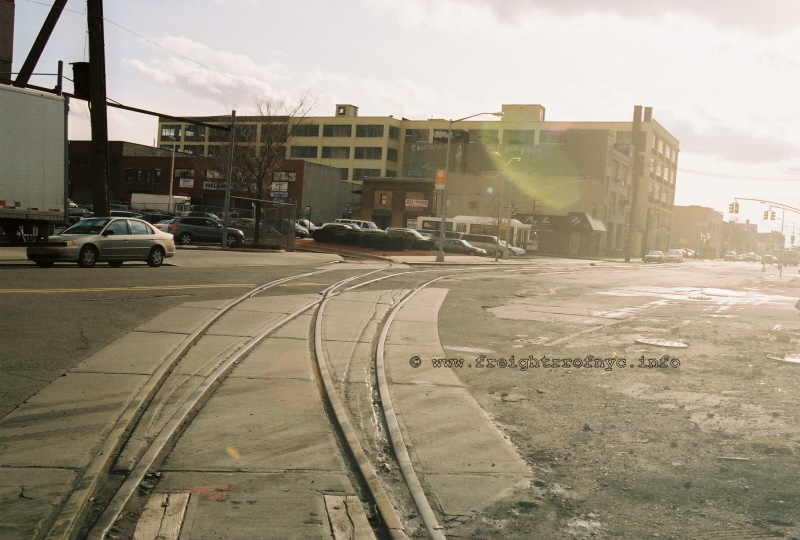 The southern interchange point, with the Long Island Rail Road (and subsequently the New York & Atlantic Railway), is located at the former New York, New Haven & Hartford Railroads / Long Island Railroad 65th Street / Bay Ridge Yard. This interchange also provides access to the main land rail network via the Bay Ridge Branch to Fresh Pond, over the Hell Gate Bridge to the Bronx, and points north. 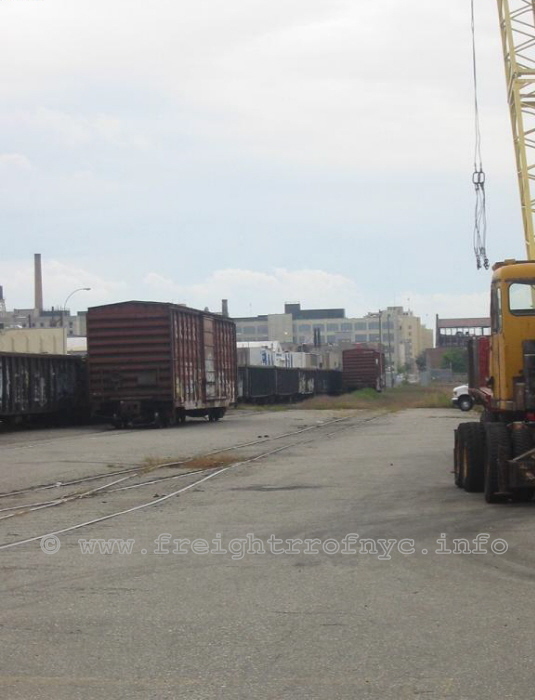 Currently this 65th Street Yard is administered to and switched by the New York & Atlantic Railway, and at the present time no freight traffic from New York New Jersey Rail is routed for this destination. 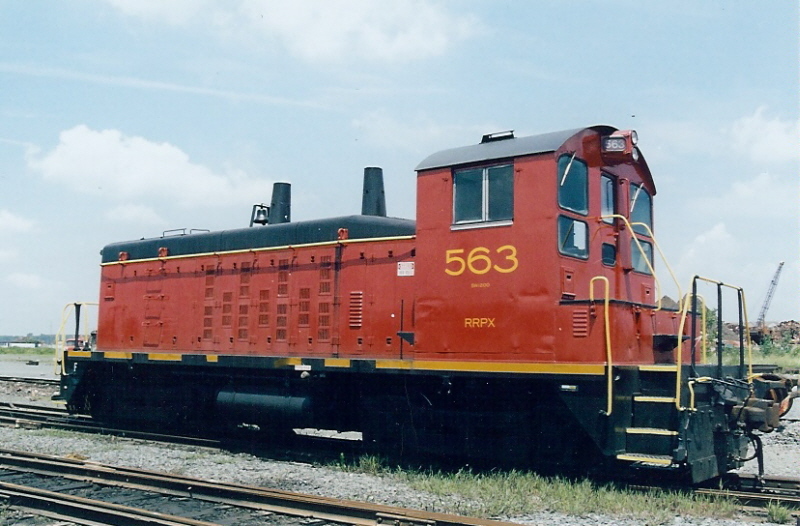 An in depth chapter on the 65th Street Yard can be read below. The northern interchange point is located at 39th Street and Second Avenue, and is in conjunction with the South Brooklyn Railway, a freight hauling subsidiary of the New York City Transit Authority, and part of the Metropolitan Transportation Authority. Currently, no freight is received or transferred to the South Brooklyn Railway at this time. 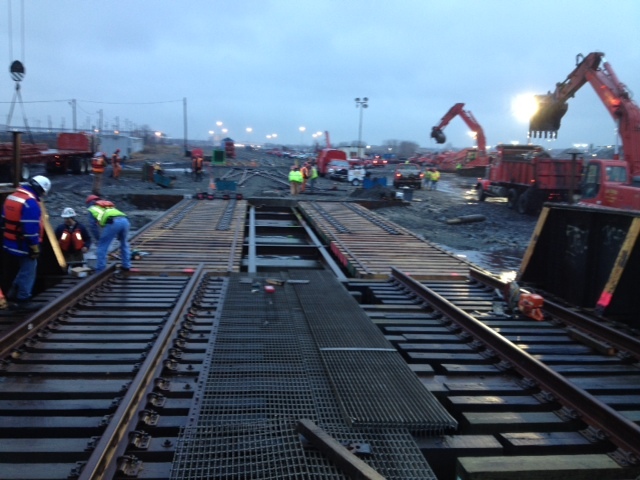 This may change with the completion of ongoing track and property reconstruction at the 39th Street Yard location. 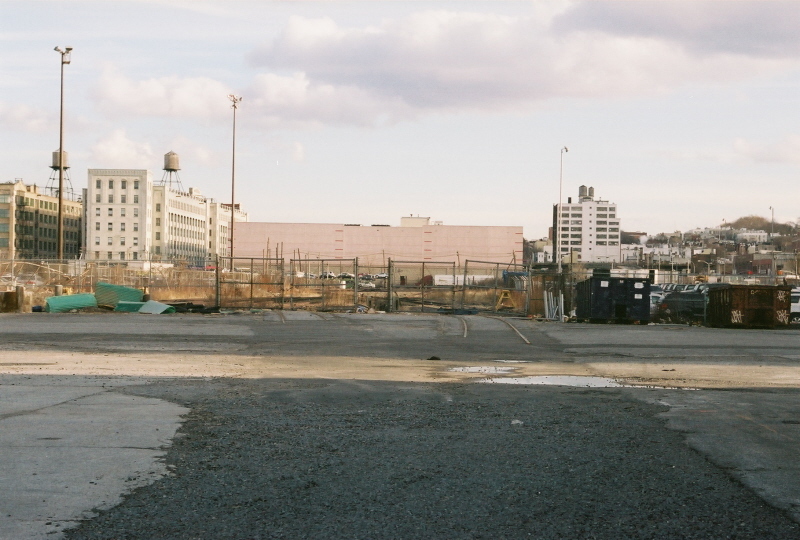 A separate chapter on the 39th Street Yard can be read below as well. Left track is South Brooklyn Railway and leads around CostCo Wholesale Club. Right tracks is NYNJ trackage down Second Avenue. South Brooklyn Railway 39th Street Yard is behind photographer. 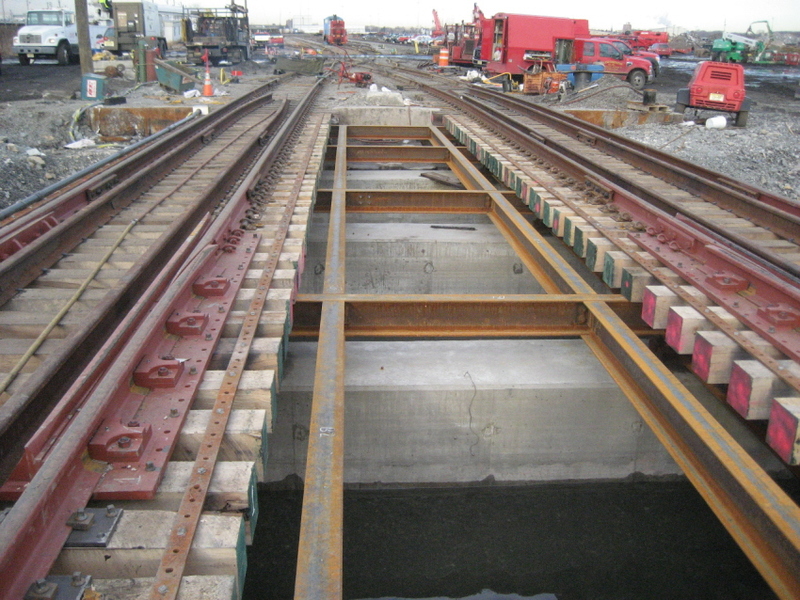 Note the flange score marks in the concrete paralleling the NYNJ track. Something derailed here! What makes Bush Terminal unlike any other; is that the trains still run on trackage and routing as Bush Terminal's trains had done since 1905: right down the middle of public streets and almost every day. This street trackage is comprised of "girder" rail in the northern portion of trackage (the remaining un-rebuilt sections). 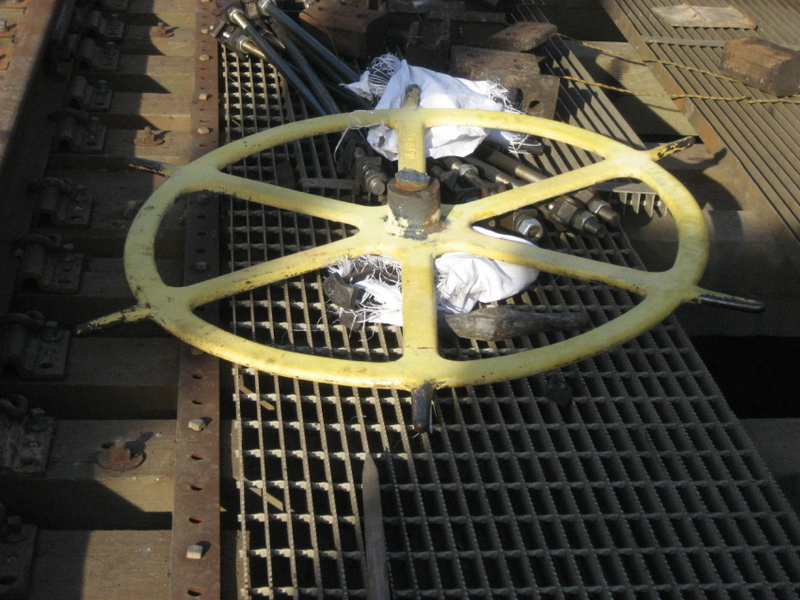 Girder rail is a special trackage designed for street running, that has a inside guard rail already cast / extruded as part of the rail to protect the flanges of the car wheels, and to prevent derailments. This is the same type of rail to what streetcars and trolleys use to this day. Please see the Glossary for an illustration of this type of rail. 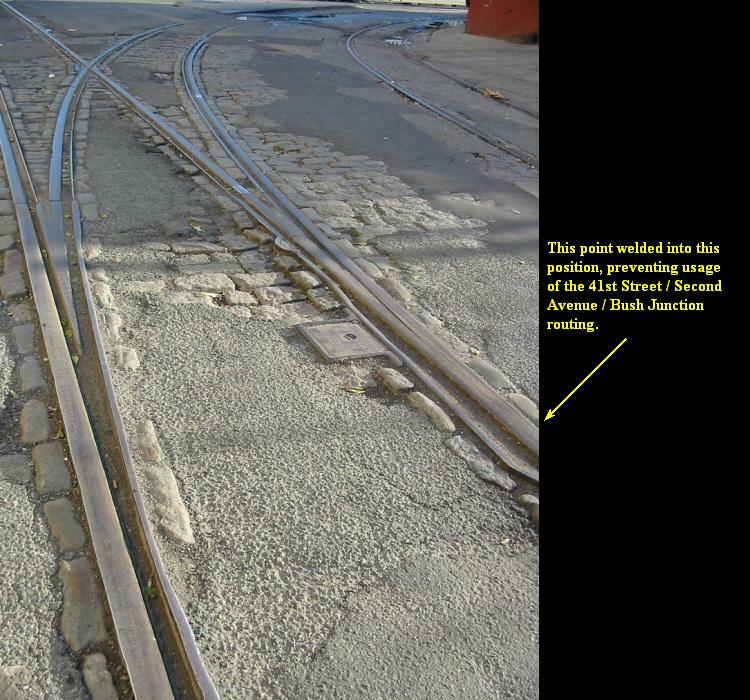 In some locations these tracks are still set in the original cobblestone pavers (correctly called "setts") dating back to 1905. However, this is not expected to last much longer as the entire area is undergoing major redevelopment, with thoroughfares in this area being reconstructed using modern materials (asphalt & concrete). 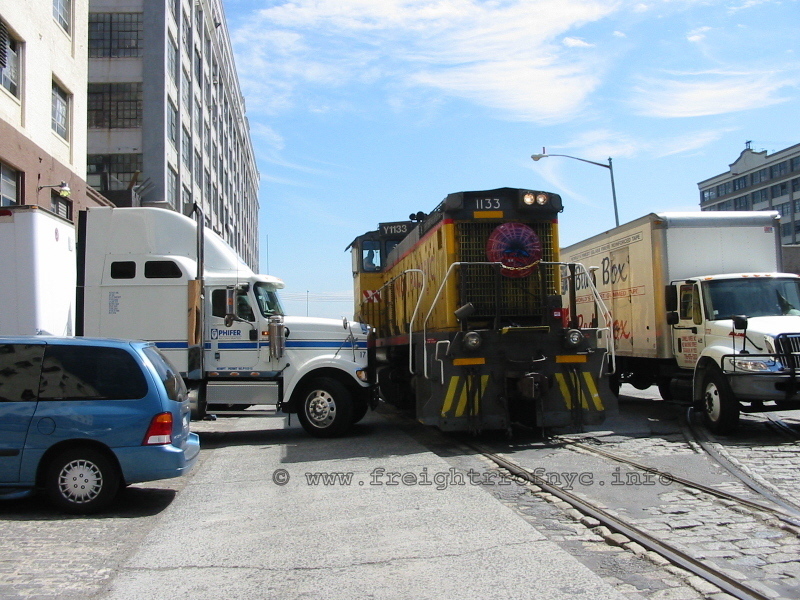 As most of the trackage used by New York New Jersey Rail is located in the street, it does not take a stretch of imagination to realize the inconveniences encountered with vehicular traffic and rail operations sharing the same space. Subway car ramp on left edge of photo. 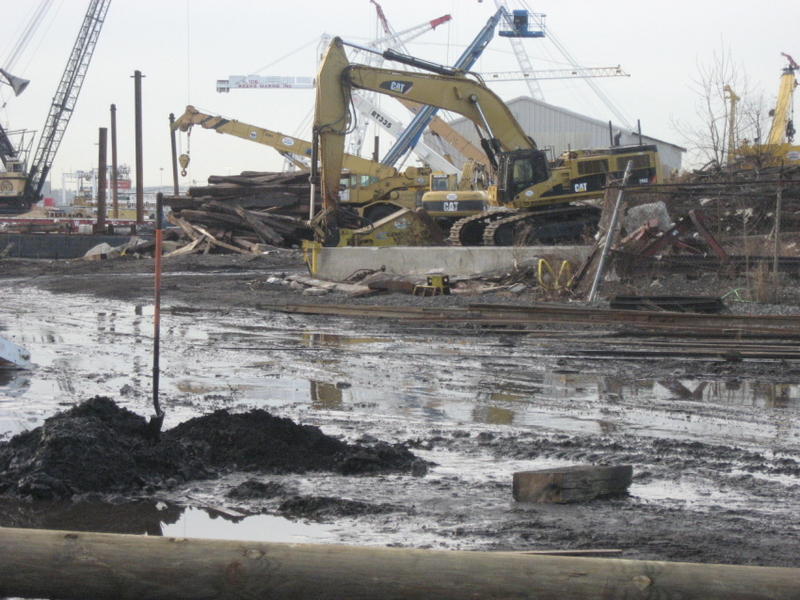 This is the northeast corner of the Bush Terminal Yard. Left track accesses an industry. The southbound single point (tongue & nape) track turnout. Right track leads east on 41st Street. Left track leads up First Avenue to Yi Pin Food Products and soon to be the new First Avenue access to the 39th Street Yard. Looking east. The two tracks are the "main line" curving east onto 41st Street from First Avenue. (to the left of the blue & white sign) on the corner of the building! The two tracks are the "main line" curving east onto 41st Street from First Avenue. The gouged bricks can be seen in silhouette on the corner of the build just above the left traffic cone. The "main line" up 41st Street can be made out in front of the van. The segment of track behind the photographer curves into Yi Pin Food Products. eliminate the 41st and First Avenue and 41st and Second Avenue curves. This is the Plywood specialties spur up 41st Street can be made out in front of the van. Note the severely damaged guard lip on the outer rail due to heavy commercial traffic and snowplows. 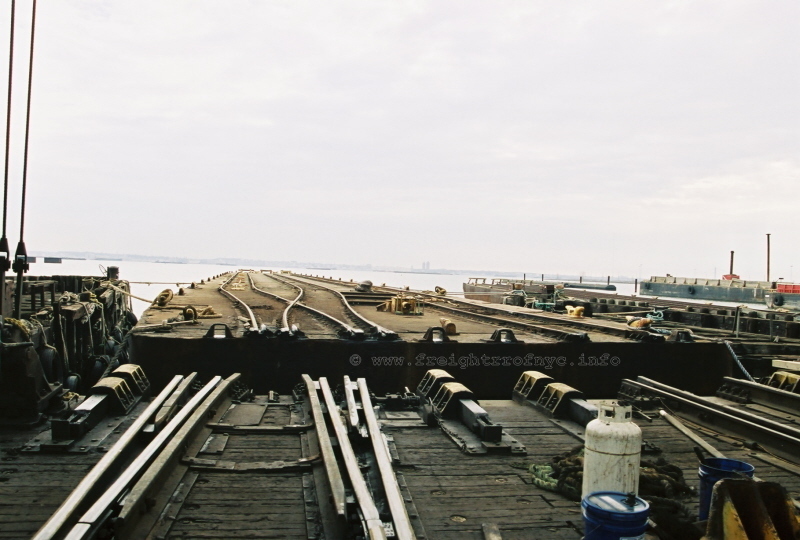 The following images of trackage, although connected to active trackage operated by New York New Jersey Rail, did not see rail traffic under New York New Jersey Rail ownership. The images are included here fore historical reference. Note how the track jogs a little to the right before curving back to the left and ducking under the corner of the warehouse. 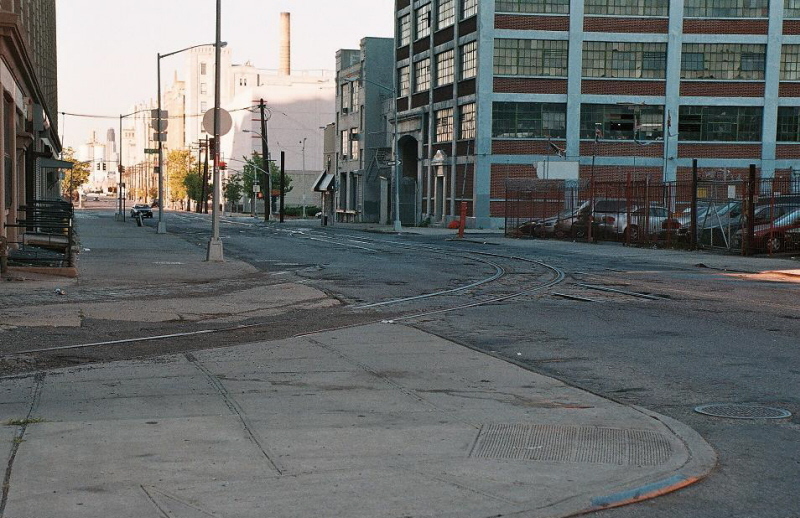 A spur once split off the right track and crossed Second Avenue to service industry on that block. Looking northeast. The turnout for the 41st Street spur can be seen in the bottom right corner. Straight track in foreground is spur that crosses Second Avenue through diamond in image below. 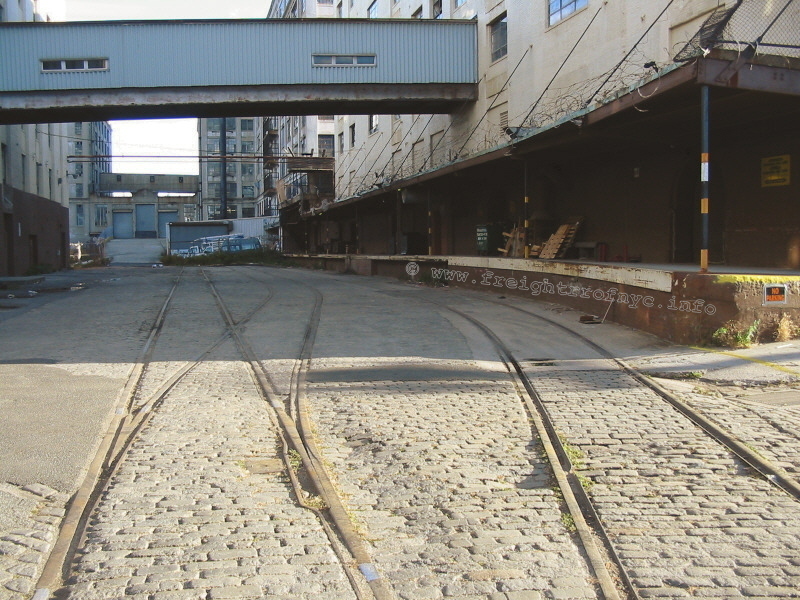 The curved trackage heading towards right edge of image "ducks under" the corner of warehouse. Looking east. The vertical track is the Bush Terminal spur. 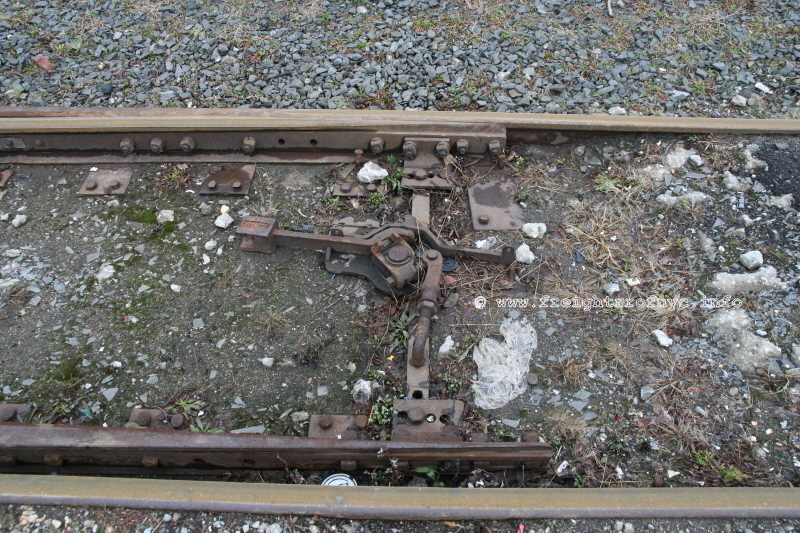 The horizontal track is former street car trackage. As of May 2010, both of these diamonds have been completely paved over. On the northwest corner of 41st Street and Second Avenue. 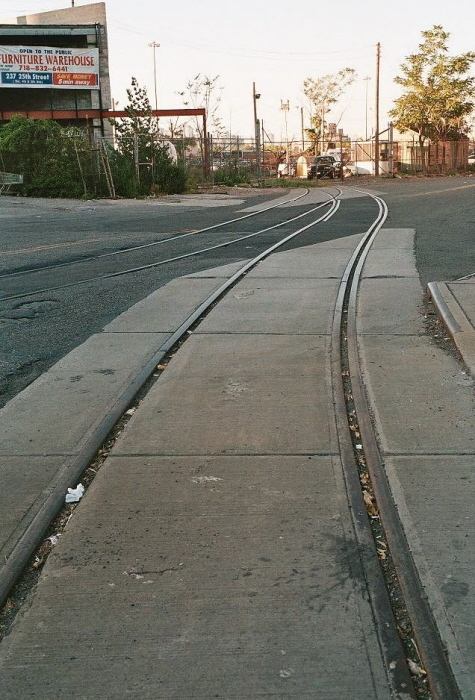 Note how the inner track is out of service, with asphalt paving over rails. Only the outside track provided service. and are realigning down the center of the Second Avenue. The straight track heading to bottom of photo is street car trackage. 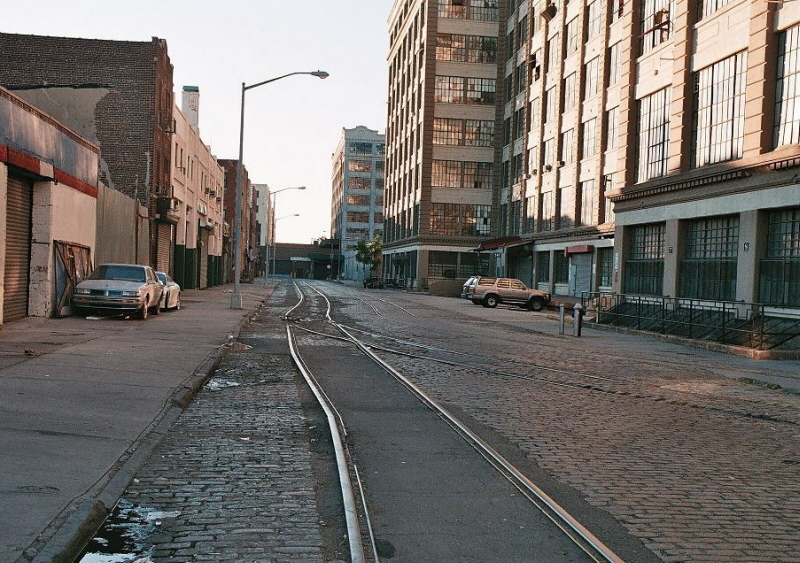 The track from left edge is the Bush Terminal / New York New Jersey "main line" along Second Avenue. The track from bottom center is the South Brooklyn Railway line. Track behind photographer runs around the Costco. Please note as of April 2012, all rail service formerly taking place within the Bush Terminal Yard has been relocated to Bay Ridge / 65th Street Yard. 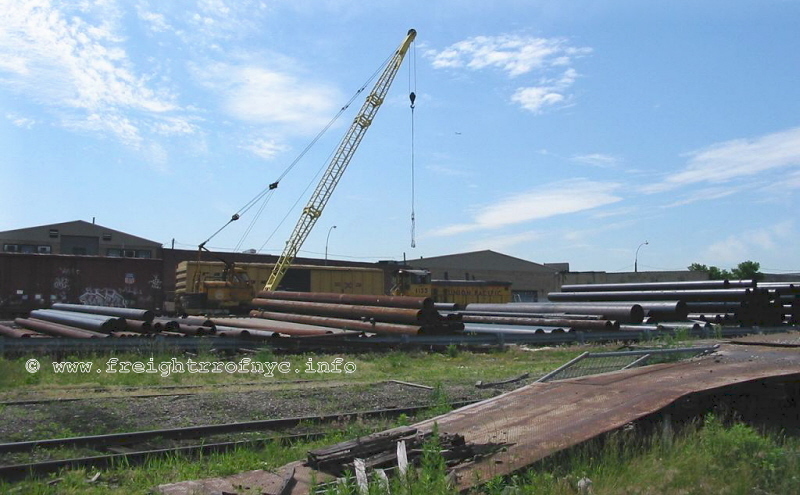 Cropsey Metal & Recycling Bush Terminal Yard scrap metal 199_? - 2005? Interdynamics shop alley R134a refrigerant 198_? - 2006? 39th & Second track material 1983 - 2006? Safety Kleen Bush Terminal Yard waste oil 1993 - ? 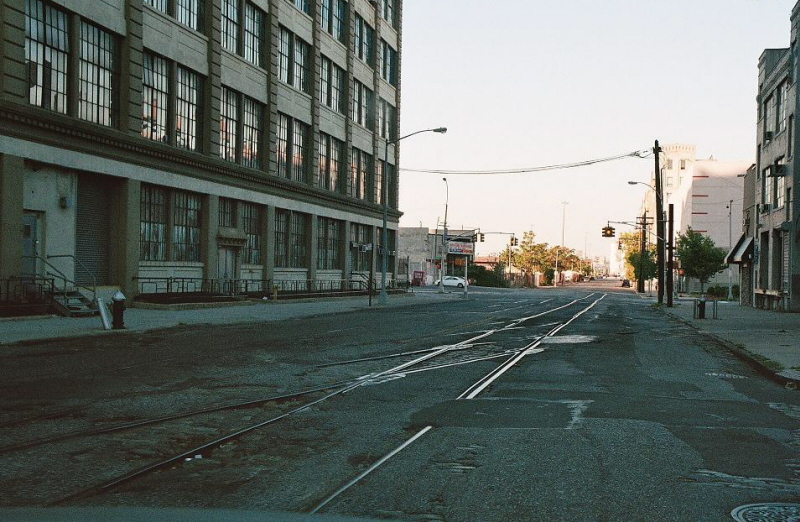 Therefore since its inception in 2006, it is not believed that any traffic destined for South Brooklyn Railway has occurred during the tenure of New York New Jersey Rail. With the reconstruction of the South Brooklyn Marine Terminal (39th Street Yard) and a new yard access via First Avenue, this may (and hopefully) change. 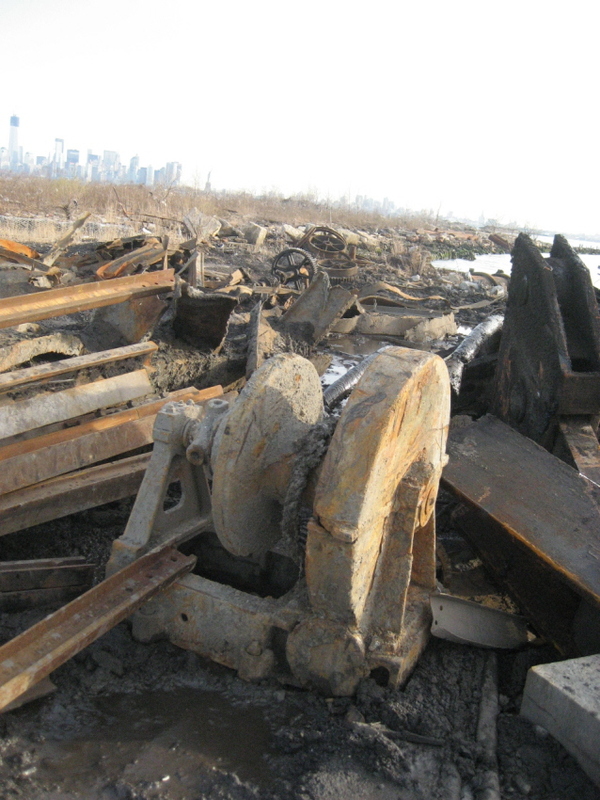 For more information on this railroad and operation please click here: South Brooklyn Railway. This customer is north of 42nd Street (one block north of the enginehouse), and received R134A refrigerant for distribution. This customer is no longer in occupancy. Furthermore, the track to this location has been "cut" (disconnected) adjacent to the enginehouse (behind photographer in photo below) thereby preventing future rail service tio this siding. 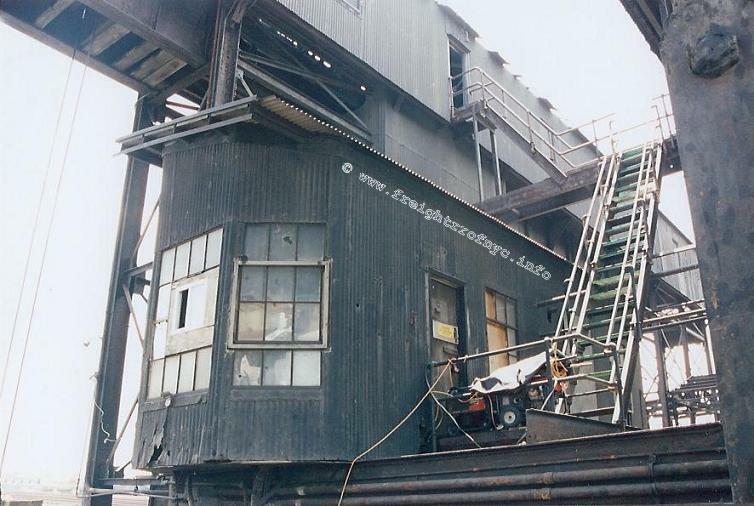 Located at 40th Street & First Avenue, this customer (no longer in presence) received "centerbeam" bulkhead flatcars loaded with plywood, as well as boxcars of building materials. As of circa 2003, a different customer, Yi Pin Food Products; utilizes the former Plywood Specialties siding and receives boxcars of bagged rice. For those of you who are fans of Chinese food (yum! ), the little packages of duck sauce, hot mustard and soy sauce come from this distributor! "The duck sauce you put on your eggroll today, was probably shipped via NYNJ Rail yesterday!" At the present, it is unknown if Yi Pin receives the bulk ingredients for the sauces, mixes and packages the finished product, or merely distributes pre-packaged sauces at this location. Located at 50th Street & First Avenue. A spur siding was constructed, but was rarely used. 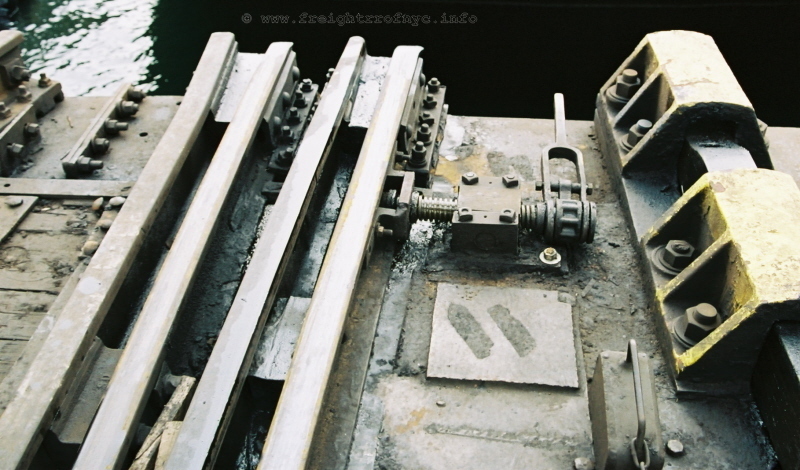 When constructed, this siding it was designed with very sharp radii, and it is difficult for modern length freight cars to negotiate the curve. 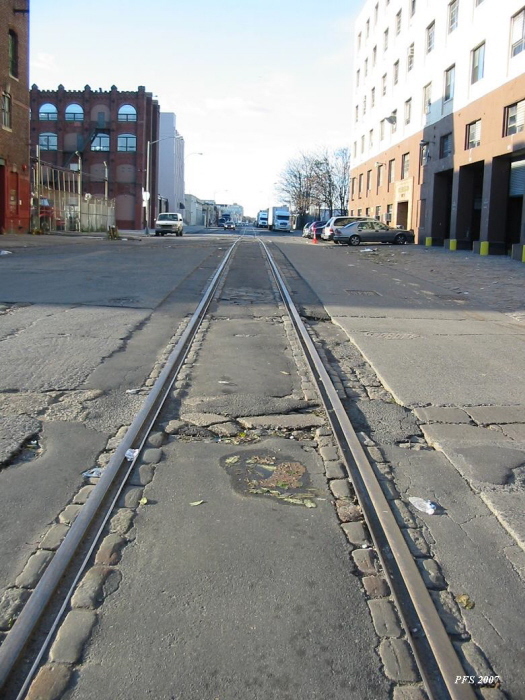 Located on 47th Street and Second Avenue, this track would cut through the corner of the junk yard on the corner of 47th Street. The track would then head east and cross Second Avenue and enter into a building. This customer received plastic pellets for injection molding, and it is believed this firms' primary product was plastic bags. 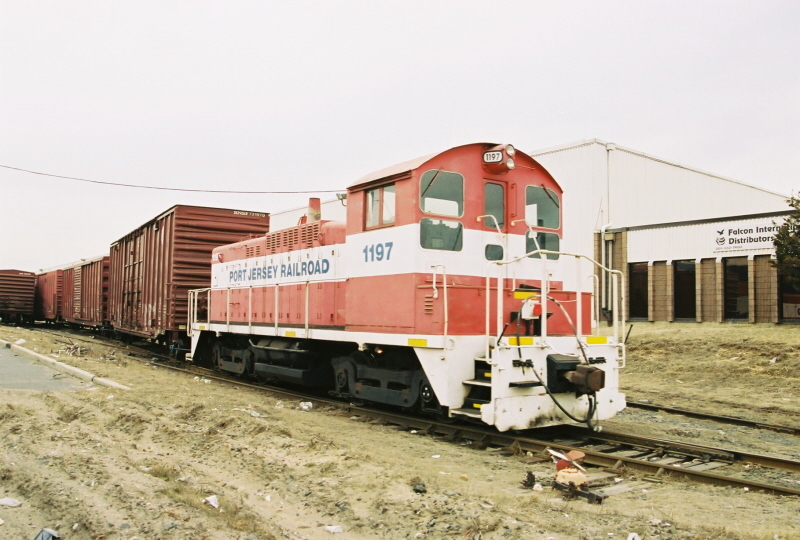 Service to this siding ended on an as yet unknown date, and this customer would then draw off its load in the Bush Terminal. 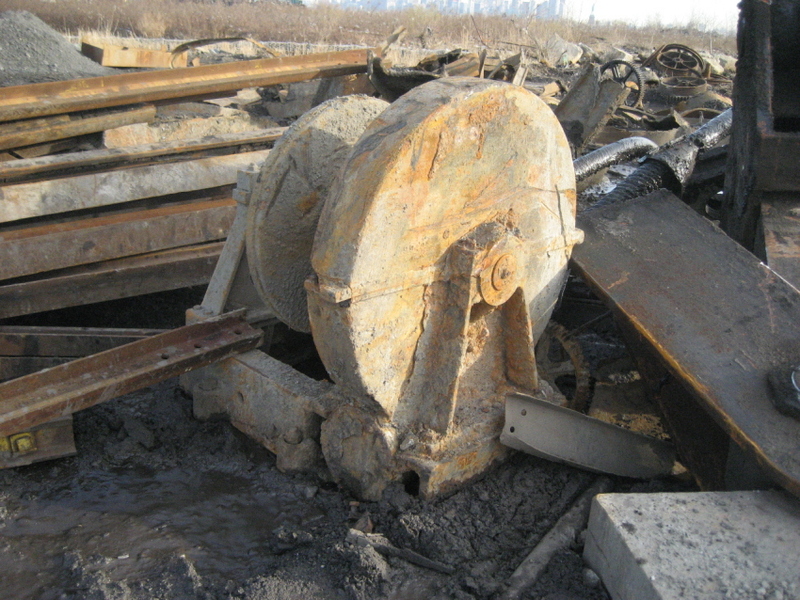 Davidson Pipe used to receive gondolas of pipe via New York Cross Harbor Railroad which would place the cars in the South Brooklyn Railway's 39th Street Yard (between First & Second Avenues). 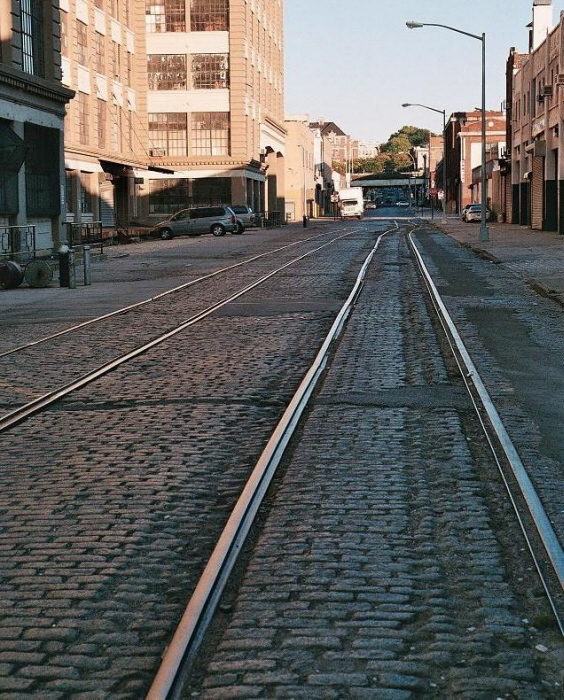 Then, the South Brooklyn Railway would move the gondolas from their 39th Street Yard into Davidson's Pipe Yard located across Second Avenue between Second & Third Avenues. In 1994, Davidson Pipe downsized their operation and sold their property to Costco, the wholesale club. Davidson would relocate their offices to 5002 Second Avenue. However, they would continue to receive gondolas and bulkhead flatcars of pipe, but these would now be unloaded within the Bush Terminal Yard. 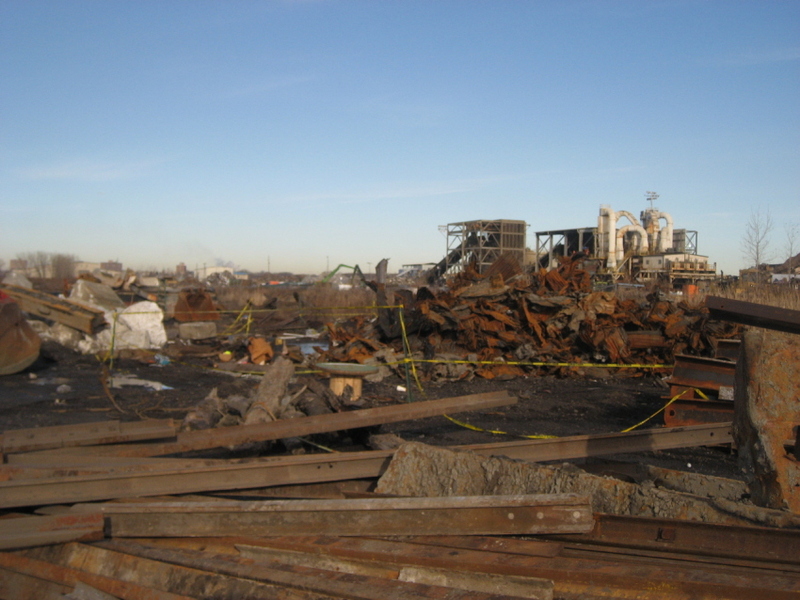 In the main yard, there are customers who receive cars at this location, including Davidson Pipe, Midwood Lumber, Franklin Polymers and Cropsey Metals. 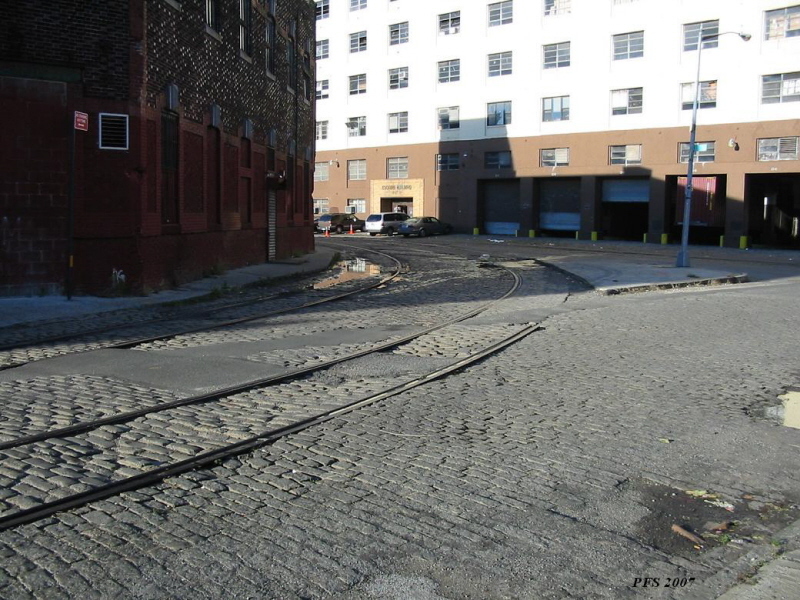 Also located in the northeastern end of the yard, is a paved ramp which was used to unload subway cars that arrived on flatcar for the New York City Transit Authority. Looking south. Note the subway car unloading ramp leading up to end of covered hopper car. 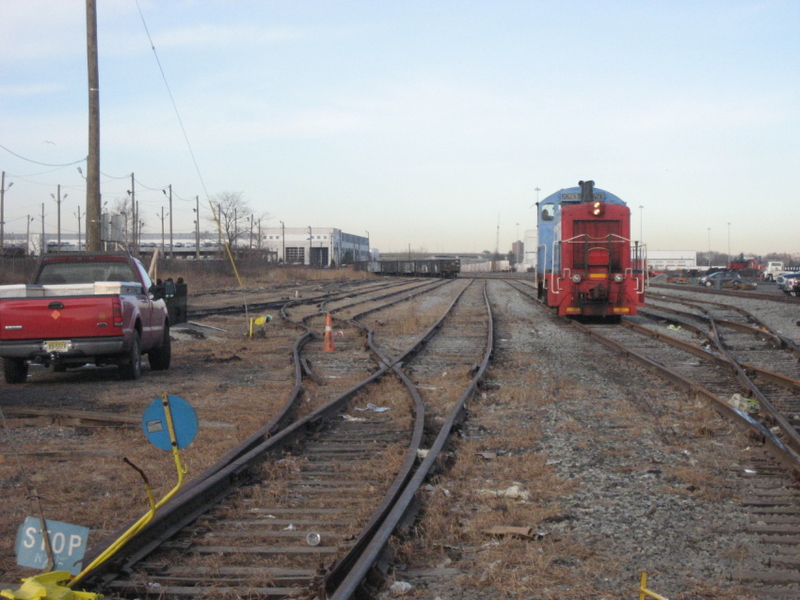 The 39th Street Yard was a property at the northern most end of Bush Terminal. 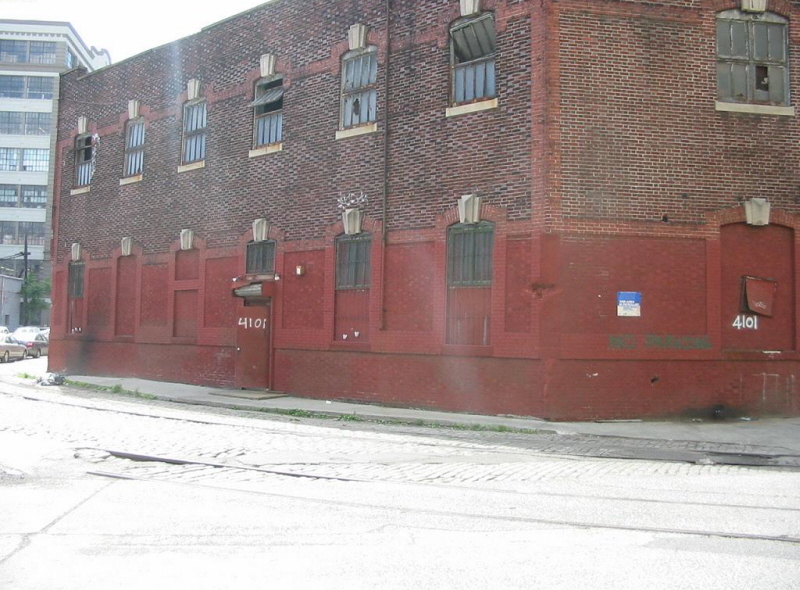 This yard was located between First & Second Avenues, and between 39th Street and 37th Streets. 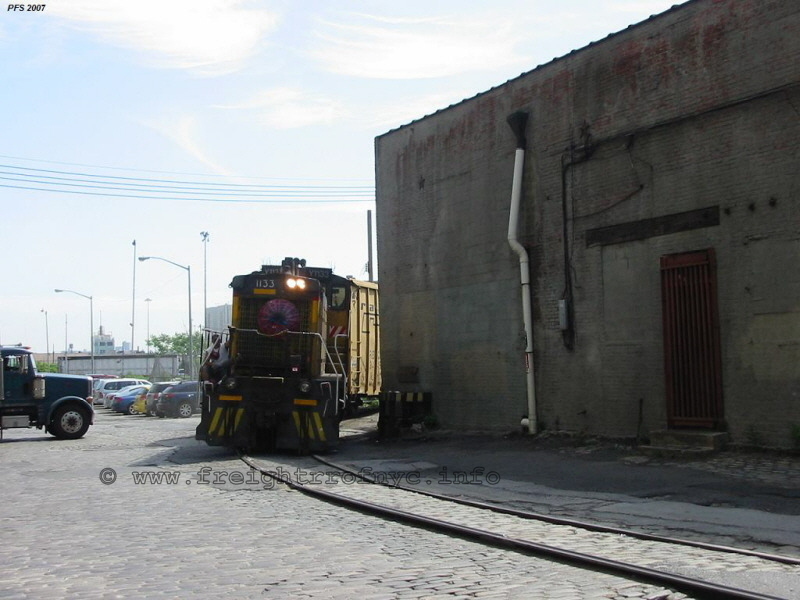 The 39th Street Yard was the interchange location for New York Cross Harbor Railroad and the South Brooklyn Railway. This location is also known as Bush Junction, a name that dates back to early Bush Terminal Railroad operations. 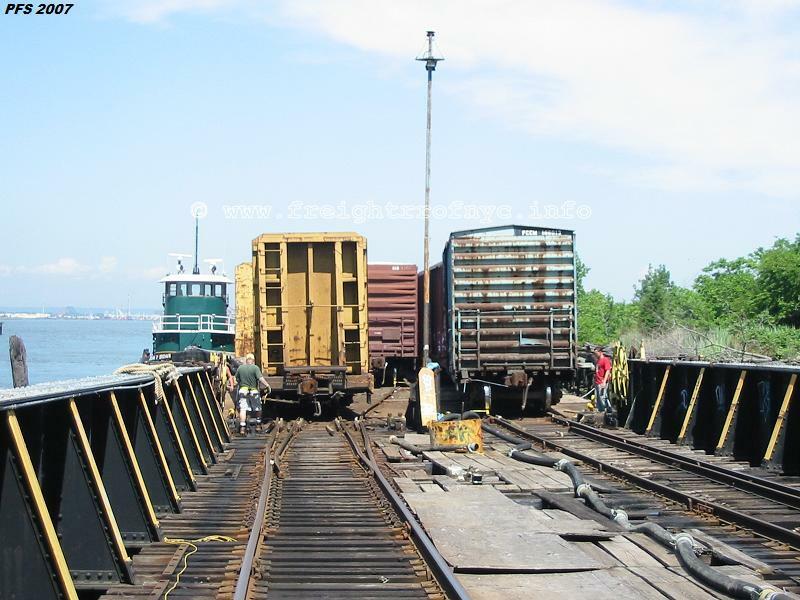 As stated earlier in the "Customers" chapter; the New York Cross Harbor Railroad transported materials much as ties, rail and other railroad related supplies to this yard, for transfer to the New York City Transit Authority. 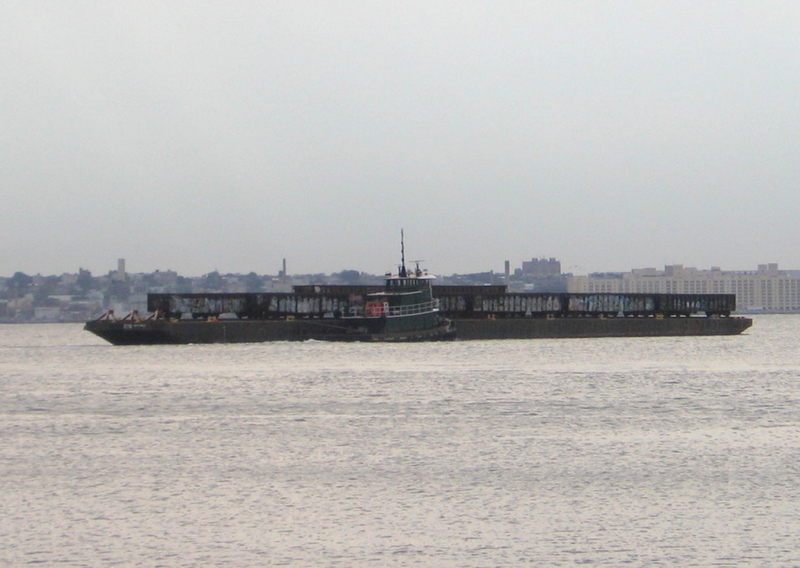 The New York Cross Harbor Railroad also placed inbound new / rebuilt subway cars just arriving from the mainland US, for transfer to the New York City Transit Authority, and hauled outbound scrap subway cars from this location for loading on a carfloat for transportation to a scrapper located in New Jersey. As also previously stated, the 39th Street Yard was rebuilt and this reconstruction replaced the old interchange switch on 2nd Avenue, and allegedly now only cars 50 feet and under can be moved here. If this is true, than most if not all subway cars are prevented from using this turnout and in short, eliminating a vital source of traffic for New York New Jersey Rail. 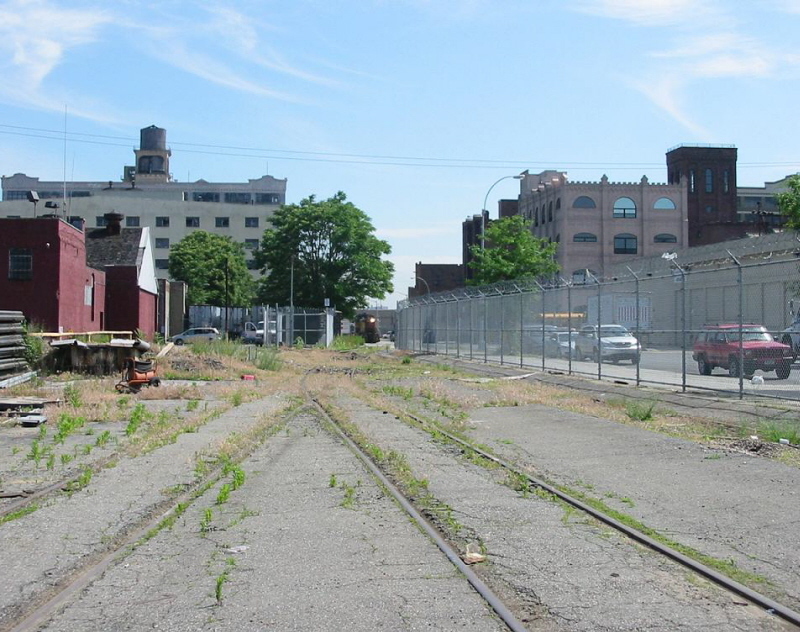 In 2003, the New York City Economic Development Corporation, in conjunction with the Port Authority of New York & New Jersey put forth a proposal to improve the rail access of the 39th Street Yard and to develop the property north of that yard. One of the proposals contained an automobile loading / unloading facility. Also proposed was a direct route from the NYNJ Rail street trackage straight up First Avenue and into the 39th Street Yard. Allegedly, the reconstruction of the curve restricted car lengths to around 50', so the average subway car (which is 70' to 80' in length) could not negotiate the curve. Whether this is fact or fiction is not known, but the fact remains that no new subway cars have transversed this trackage into the 39th Street Yard since 1994, but smaller outbound subway cars for scrapping did use Bush Junction until circa 2003. 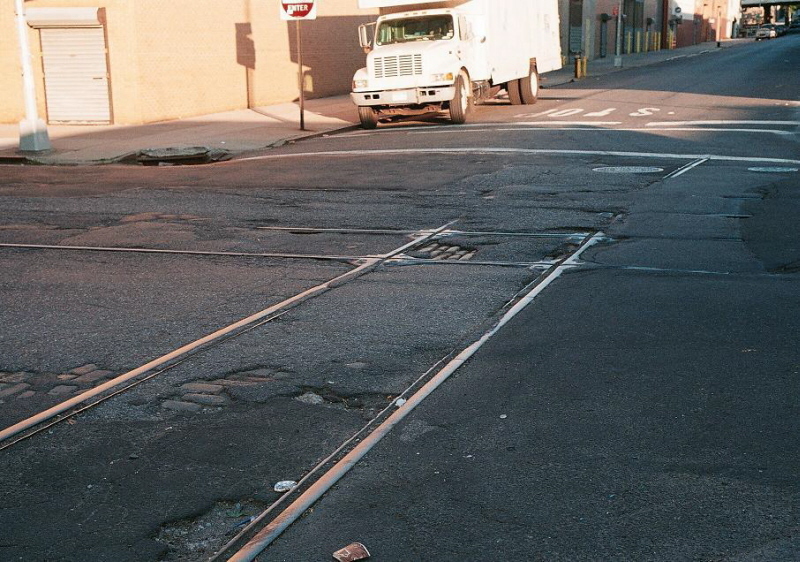 Track material shipments were unaffected and continued to use the street trackage until circa 2004. Currently the interchange is unused, as the turnout on First Avenue and 41st Street is welded into the Plywood Specialties position (straight alignment for First Avenue) thereby isolating the 41st Street and Second Avenue routing. However, as part of the current Sunset Park Revitalization Plan, new trackage and access to the 39th Street Yard is underway. This will give any traffic destined for the 39th Street Yard a straighter, more direct route into the yard, and eliminates the tight radius curves at 41 st and First Avenue, 41st Street and Second Avenue (under the corner of the warehouse) and the curve into the 39th Street Yard at 39th Street and Second Avenue (see 2007 proposal below). 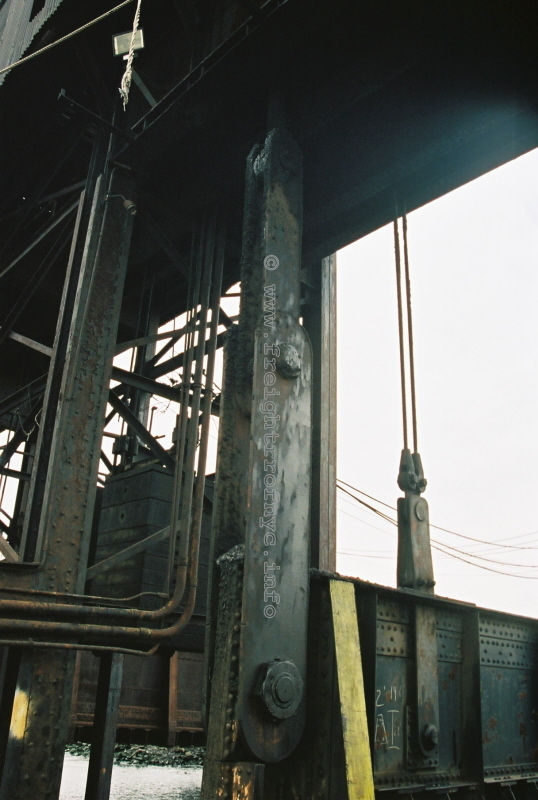 It remains to be seen, that with the construction of the new access track directly down First Avenue from 41st Street through 39th Street and into the 39th Street Yard, combined with escalating fuel prices; whether rail traffic will resume for the South Brooklyn Railway via the float bridges of the New York New Jersey Rail. 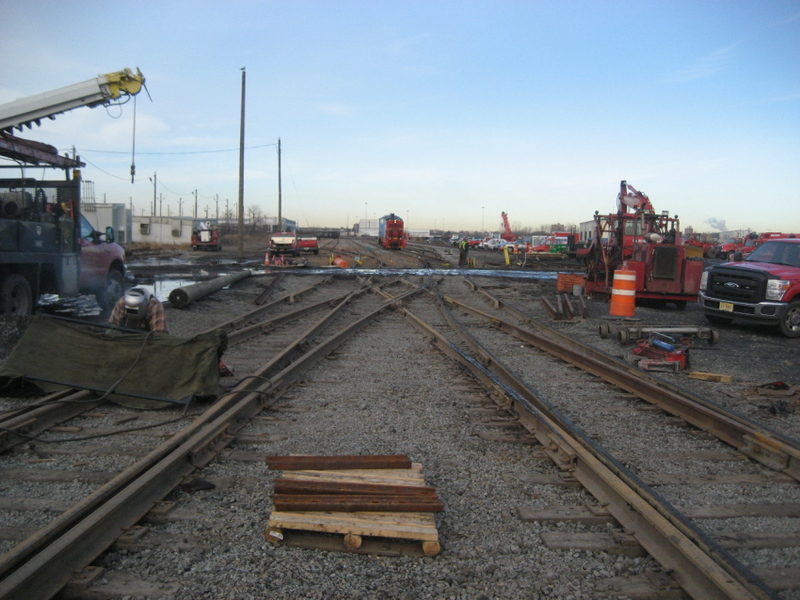 As of January 2010, reconstruction of the 39th Street Yard commenced. 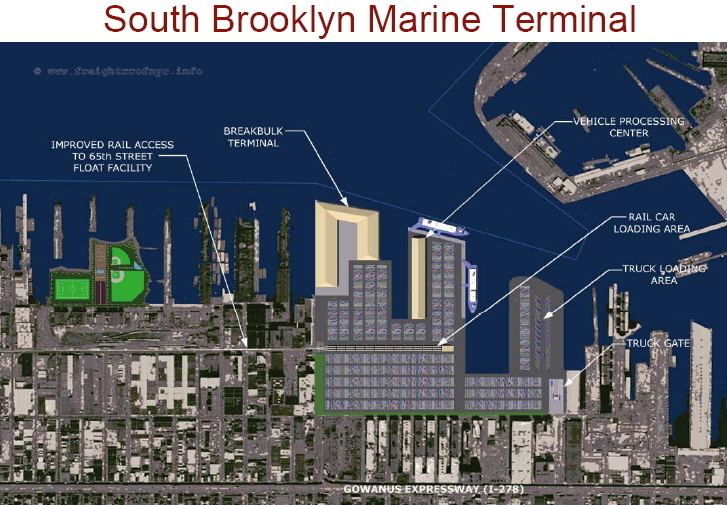 It now appears from documents located on the web, that the 39th Street Yard is now considered to be part of the South Brooklyn Marine Terminal property, which is owned by the New York City Economic Development Corporation (NYCEDC). However, operations of the SBMT property is contracted out to the Axis Group. 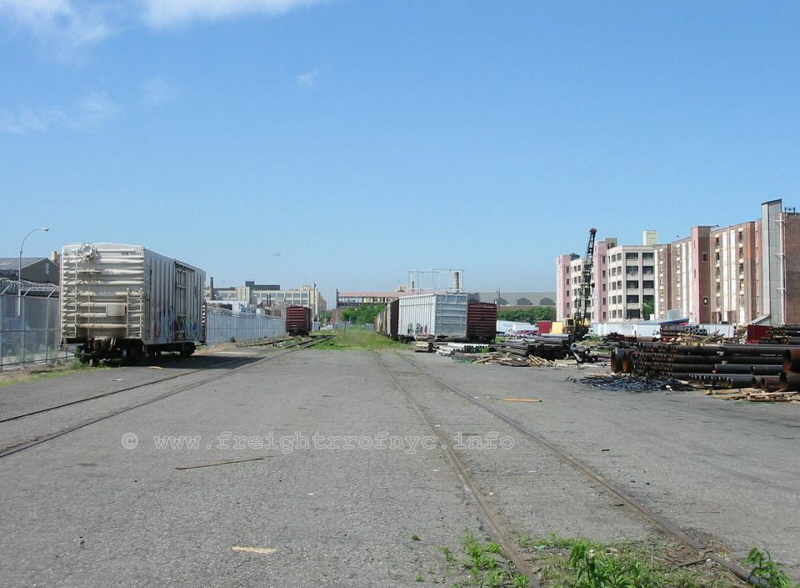 As current data reflects that the South Brooklyn Railway / New York City Transit Authority / Metropolitan Transportation Authority no longer has interest in the 39th Street Yard; all updates pertaining to reconstruction of and / or operations in the former 39th Street Yard will be posted in the South Brooklyn Marine Terminal chapter below. 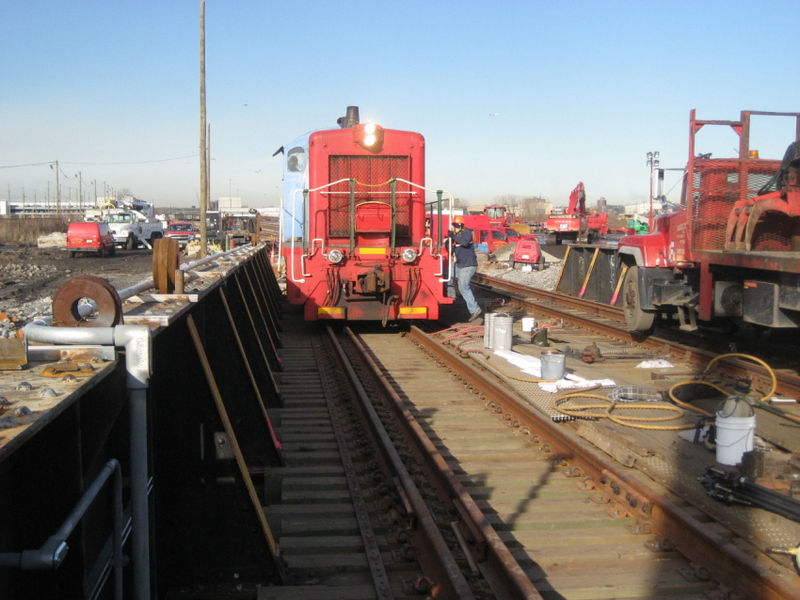 As of April 2012, New York New Jersey Rail has moved its Brooklyn base of operations to the 65th Street Yard. 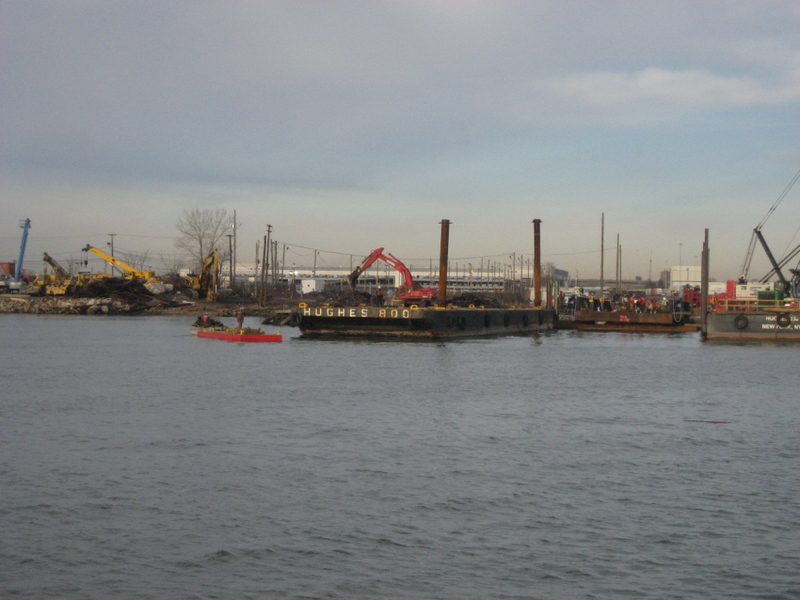 Carfloat service was also relocated to the 65th Street float bridges, becoming the eastern terminus for the carfloat route. 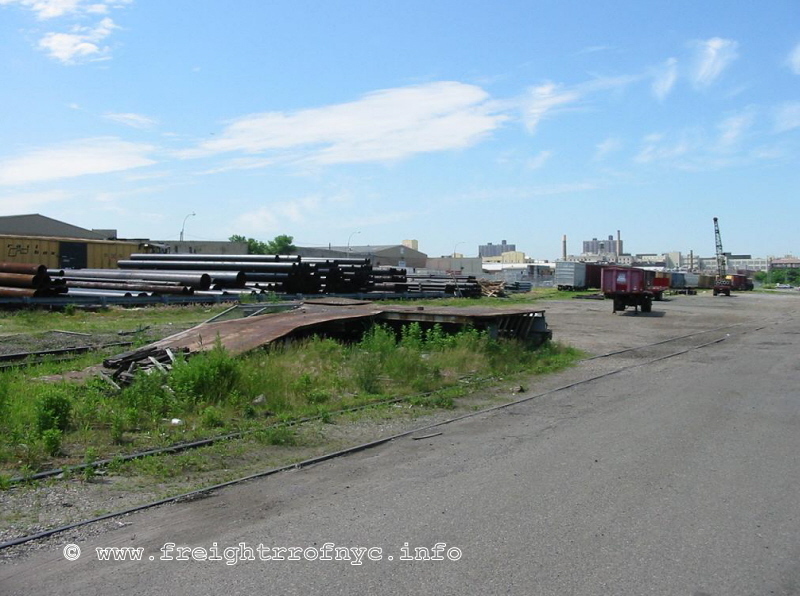 The 65th Street Yard is located at the foot of 65th Street and Second Avenue, just south of Brooklyn Army Terminal. 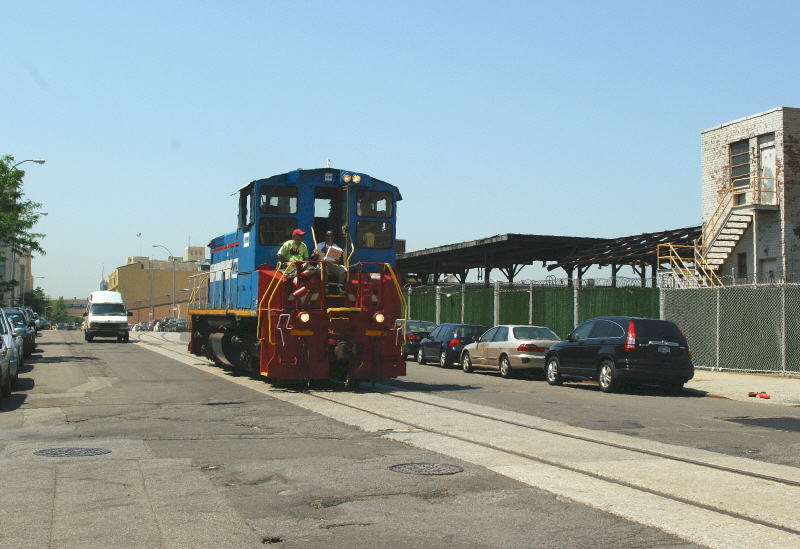 The 65th Street Yard was formerly operated by the New York, New Haven & Hartford Railroad in conjunction with the Long Island Rail Road (Bay Ridge Division). It was then taken over by the Penn Central Railroad in January 1969. 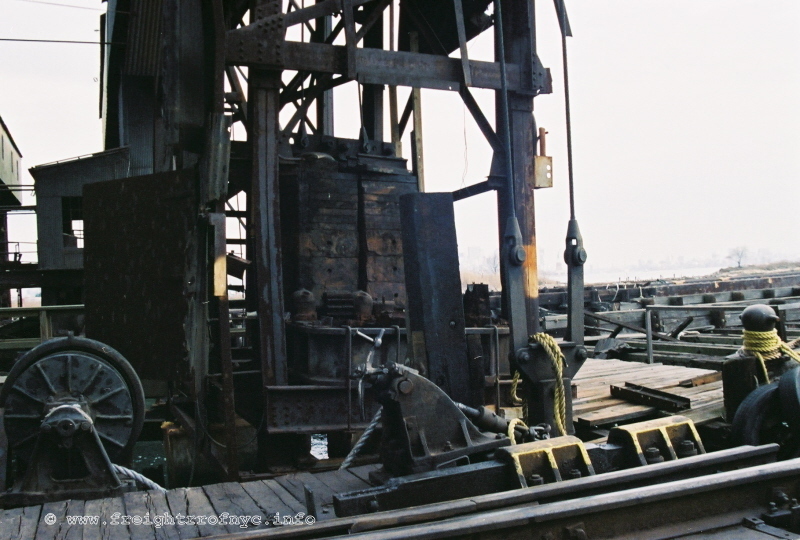 The 65th Street Yard was once home to four electrically powered cable suspended float bridges. 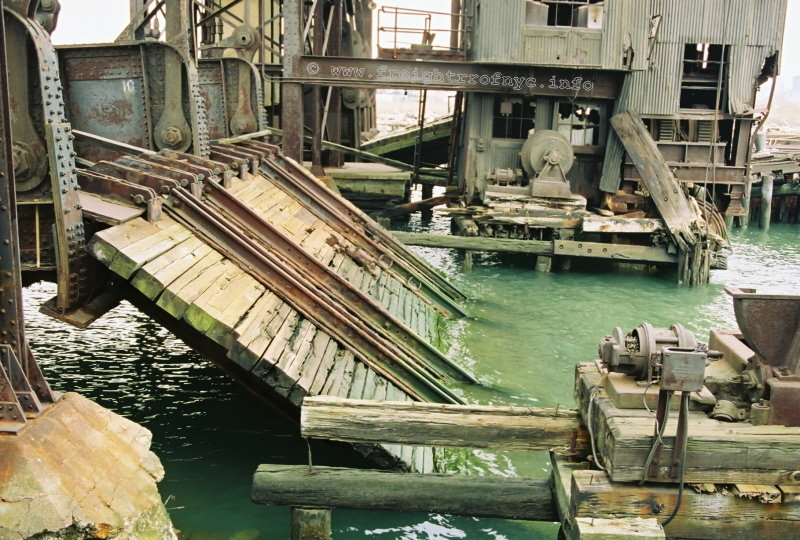 In 1970 these four float bridges were dismantled and the yard was little used. Conrail absorbed Penn Central in 1976. 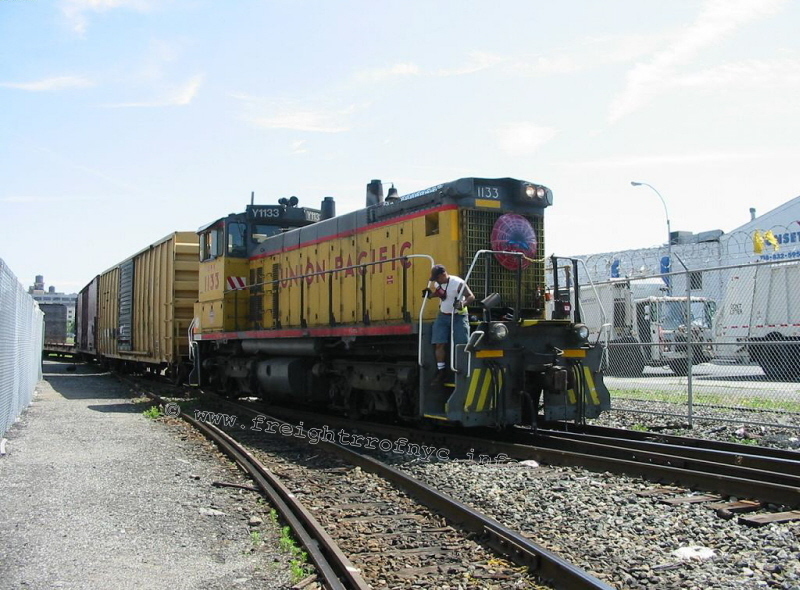 The 65th Street Yard was then repurchased by the Long Island Rail Road is now under the control of the Long Island Rail Road and the New York & Atlantic Railway (being the contracted freight carrier for the Long Island Rail Road). 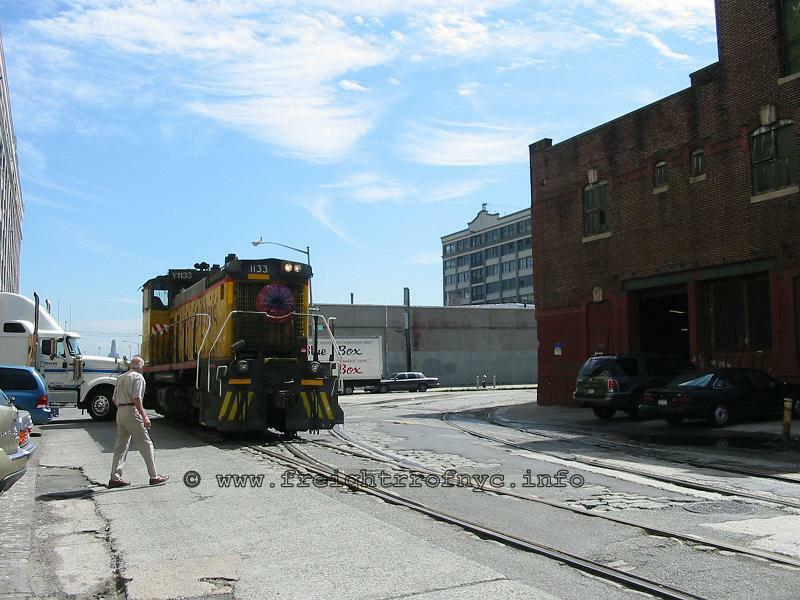 To get to the 65th Street Yard and interchange, New York New Jersey Rail has to exit their Bush Terminal Yard at the south end at 51st Street, resume street running of which the trackage runs down the middle of First Avenue. It would then enter the Brooklyn Army Terminal at 58th Street, and maneuver through the Brooklyn Army Terminal to the 65th Street Yard. 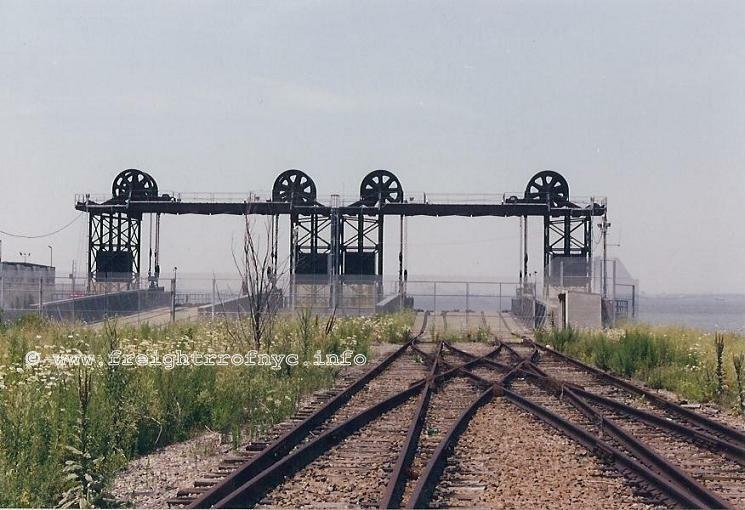 While it never came to fruition, the New York Cross Harbor Railroad once planned to relocate its base of operations to the 65th Street Yard, and thus a brand new pair of cable suspended floatbridges were built at this location in 1999, ironically on the site of the previous four float bridges of the Long Island Railroad mentioned above. 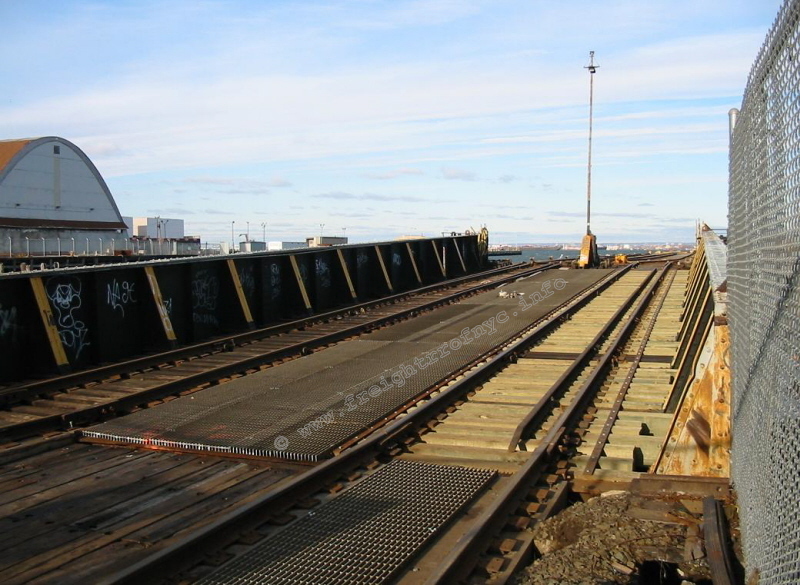 However in November / December 2009, New York New Jersey Rail executed a carfloat test and move using these new float bridges, and it was discovered that the rail on the float bridges was heavier (taller) than that on the carfloats! 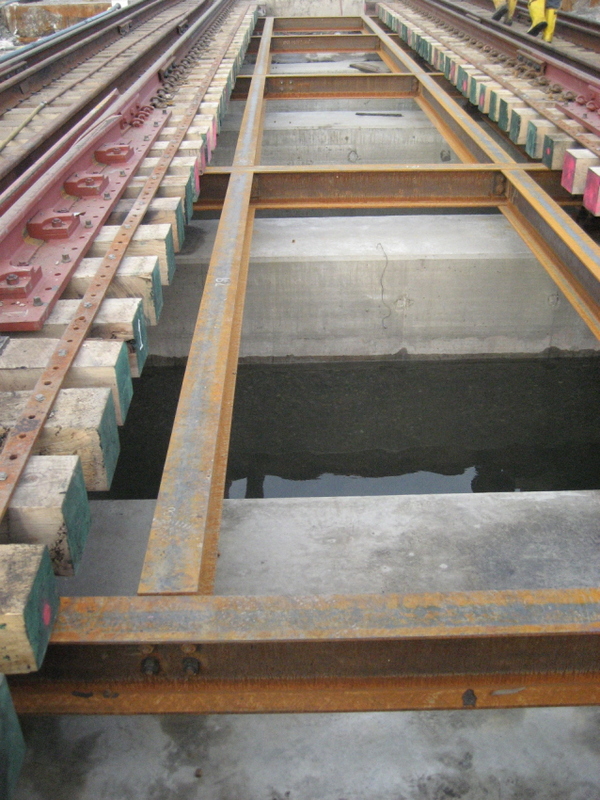 This resulted in a rail height difference at the carfloat / float bridge joint. Another test was conducted but the results have not been publicized. 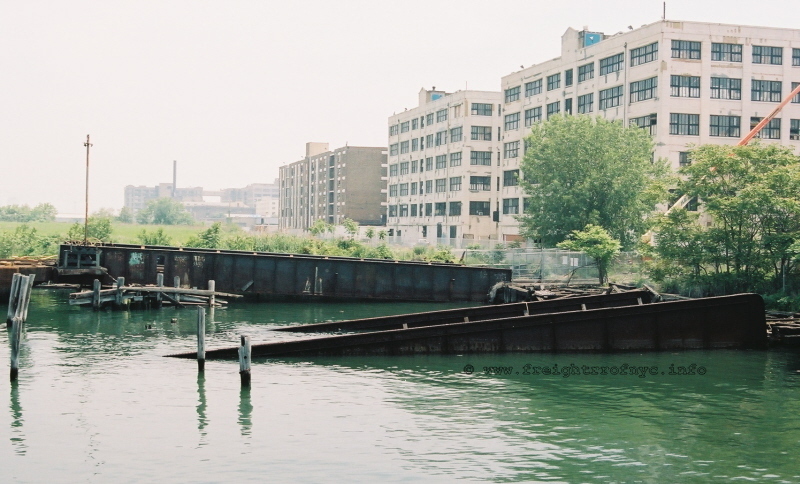 As of June 2010, the 65th Street float bridges were still inactive and the yard used intermittently, by New York Atlantic. In 2006 when I visited, there were about a dozen or so covered hoppers with one leaking plastic pellets. Several boxcars were on premises as well. About a year later, the yard was devoid of any cars. 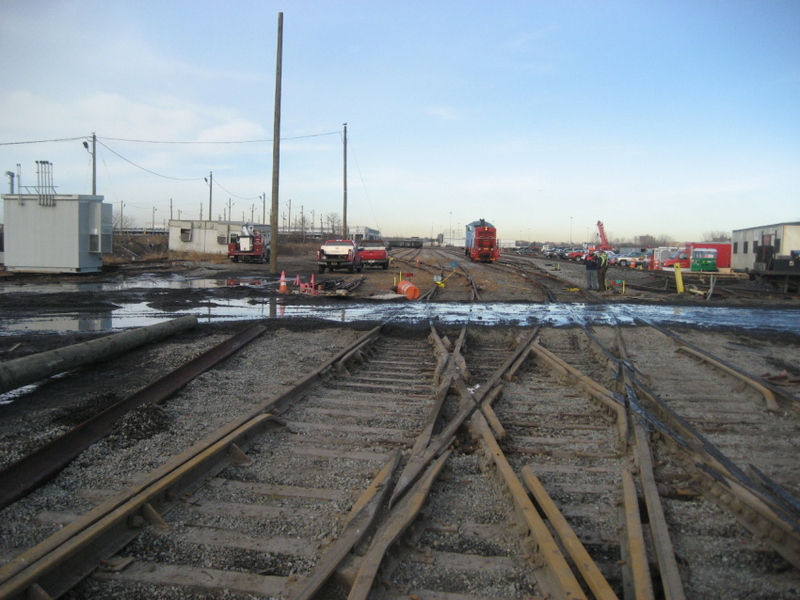 In April 2011, according to John McCluskey, Railroad Construction has been replacing cross ties in the 65th Street Yard for some time. 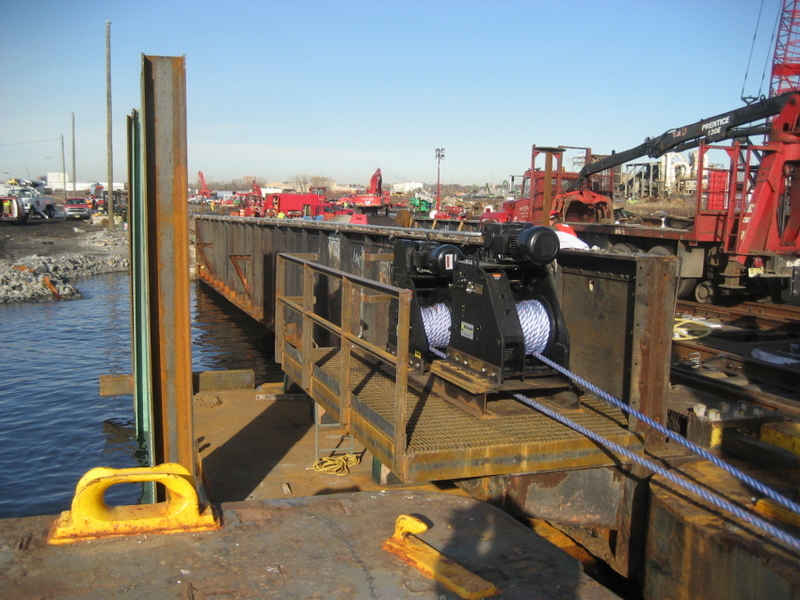 Whether the float bridge tests and tie replacements are a prelude to float bridge activation, nothing has been officially published or released. In the "2011 Port of New York and New Jersey Port Guide" published by the Port Authority of New York & New Jersey; shows on page 45 the Regional Rail Network map. In this map, the 65th Street Yard is listed as the "New York New Jersey Rail 65th Street Intermodal Terminal". 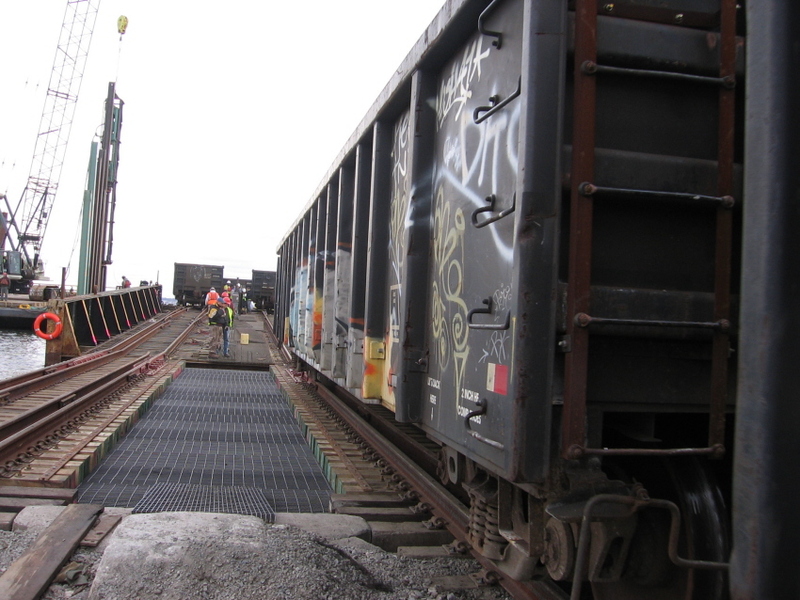 According to an employee of the railroad, New York New Jersey Rail has entered into an operating agreement via New York City Economic Development Corporation (NYCEDC) to operate portions of the 65th Street Yard, to include one float bridge and five tracks. As of April 2012, operations commenced for this yard. A semi-permanent office trailer for train crews, locomotive #1133 and several freight cars were seen off hours in the yard. 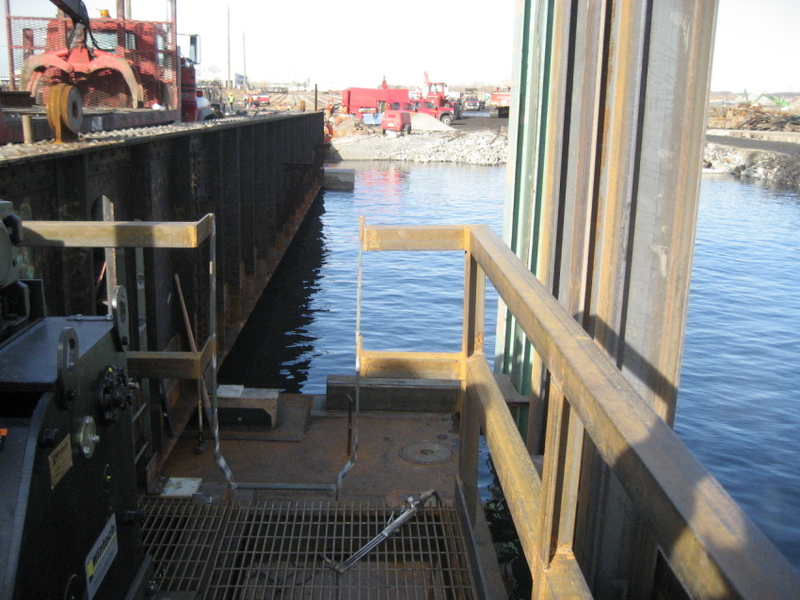 However, float bridge service commenced in the second week of July. 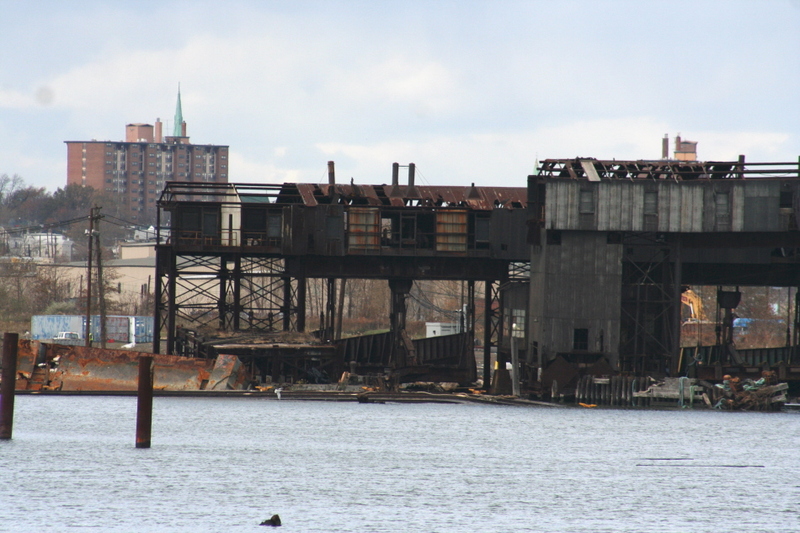 This location is now the eastern terminus for the NYNJ Rail carfloat route. However, no intermodal operation has taken place at 65th Street Yard as of this date. 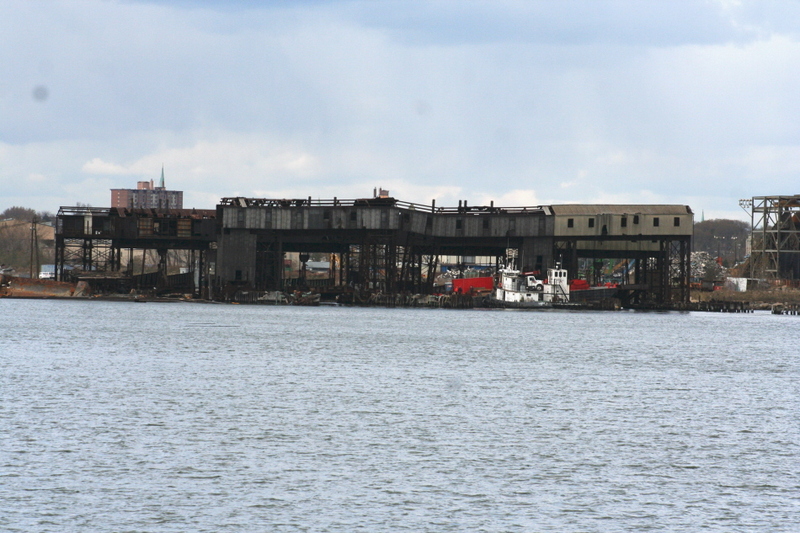 The piers west of the 39th Street Yard are known as the South Brooklyn Marine Terminal. 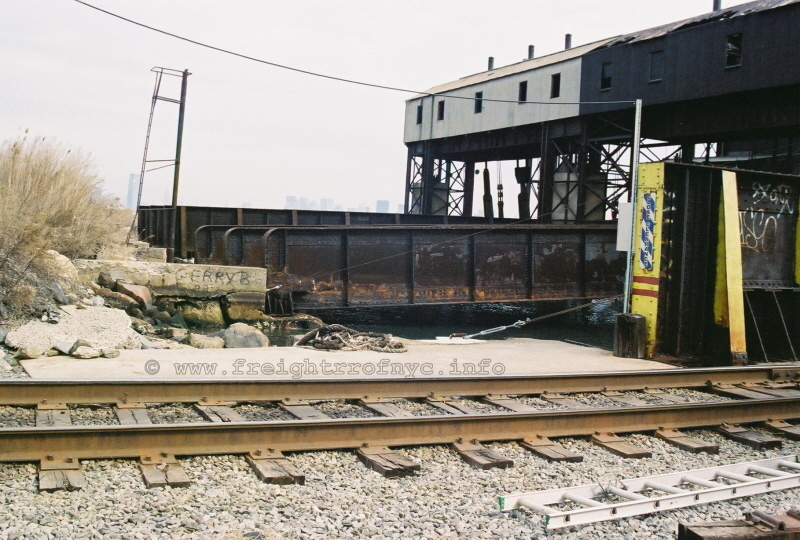 Strangely, rail service to this pier was not provided by the South Brooklyn Railway as one would expect, but by the New York Cross Harbor Railroad which would have to pass through the 39th Street Yard of the South Brooklyn Railroad to enter the South Brooklyn Marine Terminal. By the way, the South Brooklyn Marine Terminal is not affiliated with the South Brooklyn Railway. 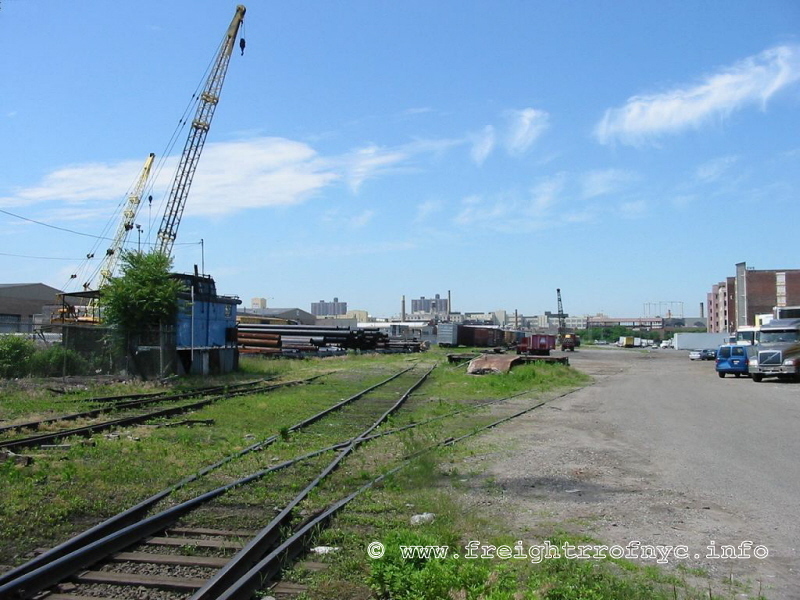 It is also now understood that the 39th Street Yard is no longer associated with the South Brooklyn Railway / New York City Transit Authority / Metropolitan Transportation Authority and belongs to the South Brooklyn Marine Terminal. 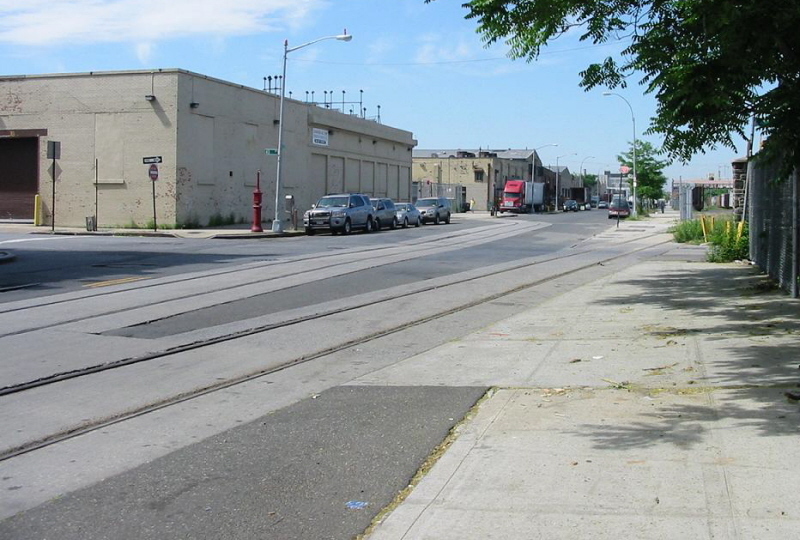 While it appears the South Brooklyn Railway will still have access via the 39th Street route (around the Costco property), the yard will be serviced by New York New Jersey Rail via a new track access located on First Avenue & 39th Street (see 2007 proposal below). 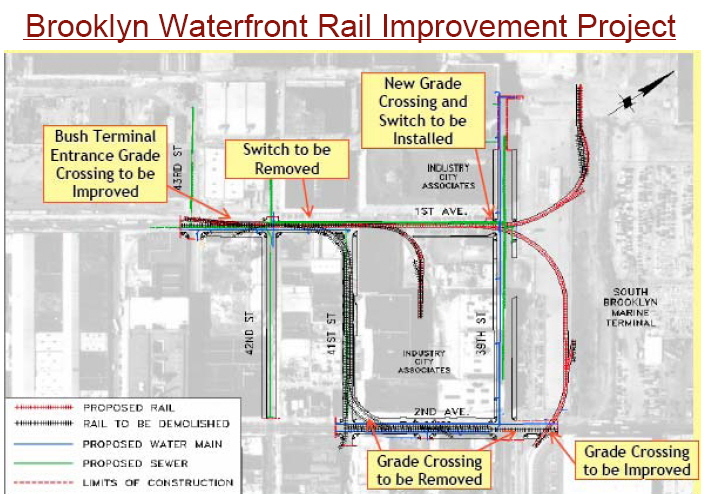 According to published proposals and observed in their attached diagrams, existing east-west trackage from the 39th Street Yard is being removed, new trackage is being installed on a north-south orientation in the yard, and the siding leading down the pier and into the South Brooklyn Marine Terminal (adjacent to the former American Stevedoring Pier) has been reconstructed as well. The following is an excerpt located in the New York State Department of Transportation non-NYSDOT Economic Recovery Act / Tiger pre-application online archives. This "pre-application" was submitted by the New York City Economic Development Corporation. Looking west adjacent to the Pier. Note new track laid in distance. Looking west. New concrete ties awaiting installation. Looking west. 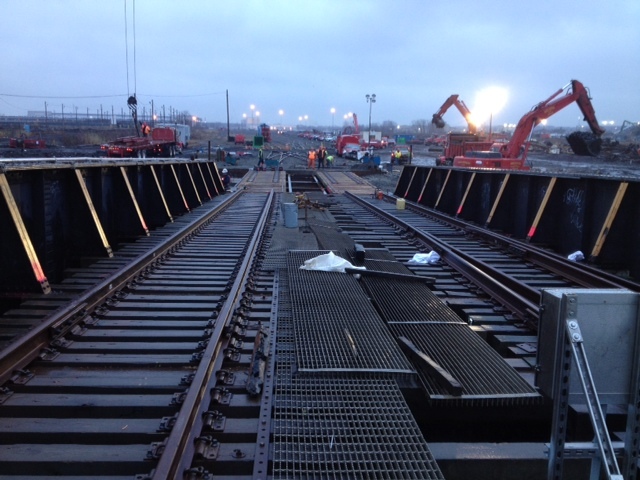 Another view of the new concrete ties awaiting installation. Looking east at the South Brooklyn Railway 39th Street Yard. Note track stubs ending in middle of parking area. It appears both the north and south leads will be reconnected once trackage is rebuilt. 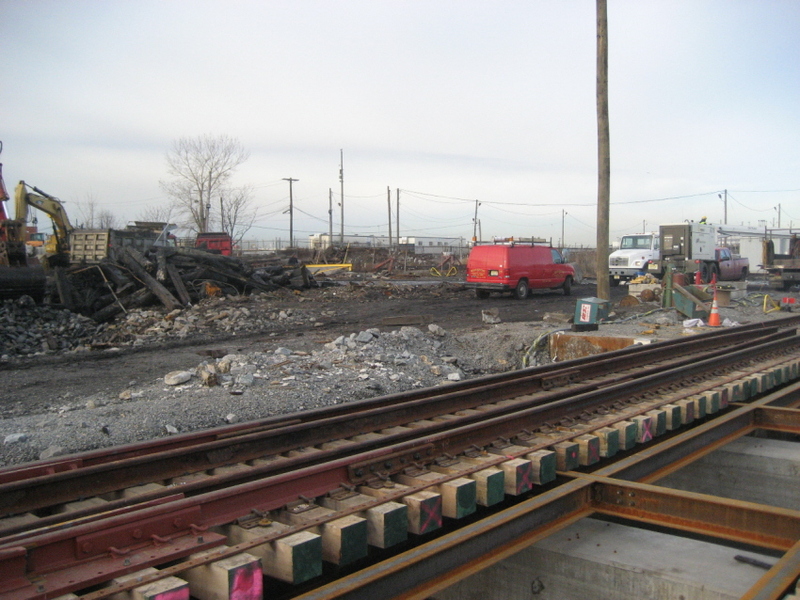 As of 06 April 2011, all previous trackage from South Brooklyn Railway has been removed. The new "Bush Interchange" track and wharf siding (constructed in 2010) are the only tracks remaining. 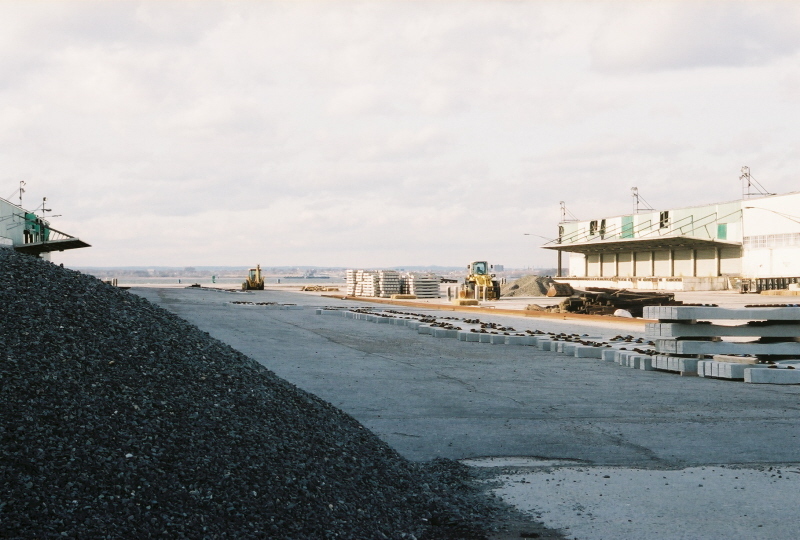 Piles of concrete ties have been delivered and are presumably going to be used for the yard rebuild. 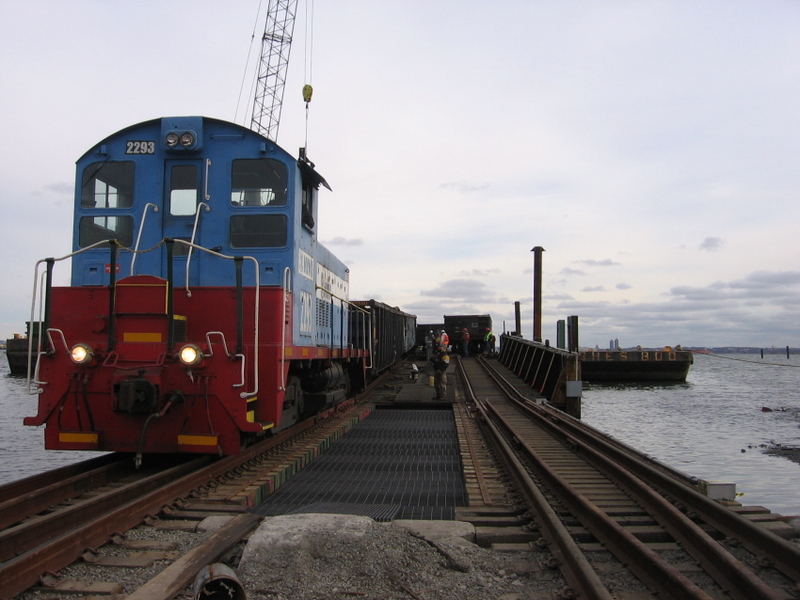 As of February 10, 2014; rail traffic commenced and freight service has been instituted to Sims Recycling located at the northern part of the South Brooklyn Marine Terminal at 30th Street. 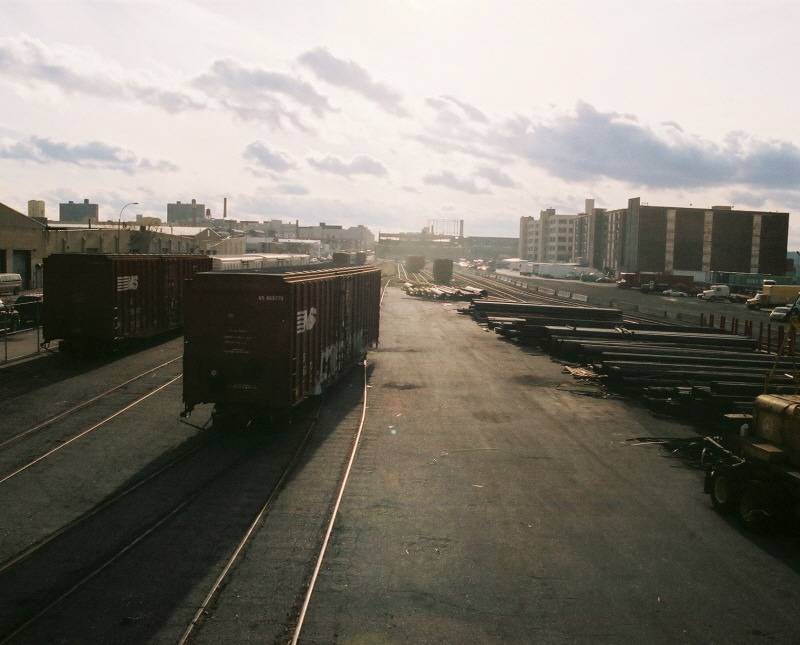 The railyard at Greenville, NJ, is located in Jersey City, New Jersey, and is the westernmost point of interchange of New York New Jersey Rail. It is currently the base of operations and house a modest trailer which is used as offices for management personnel. While having been discussed many times before on this website, the history of Greenville is worth reiterating. Greenville Yard, including the float bridges; was originally constructed by the Pennsylvania Railroad in 1904 when the PRR outgrew it's Harsimus Cove Yard (somewhat north on the New Jersey shoreline). In it's heyday, this yard was huge. But perhaps what is most interesting is that Greenville Yard rests atop a man-made peninsula. The original Greenville float bridges and support structures were made of all wood, but following a massive fire in 1931; they were rebuilt in steel to prevent a repeat of the conflagration. Greenville Yard now featured six pony plate girder electrically powered cable suspension float bridges, numbered 9 ½ through 14. 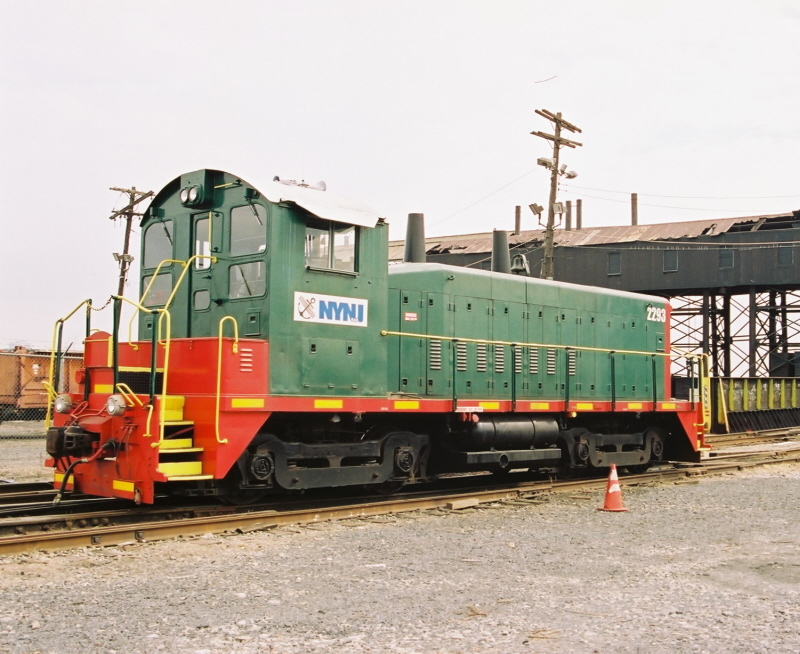 Greenville Yard as originally constructed, also featured such apparatus as a hump yard, outbound / inbound yards, car repair facilities and even a steel staging area for New York City building construction. As mentioned on the Brooklyn Eastern District Terminal page of this website; after Conrail took over Class 1 operations in 1976; is did not want to involve itself in marine operations. 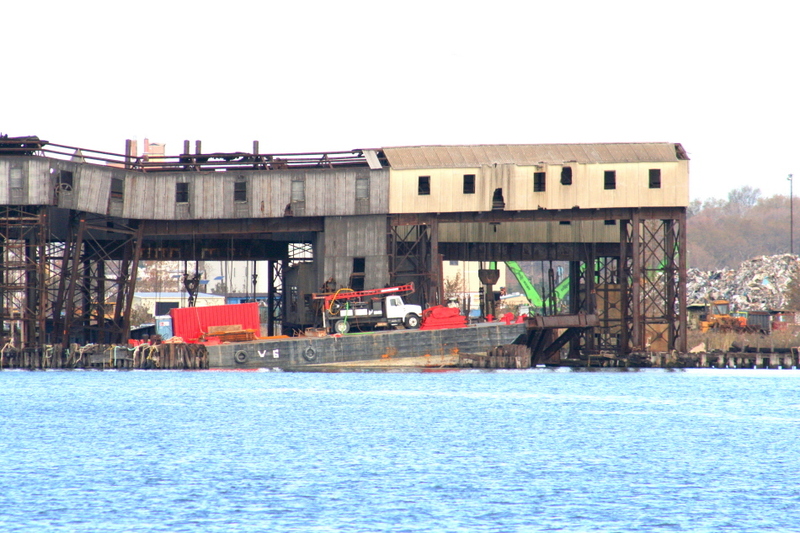 Therefore, the carfloating operations were contracted out to Brooklyn Eastern District Terminal in 1976. 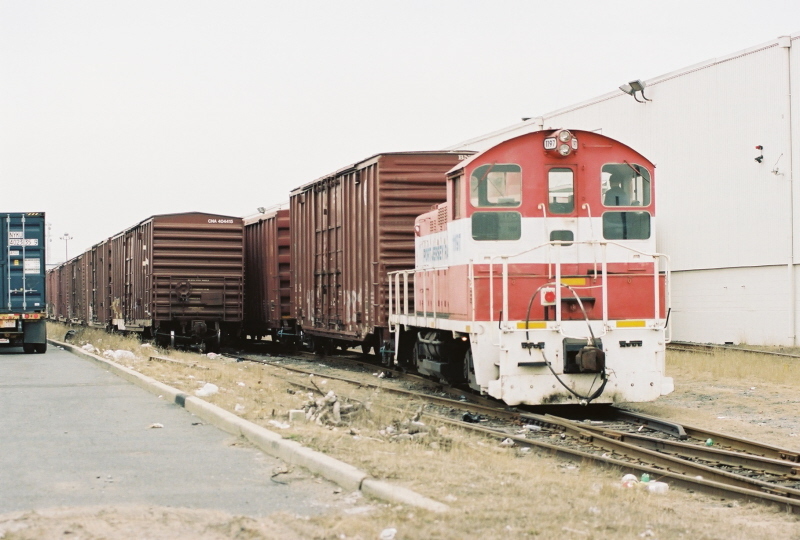 Following the cessation of operations of Brooklyn Eastern District Terminal / New York Dock in 1983, the New York Cross Harbor Railroad received the lease on Greenville from Conrail. 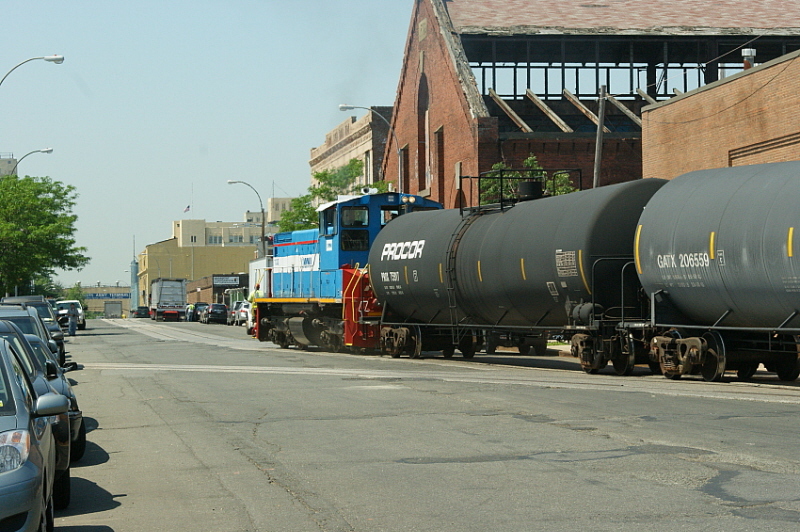 It was said that part of a revised agreement in 1983, that Conrail would maintain the yard and floatbridges in Greenville, with New York Cross Harbor Railroad doing the switching and carfloat work. 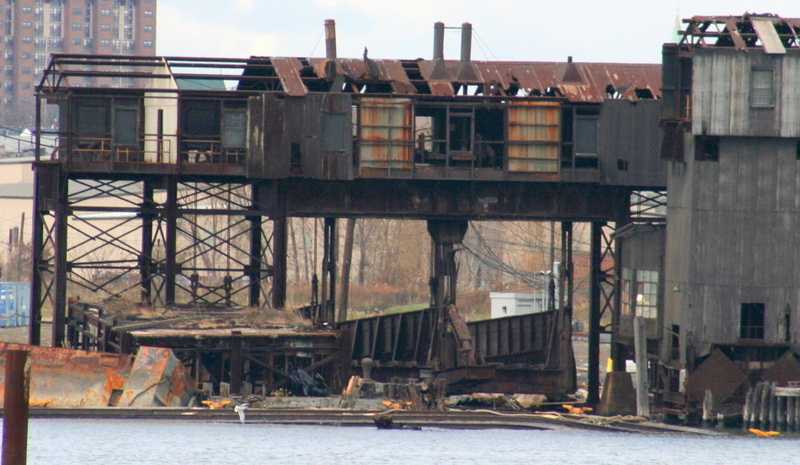 However, after two float bridges collapsed (#13 & 14 or the southernmost two) around 1991 and with Conrail refusing to repair them, outright ownership of the float bridges and structures, along with the floating rights were transferred to New York Cross Harbor Railroad, but the land remains Conrail Shared Assets owned. See the float bridge chapter for more information. Most of the float bridges are still there, albeit in various states of disrepair; except for #11 which is in service at this time. 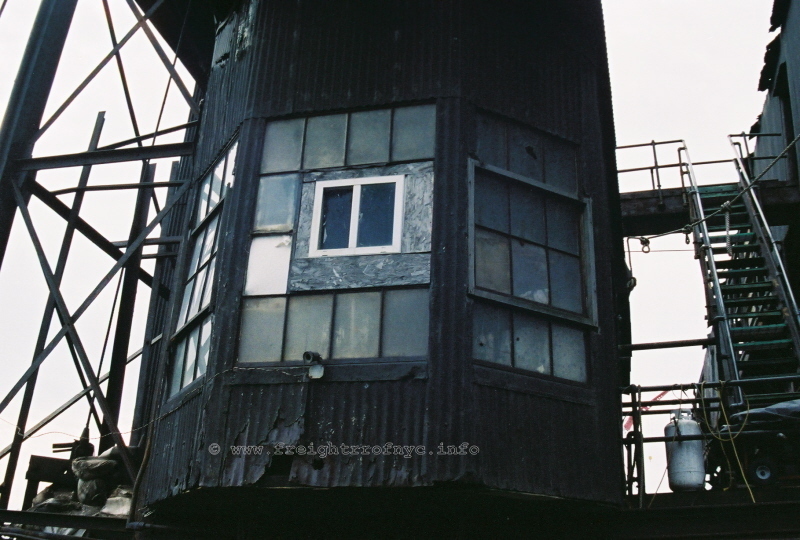 Number 11's outer apron was replaced in 1994, and numbers 13 and 14 which were dismantled in 1997, following the partial collapse of the suspension gantry. Note that this shows 12 Bridge as operational! As 12 Bridge was operational until 1992, this map and the others as part of the TSM Study must predate that year. Tracks were numbered in Greenville as following: 12-3 (southern most), 12-2, 12-1, 11-4, 11-3, 11-2, 11-1 and the Crane Track. Greenville is currently comprised of approximately 27 acres. Greenville itself never really had any customers other than being a transload operation until 2006; at which time a new consignee would receive boxcars filled with hay on the Crane Track. This customer is still in operation and receives this commodity to this day. Note the construction differences and "newer" appearance of 9 1/2 Bridge counterweights & gantry. This is because 9 ½ Bridge was installed after 10 through 14 Bridges were originally installed, and is in fact newer. 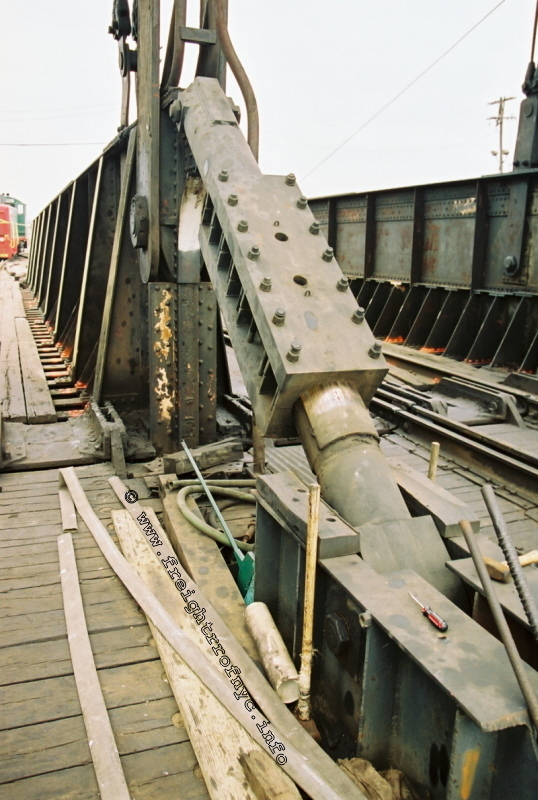 Note the position of 9 ½ Bridge in background: it is pulled out of its pivot box and a portion of the pivot wheel can be seen. and the bottom right is nearly so with only a small diameter of concrete remaining! A very well designed reconstruction of the support girder base. Under the cut stone block are 12 x 12 creosoted bridge timbers. This will undoubtedly last significantly longer than the cast concrete bases shown previously in the 10 / 11 gantry support image. Note 9 ½ Bridge apron at the opposite angle in background. It is still attached to and suspended by the apron counterweight cables. The only float bridge in Greenville currently in operation. Does anyone doubt the corrosive effects of salt water? 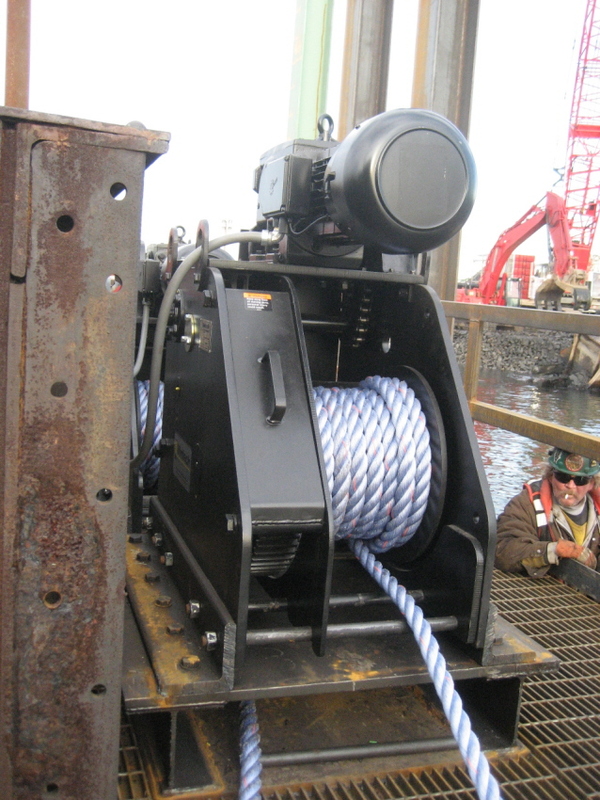 Showing electric hawser winch drum, apron counterweights, manual hawser winch, counterweight cable with anchor and toggle. 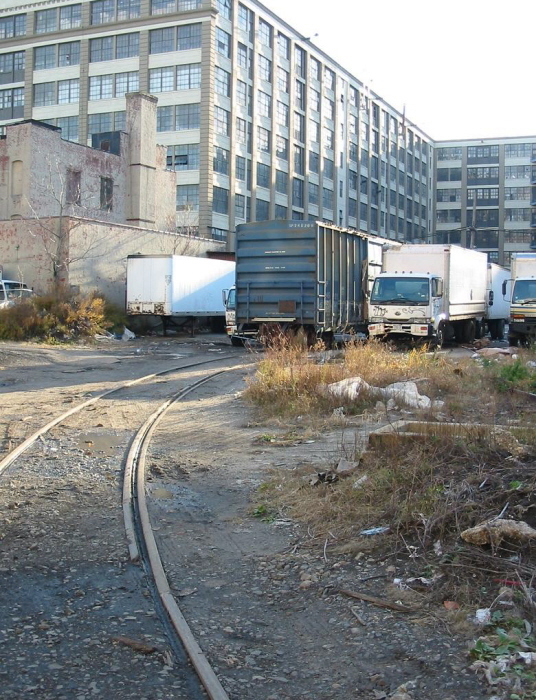 The Port Authority Board of Commissioners today authorized the agency to move ahead with the purchase and redevelopment of Greenville Yards, a century-old rail yard in Jersey City, N.J. that will serve as the lynchpin to removing up to 360,000 trash trucks annually from trans-Hudson crossings and New Jersey highways by moving New York City's sealed containerized solid waste and other commodities by barge and rail when appropriate facilities are completed by 2013. Greenville Yards today forms the western terminus for New York New Jersey Rail LLC, which is owned by the Port Authority and operates the last cross-harbor car float system on the Hudson River. 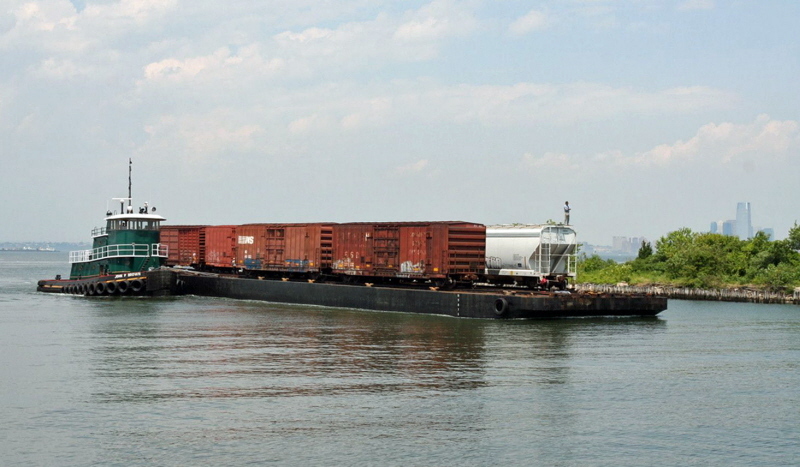 Under this system, freight is loaded on rail cars and the cars are moved by barge from Greenville to Brooklyn, N.Y., where they are either delivered to local customers or handed over to another railroad to reach their destination. 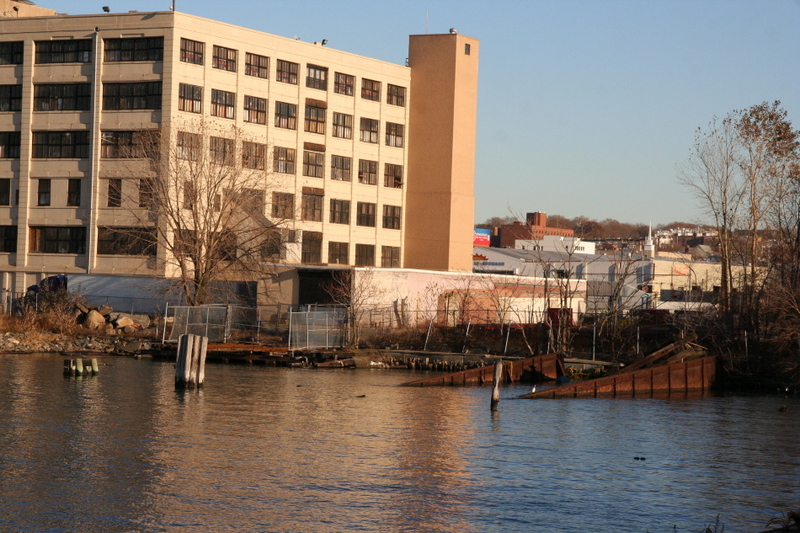 The Board authorized $118.1 million for the overall project, part of which will go toward the purchase of approximately 47 acres of upland property and 72 acres of riparian rights at Greenville, and part of which will go toward the existing rail car float system operating between Greenville Yards and sites at 51st and 65th streets in Brooklyn, N.Y. Funding for this authorization will come from federal and state grants, and Port Authority funds. 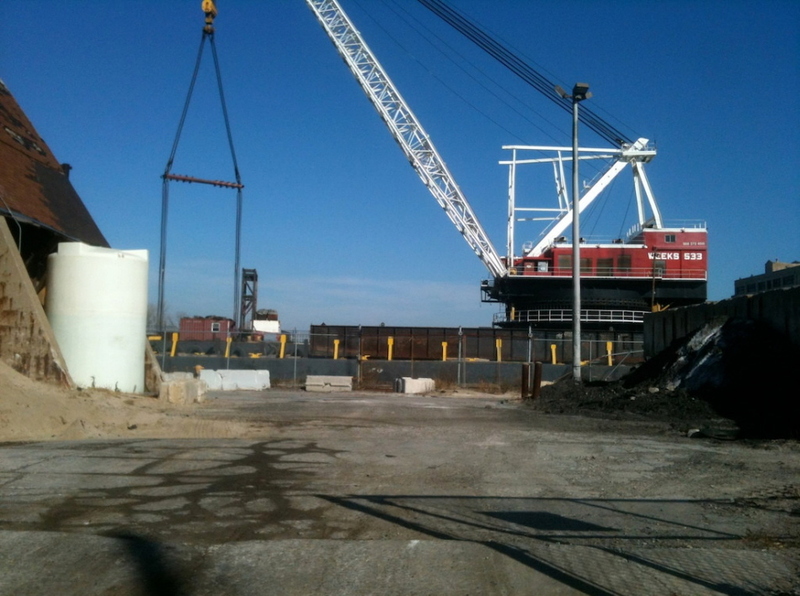 A new barge-to-rail facility, to be built at Greenville Yards, will allow for municipal solid waste and other commodities to be barged from New York to New Jersey in watertight sealed containers and taken out of New Jersey by rail. 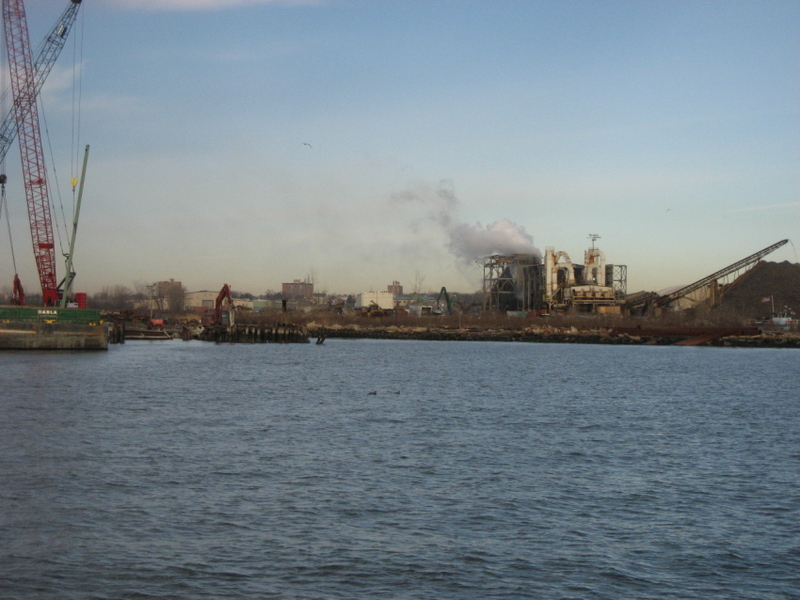 Currently, the majority of New York City's waste is trucked through the Port Authority's Hudson River crossings in unsealed, open-topped trucks with fabric coverings and continues out of state using New Jersey's roads, causing negative environmental consequences, worsening traffic congestion, and overburdening the region's bridge and highway infrastructure. Port Authority Chairman Anthony R. Coscia said, "Our bridges and tunnels are overburdened with truck traffic, and today's action provides an environmentally sound alternative. It will provide a host of important benefits - reduced congestion for those who use our crossings, a better quality of life for the people of our region, and lower bridge and tunnel maintenance costs for the Port Authority." Port Authority Executive Director Chris Ward said, "This is exactly the kind of business the Port Authority was created to take on. It is a win for the environment, a win for relieving traffic congestion and a win for economic competitiveness. I want to thank Governor Christie for his leadership on this issue, as well as Congressman Jerry Nadler and the Federal Highway Administration for leading the way in securing the federal funding that will allow us to revitalize the cross-harbor car-float operation and reinvigorate this vital freight corridor." 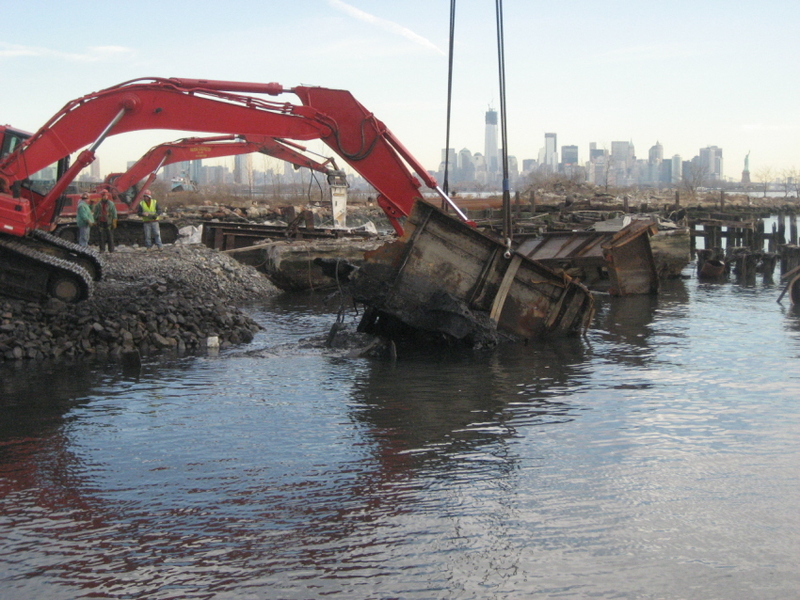 Port Authority Deputy Executive Director Bill Baroni said, "This facility gives us a once-in-a-lifetime chance to maximize our waterways and rail systems and take up to 360,000 trash trucks off New Jersey's major highways each year. That's a benefit that's good for those who travel through this region every day, and even better news for those who live and work in New Jersey." 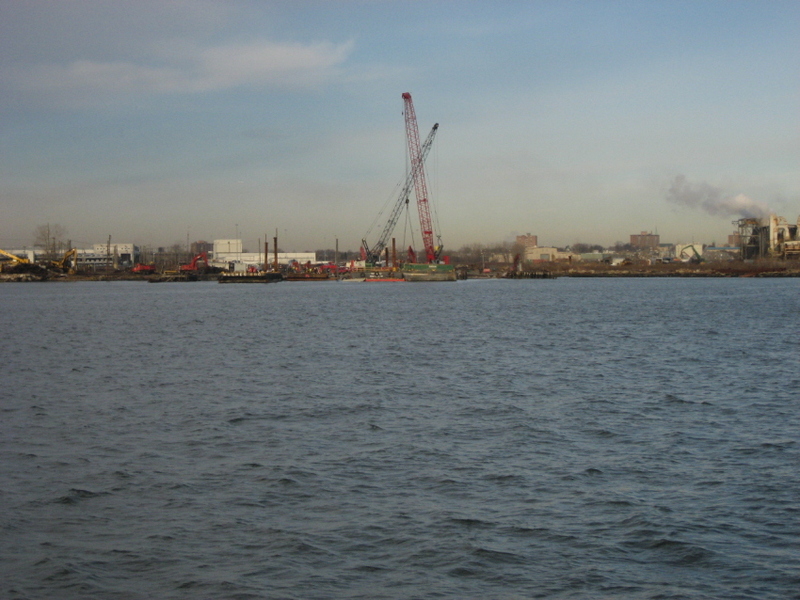 New York City plans to ship an estimated 120,000 to 180,000 containers of solid waste per year through two barge-to-rail transfer points on the western side of the Port of New York and New Jersey. If Greenville is used for this purpose, it would handle about half of the container stream, with the balance going to the other selected facility. In order to meet this demand, the Port Authority will make improvements to decades-old track and infrastructure, as well as construct a modern barge-to-rail transfer facility. Today's Board action will allow these improvements to move forward. The purchase of Greenville Yards and the rehabilitation of track and infrastructure there also provides the Port Authority with major benefits, including reduced costs to maintain its bridges from the wear and tear caused by daily truck traffic. Each year, the Port Authority spends more than $30 million maintaining the deck of the George Washington Bridge upper roadway, due primarily to truck traffic. In addition, the reduction of up to 360,000 trash truck trips a year will significantly reduce the levels of harmful emissions currently generated by truck shipments. The barge-to-rail facility to be built at Greenville Yards will connect [with] two railroads - CSX Transportation and Norfolk Southern Railway. 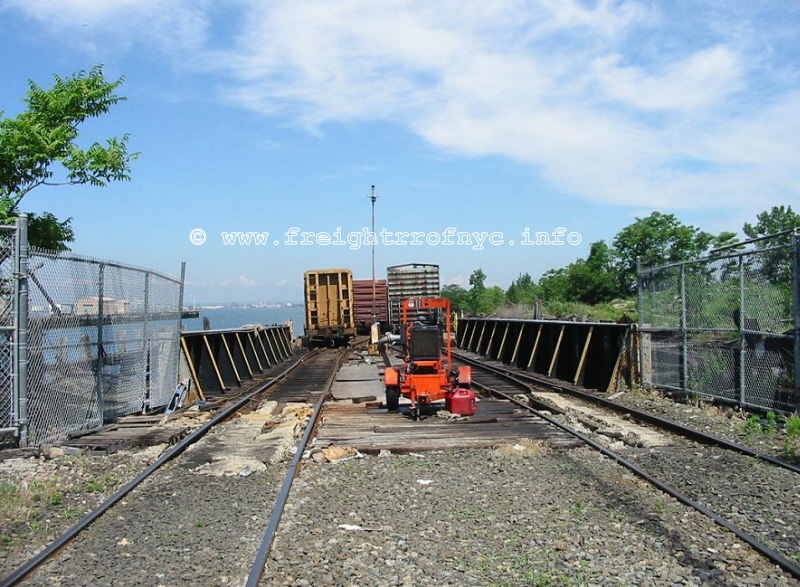 Since freight trains are not allowed in Amtrak's North River Tunnels, and the Poughkeepsie Bridge was closed in 1974, the cross harbor car float system is the only Hudson River rail freight crossing within 140 miles of New York City. 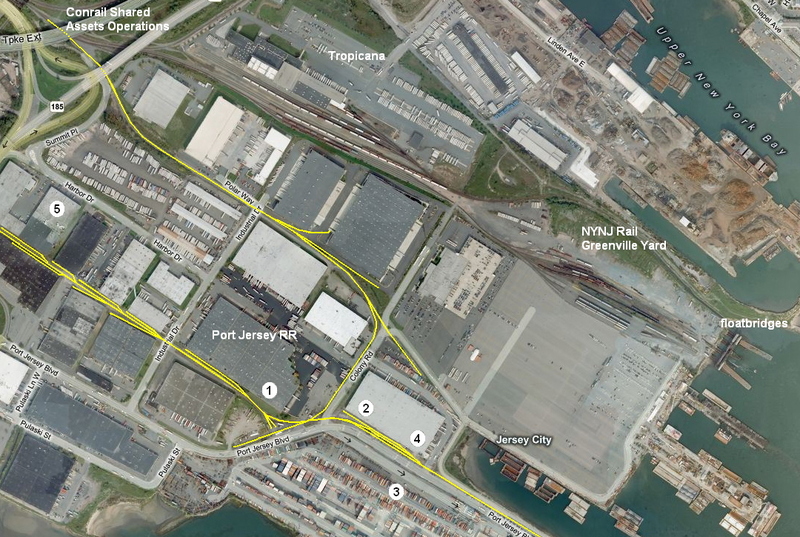 At their monthly meeting Thursday, the commissioners of the Port Authority of New York and New Jersey authorized expenditure of $3 million for planning and preliminary design work for the development of an intermodal container transfer facility at the Greenville Yard-Port Authority Marine Terminal in Jersey City. 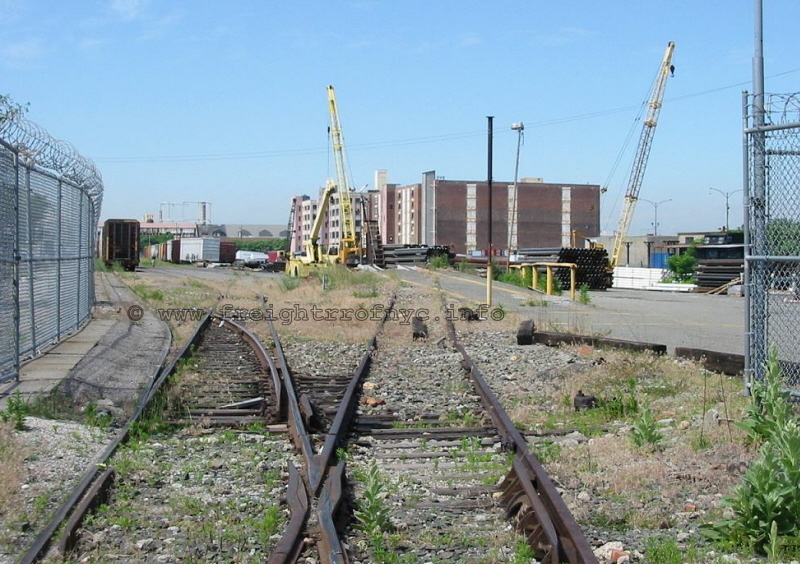 The port authority plans to develop an ExpressRail facility on the Greenville Yards that the commissioners authorized it to buy and redevelop in May. 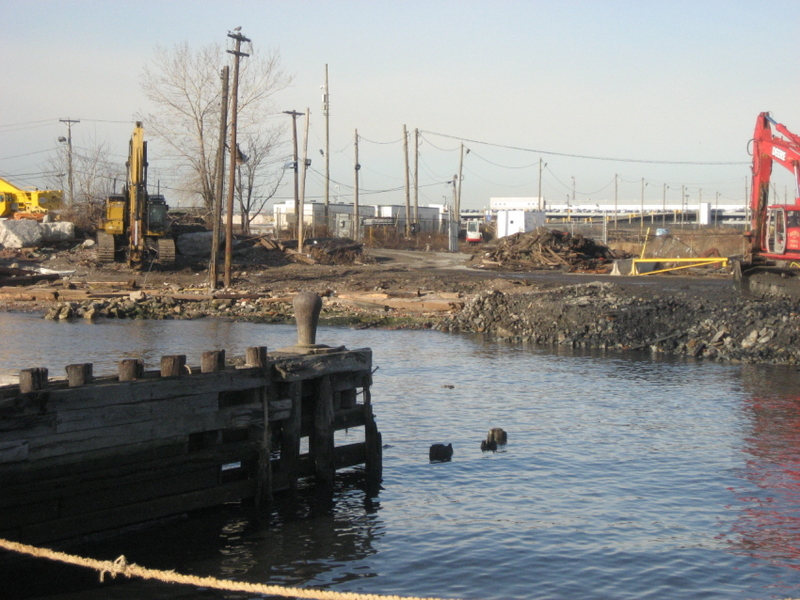 NY-NJ Port Plans Environmental Study. The expanded rail yard could handle up to 250,000 containers per year. 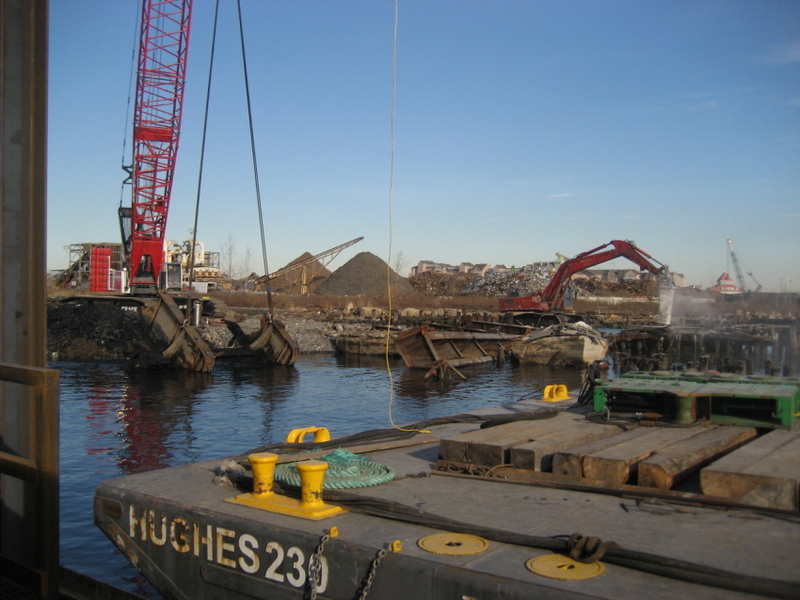 With expected completion in 2013, the new facility will help remove as many as 360,000 trash trucks annually from trans-Hudson crossings and New Jersey highways by moving New York City sealed containerized solid waste and other commodities by barge and rail. On 16 June 2011, I received the following .pdf document from Joe Roborecky. Despite this late date of addition to this website, this document has been public for a while. 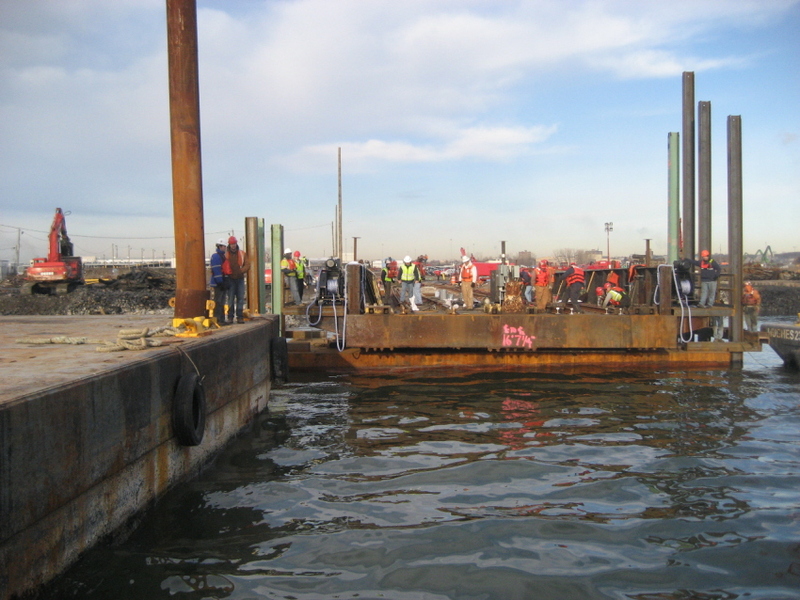 This document pertains to the PANYNJ soliciting bids for the temporary stabilization of Float Bridge #11 and its main and apron Gantries, the demolition of existing float bridges 9½, 10, 12, and the construction of new float bridges 9 and 10. 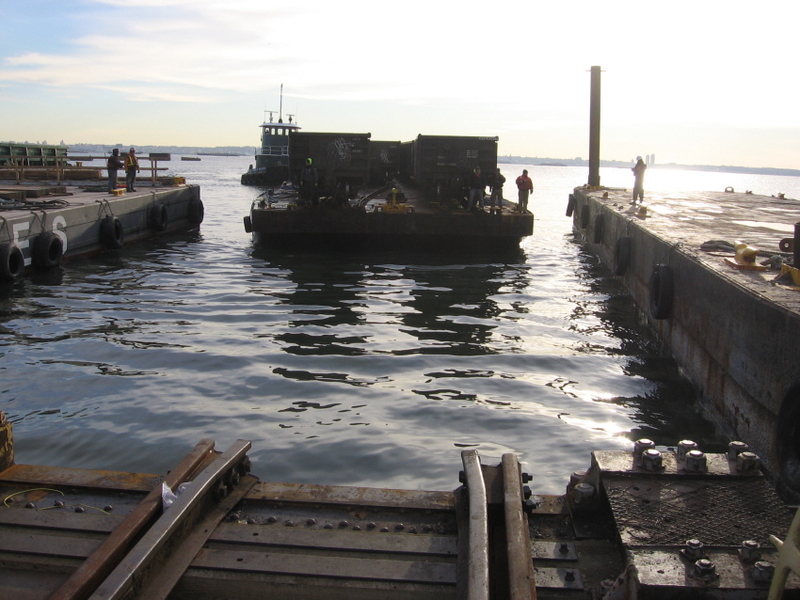 Also included in this request is the construction repair of one carfloat (#29) and the construction of a brand new four track carfloat. Also, here is a thumbnail of the proposed renovations of the Greenville Yard, The map below shows the proposed layout following reconstruction which is superimposed upon the current yard configuration. The full size map is huge, so click on the "thumbnail" below for the full size map and allow a few moments for it open. Please use the back arrow on your browser to return here. 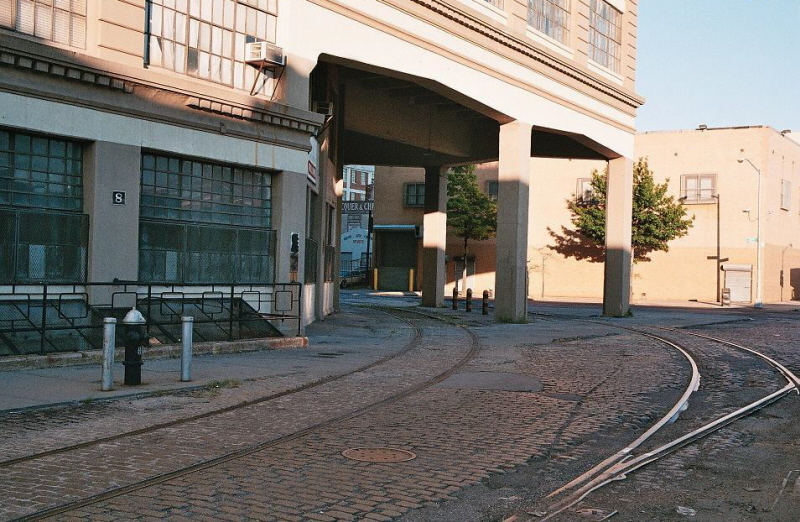 The Port Jersey Railroad was established in 1970, as a 2.4 mile terminal railroad within the Port Jersey distribution center complex in Jersey City, New Jersey. The operation, of which the entire staff consisted of just two employees; existed solely to serve itself and it's customers within the Port Jersey complex. 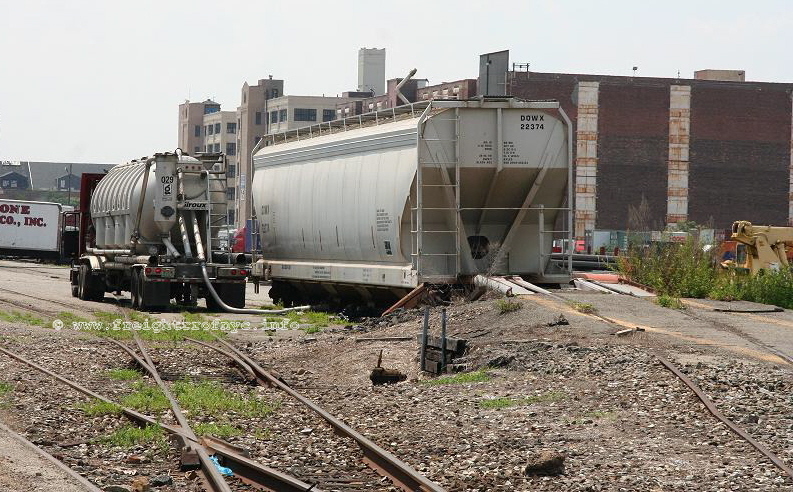 New York New Jersey Rail, LLC (NYNJ),  a Class III rail carrier, has filed a verified notice of exemption under 49 CFR 1150.41 to acquire and operate approximately 2.4 miles of rail line located in the Greenville section in Jersey City, Hudson County, NJ. According to NYNJ, the rail line has no milepost numbers. 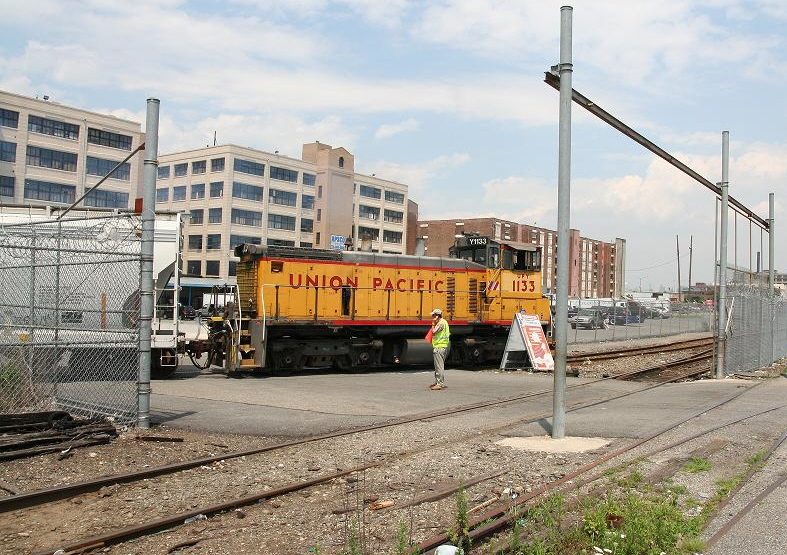 NYNJ states that it will shortly enter into an Asset Purchase Agreement with Port Jersey Railroad Company (PJR) to acquire a significant portion of the operating assets of PJR to enable NYNJ to provide freight services to shippers within the Greenville section of Jersey City. NYNJ states that it currently interchanges with and will continue to interchange with Consolidated Rail Corporation (Conrail) at its junction with Conrail's Greenville A Yard track located in Jersey City. NYNJ also states that the proposed transaction does not contain any language that would limit its ability to interchange traffic with other carriers. According to NYNJ, the line only connects with lines of Conrail. NYNJ certifies that its projected annual revenues as a result of the transaction will not result in NYNJ becoming a Class II or Class I rail carrier and will not exceed $5 million annually. NYNJ states that it expects the transaction to be consummated on or shortly after the effective date of this exemption. The earliest this transaction may be consummated is December 19, 2010, the effective date of the exemption (30 days after the exemption was filed). If the verified notice contains false or misleading information, the exemption is void ab initio. Petitions to revoke the exemption under 49 U.S.C. 10502(d) may be filed at any time. The filing of a petition to revoke will not automatically stay the effectiveness of the exemption. Petitions for stay must be filed no later than December 10, 2010 (at least 7 days before the exemption becomes effective). An original and 10 copies of all pleadings, referring to Docket No. FD 35444, must be filed with the Surface Transportation Board, 395 E Street, SW., Washington, DC 20423-0001. In addition, a copy of each pleading must be served on James H.M. Savage, John D. Heffner, PLLC, 1750 K Street, NW., Suite 200, Washington, DC 20006. Board decisions and notices are available on our Web site at http://www.stb.dot.gov. 1. 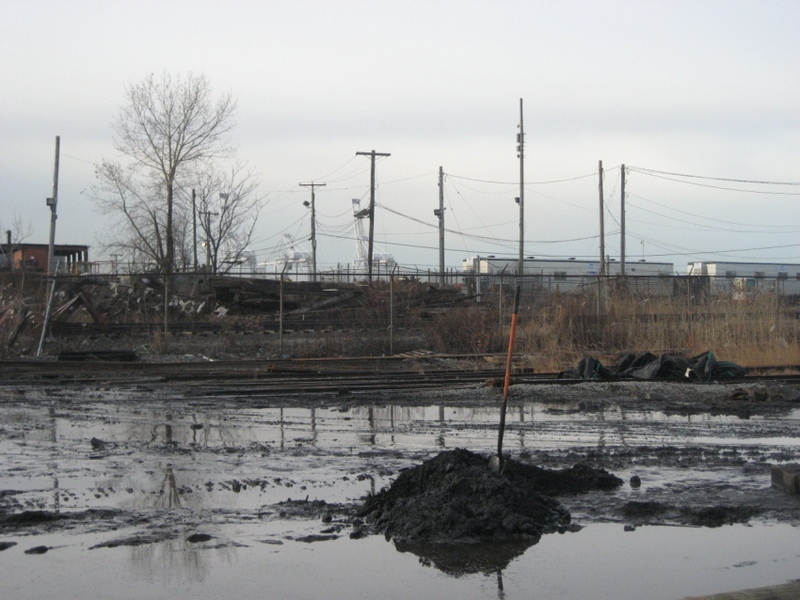 NYNJ is a wholly owned subsidiary of The Port Authority of New York and New Jersey. For the record, the Port Jersey Railroad is a switching operation providing rail service to a several manufacturers and warehousing concerns just southwest of and abutting against the Greenville Yard. Prior to its purchase by the PANYNJ, this operation was a New Jersey based operation, and therefore it was not covered by this website. However, with it being purchased by the PANYNJ, it will now be included on this page as it is now an integral part of New York New Jersey Rail. 1) East Coast Warehouse Temperature controlled and dry storage, customs services, full, nationwide logistics services. South America and the Caribbean islands, also carries American branded products of the USA. 3) Global Terminal & Container Closest marine container terminal to the entrance of New York Harbor:1800 ft. berth, 42 foot draft. 5) Well Luck Corporation Importer and distributor of Oriental foods. 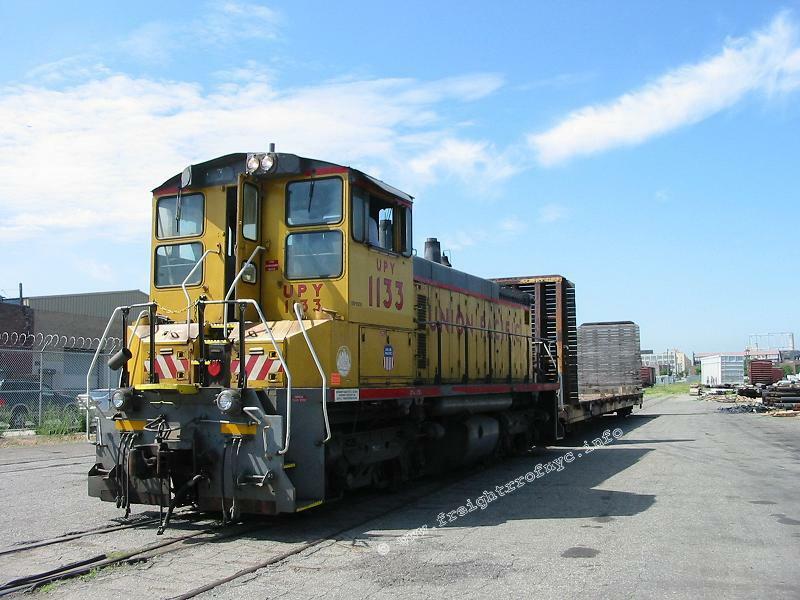 Updates on the Port Jersey Railroad acquisition and operations will be forthcoming, as they develop. 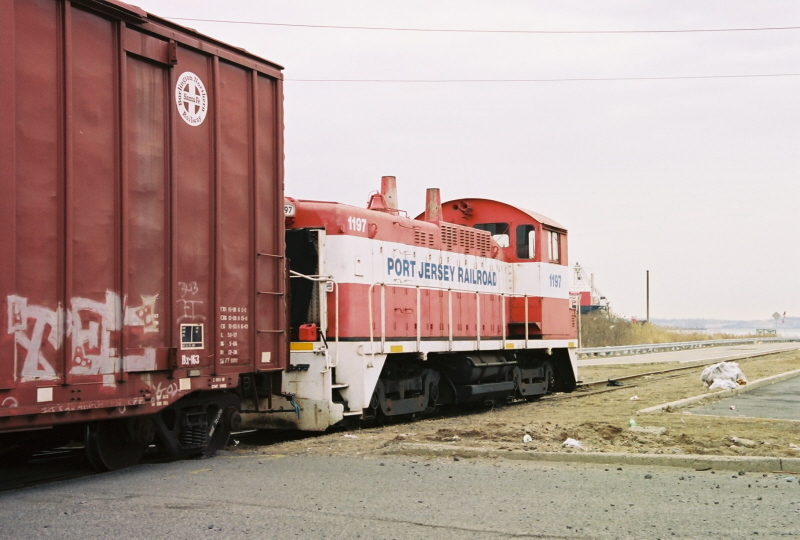 As of June 2011, it appears the from referencing the New York New Jersey Rail website, that the Port Jersey Railroad will be operated as a division of New York New Jersey Rail. 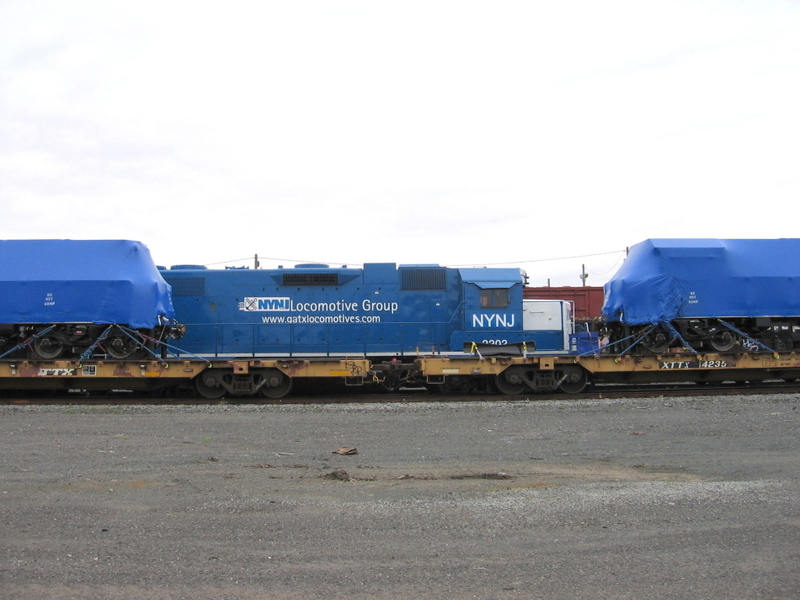 As of 2016, NYNJ Rail has both reinstated the use of reacher cars for drilling carfloats and teamed up pairs of locomotives "doubleheading" at both 65th Street and Greenville Yards. In regard to the reacher cars until late 2016; drilled their carfloats without the use of a reacher car. 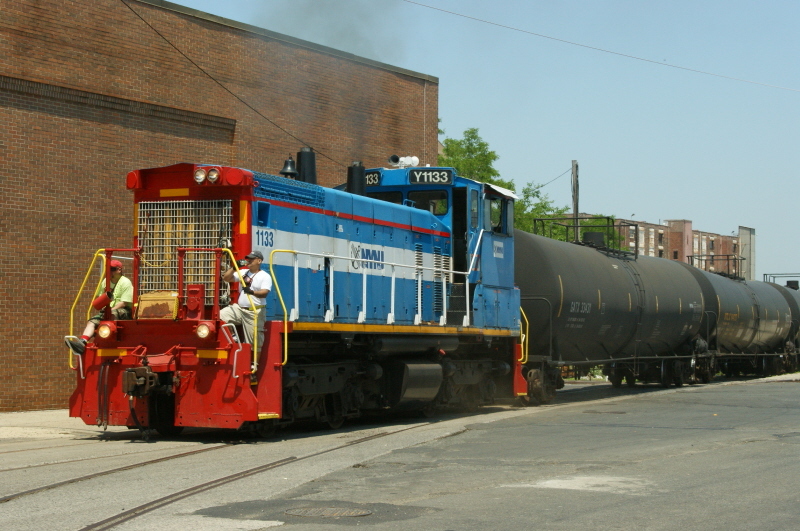 As of that date however, it appears two Norfolk Southern gondolas (NS 617759 and NS 617591 respectively) are partially loaded with ground up asphalt pavement and sectional concrete retaining wall blocks a/k/a "mafia blocks " and are being used in regular drilling operatings as idler cars. They are part of the regular railcar pool and may be returned at anytime. On 31 May 2011, both Philip M. Goldstein and Paul Strubeck visited Bush Terminal and took both still photography and videography of New York New Jersey Rail operations. The videos show both street running (which other railfans have taken as well); but the real interest lies with the videos of the float bridge operation and carfloat drilling. To our knowledge, these are currently the only videos showing this unique operation. 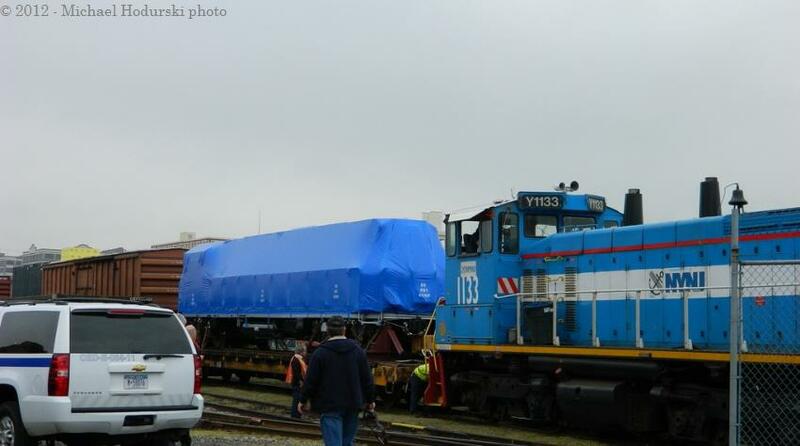 After much speculation, it was learned on 09 May that New York New Jersey Rail did in fact carfloat from Greenville, NJ; the first locomotive in the R156 order for New York City Transit Authority. The arrival of this locomotive had been anticipated for sometime, but an actual date was not known. Then photos of the NYCT locomotive were located with the locomotive having been photographed in the Transit System being hauled by South Brooklyn Railway locomotives. 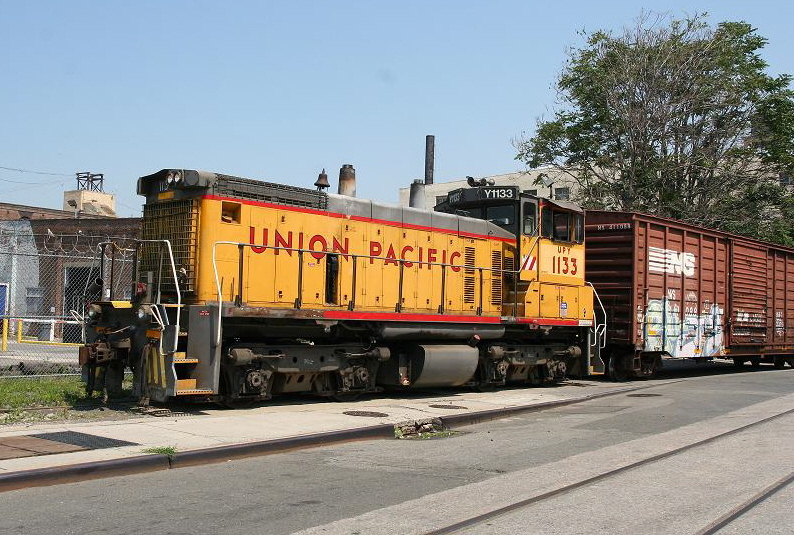 Several accounts in railfan forums had this locomotive arrive via CSXT over Hell Gate Bridge to New York and Atlantic Railway interchange at Fresh Pond Yard, Queens; and then with final delivery to Linden Shops. South Brooklyn Railway locomotives N1 and N2 with NYCTA Rider Car RD411 were seen towing the locomotive through the BMT system afterwards. Frustratingly, this is now confirmed to be partially incorrect. Both these kind gentleman were courteous enough to allow their images to be reposted here after originally being posted on www.nycsubway.org. Dave Pirmann of www.nycsubway.org also deserves recognition as well, for forwarding my emails to them to secure usage here. NYNJ Rail #1133 w/ NYCTA OL912 enroute to 65th Street / Bay Ridge Yard interchange with New York & Atlantic Rwy. 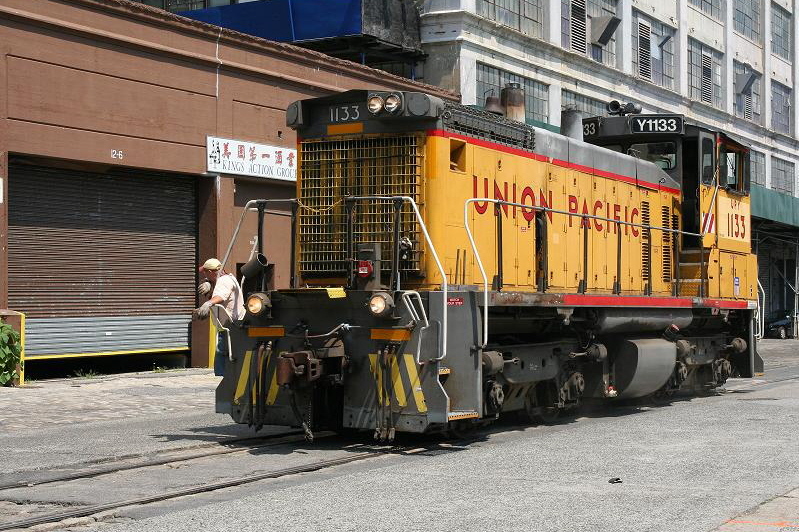 As of January 2014, time goes on, the New York City Subway locomotives continue to arrive. On 29 October 2012, Hurricane Sandy made herself felt in the New York Metropolitan area and directly affected operations of New York New Jersey Rail. Despite the hurricane making landfall just south of Atlantic City, NJ at approximately 20:00 hours EDST; the immense size of Hurricane Sandy impacted New York City. Winds from Hurricane Sandy were in excess of 90 miles per hour, with winds to some degree or another recorded at over 1000 miles away from the center of the storm. These winds caused an extensive storm surge, which was further exacerbated by a full moon tidal surge coinciding with a normal high tide. This caused extreme and record breaking flooding in the New York Harbor area. The surge level at Battery Park (Lower Manhattan, NY) peaked at 13.88 feet at 21:24 hours, Monday, 29 October 2012. This surpassed a 10.02 foot record water level set by Hurricane Donna in 1960. Furthermore, New York Harbor's surf also set a record during Hurricane Sandy, when a buoy measured a 32.5 foot wave that same evening. That wave was 6.5 feet taller than a 25 foot wave churned up by Hurricane Irene in 2011. 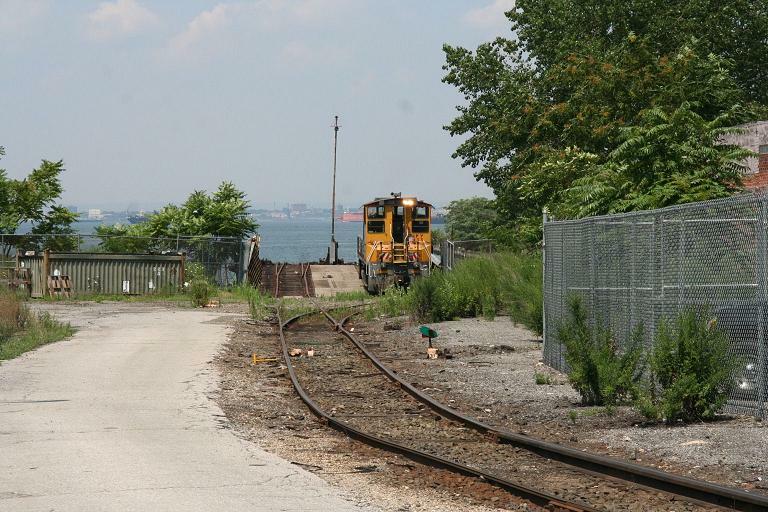 As the storm was travelling in a westerly direction, Greenville Yard (located on the west shore of Upper New York Bay) was more severely impacted that that of 65th Street / Bay Ridge Yard or Bush Terminal. A detailed report of damage and repairs will be forthcoming and published here. Most importantly, I have also been requested to help spread the word to railfans to please refrain from visiting the New York New Jersey Rail Greenville, NJ facility, because of the ongoing damage and repairs. Please respect this request. 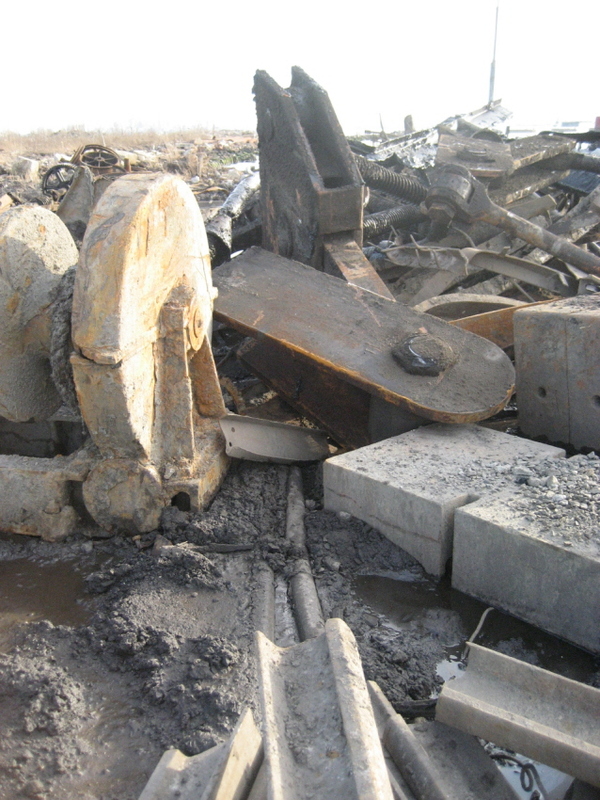 Substantial damage to gantries, float bridges and yard. 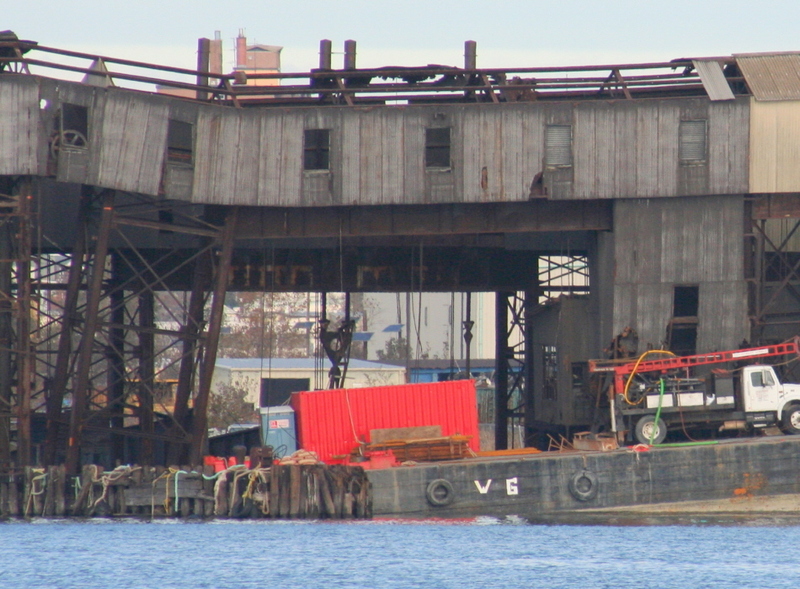 A deck barge was driven into the Apron Gantry over 10 Bridge. Float bridge gantries appear to have slight lean. 10 Bridge has significant lean and appears to be collapsing, 11 Bridge appears to have minor damage. Extensive flooding and debris / flotsam deposits in yard. Operations office trailer ripped from foundation, floated south to 'BMW' automotive unloading facility. 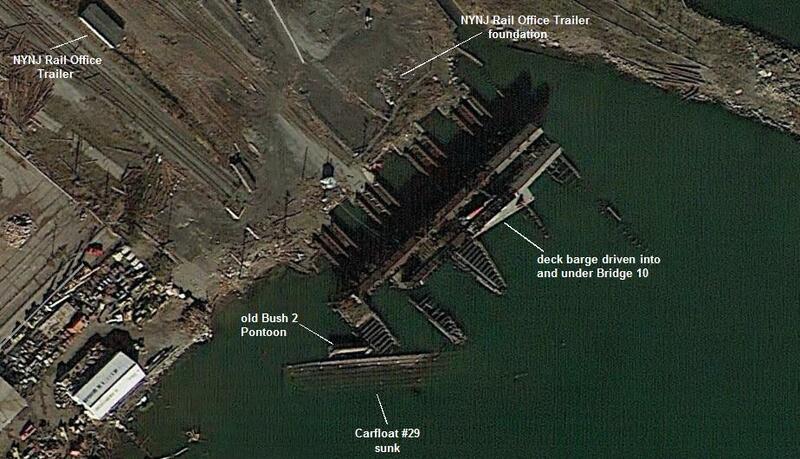 Most of the older concrete carfloat moorings significantly damaged. Electric winches on new float bridges obviously went under water. No damage as they are weather proofed. Internal sources state it will be at least several weeks before operations resume. Damage assessment ongoing, a more definitive timeframe for restoration of service will hopefully be forthcoming. 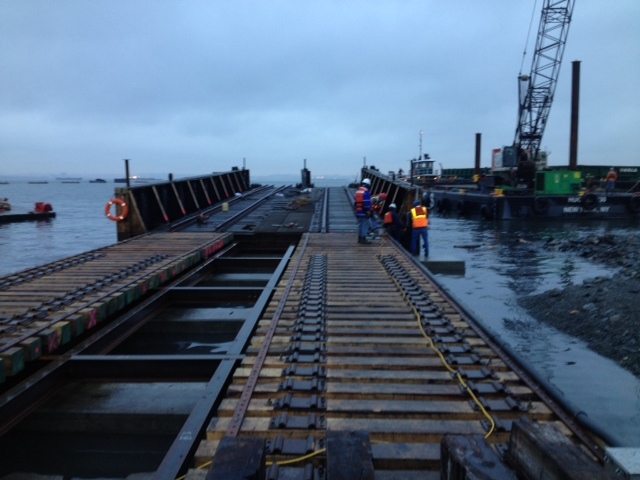 Previous report of old BAT pontoon float bridge being refloated by storm was incorrect. It turned out to be "Jersey Barriers" on the bulkhead. Sorry for the false report. 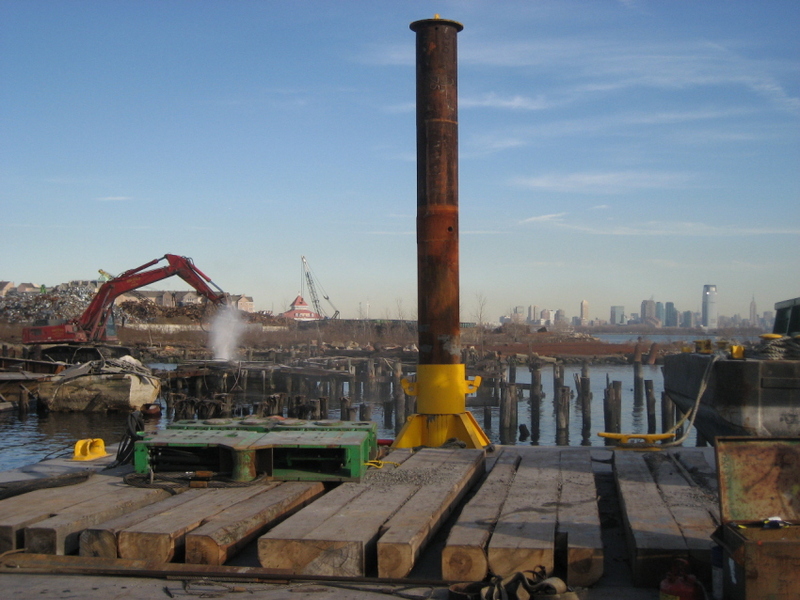 The following images were furnished by Paul Strubeck, who transited through New York Harbor onboard a tugboat on November 2, 2012 (Four days after Hurricane Sandy). Like the old adage, a picture is worth a thousand words. Transfer Bridges 12 through 9½. The apron gantry and bridge apron were removed prior. Note there is a sunken carfloat in front of Bridge #12 with deck and cleats just above the water surface. Transfer Bridge #12 and #11. Box shaped structure on left edge is former Bush 2 float bridge pontoon. 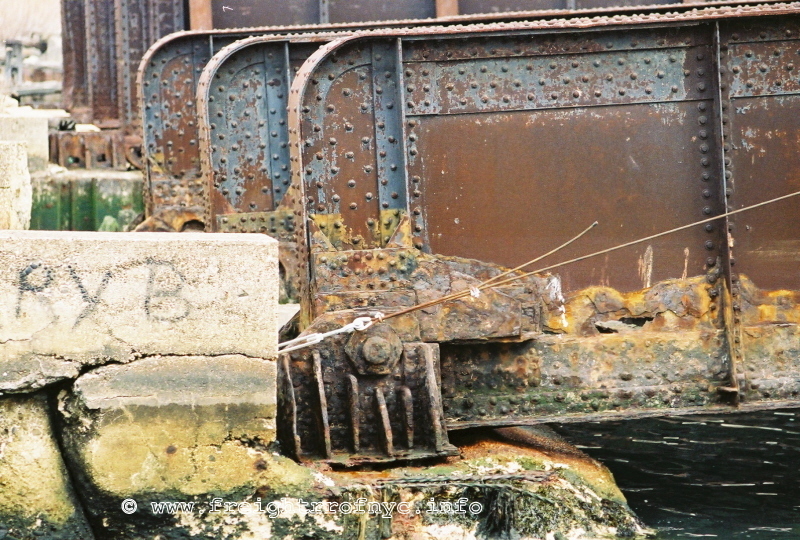 Sunken carfloat with "broken back" in front of Bridge #12 (note how rails curve into water). 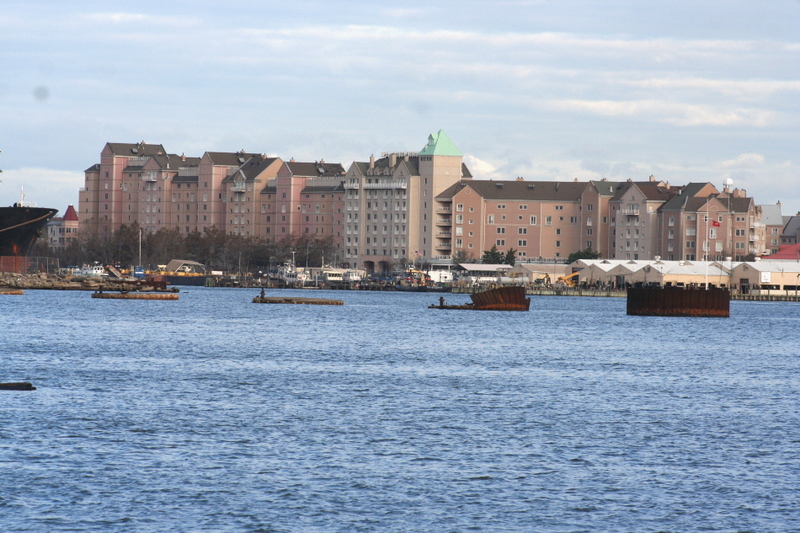 Boxy shape on extreme left was old pontoon from Bush Terminal "Bush 2" Bridge. It is believed this is Carfloat #29. It appears the counterweight / support towers for 11 Bridge are now leaning slightly towards 10 Bridge, due to the collapse of 10 Bridge support tower. Transfer Bridge #10 and #9½. Note how the Apron Gantry is now severely sagging and bent over 10 Bridge. Note the sagging of apron gantry over 9½ Bridge as well. and has come to rest on top of the finger piers parallel to the apron gantry / perpendicular to the slip; as the water receded. 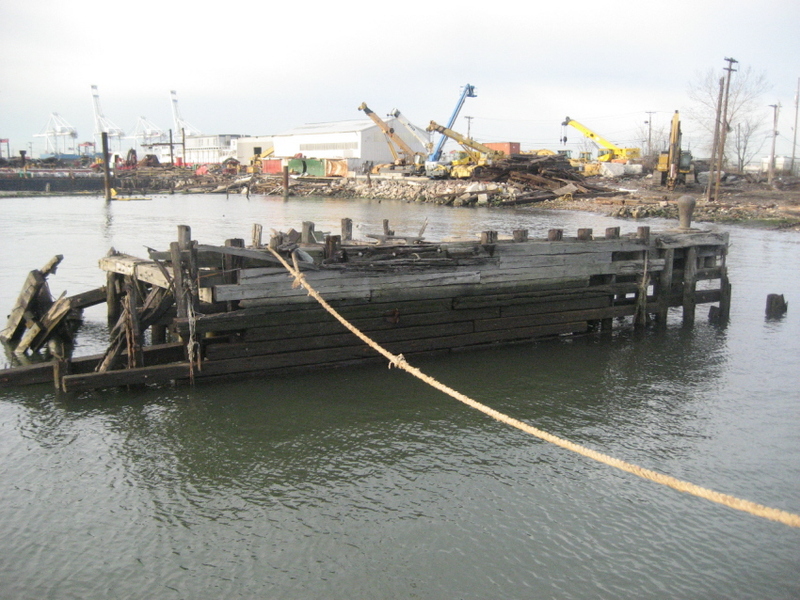 These carfloat / barge tie up anchorages were all the same height prior to Hurricane Sandy. It appears they left most four have been underscored and now sit lower in the water by several feet. It is my sad duty to report that as of Saturday 17 November 2012 at 5:40 pm EST; the Greenville transfer bridge gantries were demolished. My source confirmed the fear the Hurricane Sandy severely underscored the support pedestals, and on top of that; drove a barge into the gantry columns. 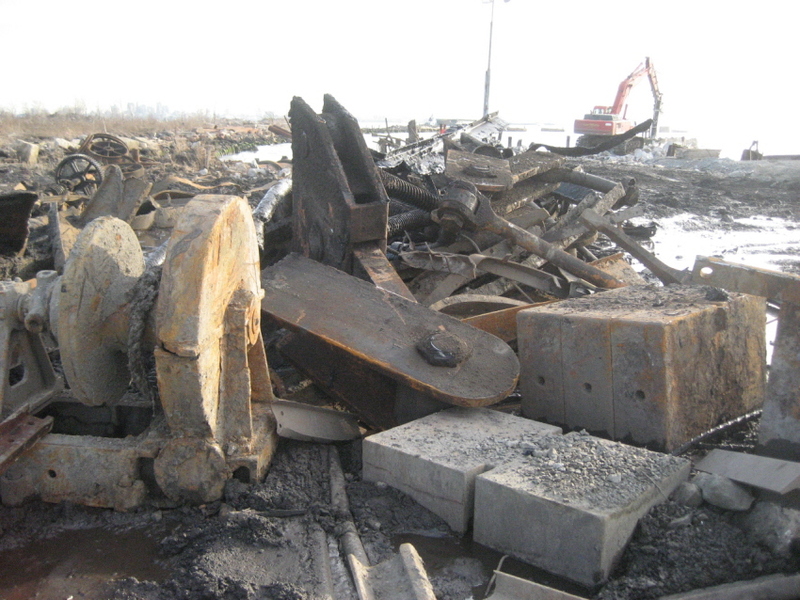 After several engineers examined the structure, it was deemed unsafe and ordered to be razed. I have to add my opinion here. While talking with my source, I feel the correct decision was made. As much as I love the history of New York Harbor Rail Marine infrastructure, there comes a time when you have to make a decision to move on. You can't save everything. 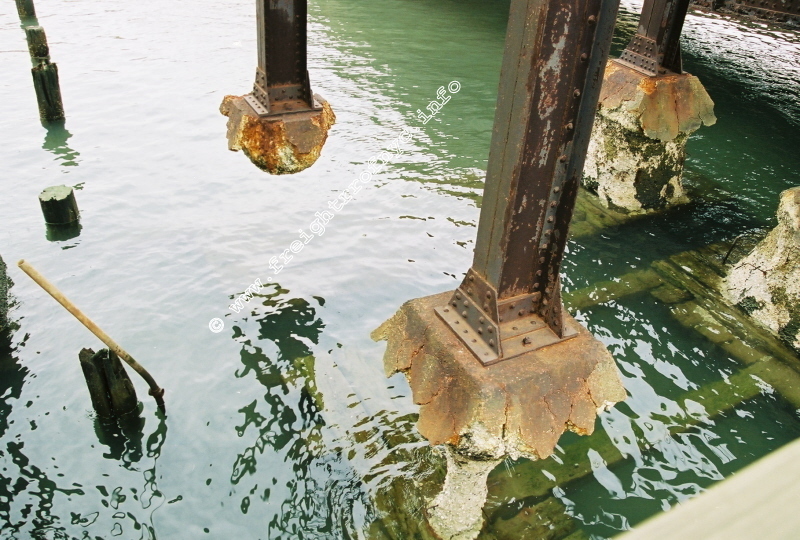 If you spend the financial resources saving 81 year old float bridge gantries, you can not invest in the future. 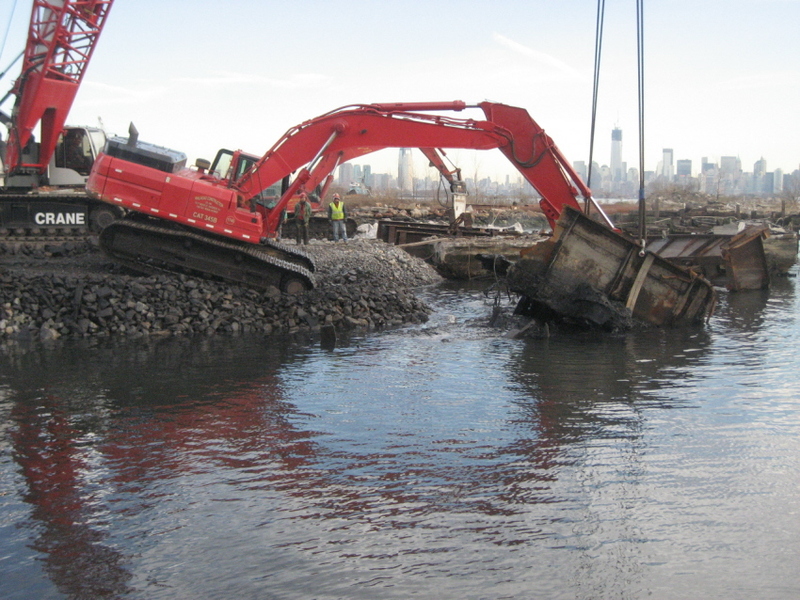 And if we as a group (the Rail-Marine fans) are interested in seeing carfloating operations continue in New York Harbor, sacrifices have to made. Paul Strubeck shot the following image from 58th Street pier in Brooklyn. No more gantries. 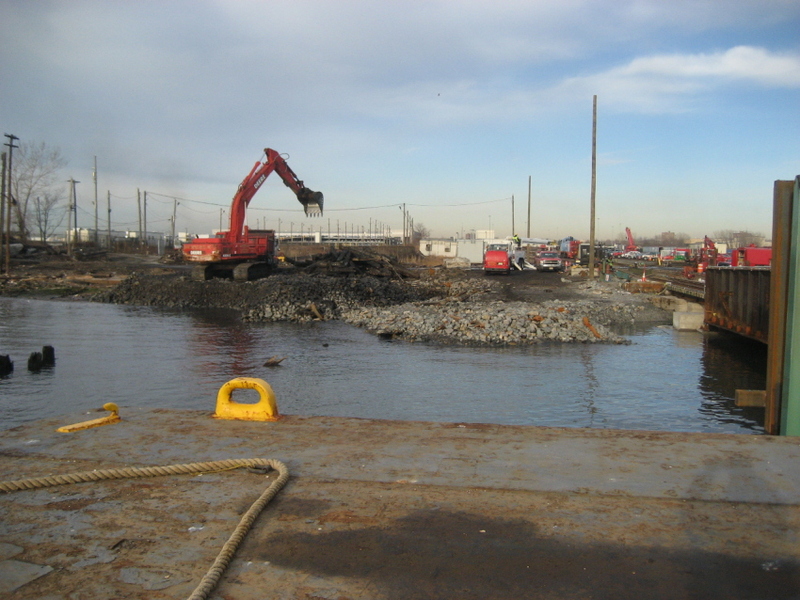 The floating cranes are in the process of constructing the new float bridge approach. Crane on right is driving piles. So, the demolition of the Greenville transfer bridges ends an important chapter in the history of New York Harbor transfer bridges, but if there is a positive side, (and if my source is correct and so far has been "on the money"); a new era of carfloating in New York Harbor should be emerging in the near future..
For the record, Weeks 533 with its 500 ton lifting capacity, is third largest floating crane on the Eastern Seaboard, and the largest fully revolving floating crane on the Eastern Seaboard. 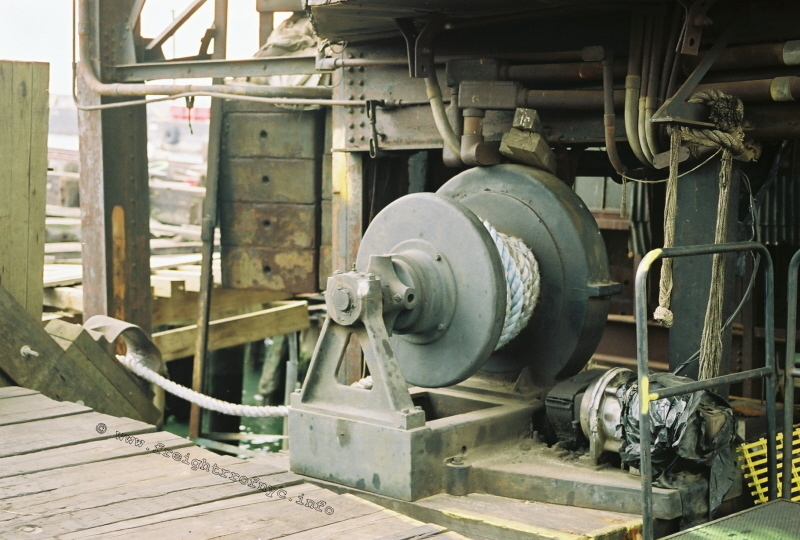 The Weeks 533 was originally called the Marine Boss and was built in 1965 for Murphy Pacific Marine to be used in the construction of the San Mateo bridge in California. It was bought in 1988 by Weeks. 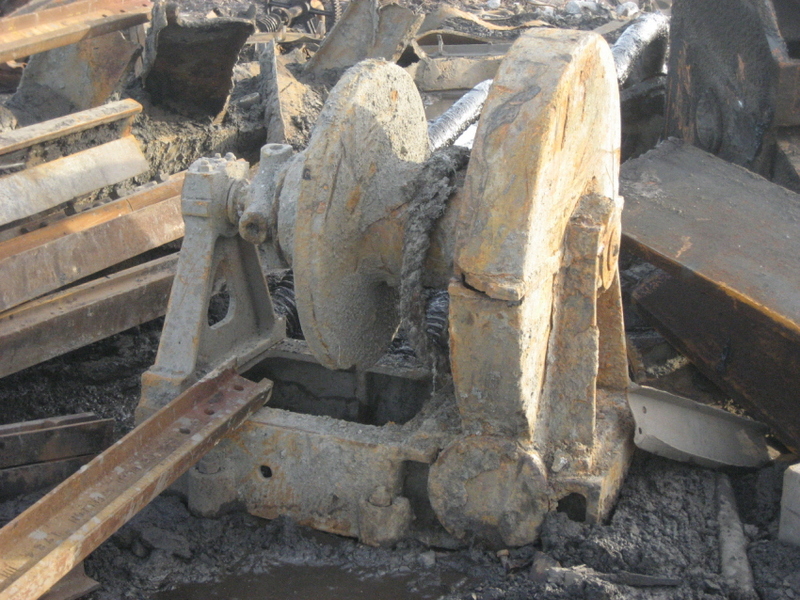 It was originally purchased for parts, but as fortune would have it, it would be rebuilt. 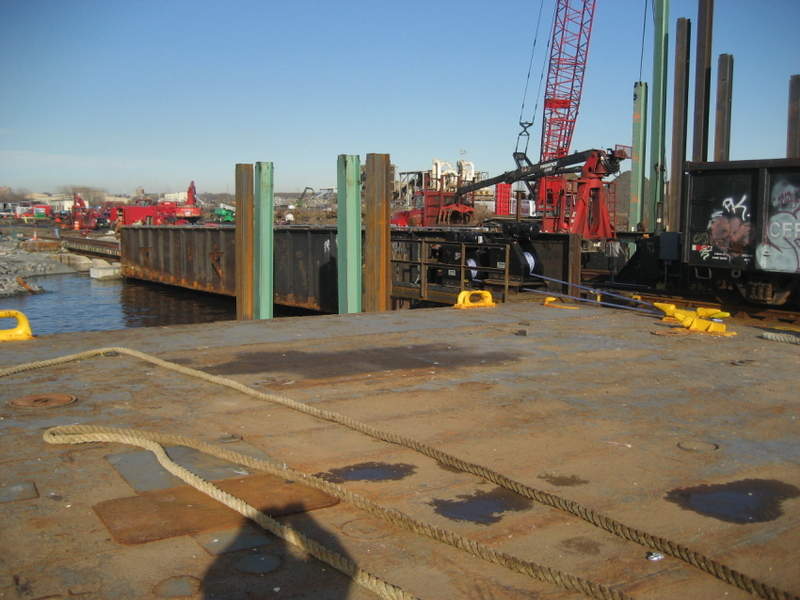 The Bush Terminal float bridge is being transferred to Greenville, where it will be placed in service to allow carfloating to resume between Greenville and Bay Ridge. 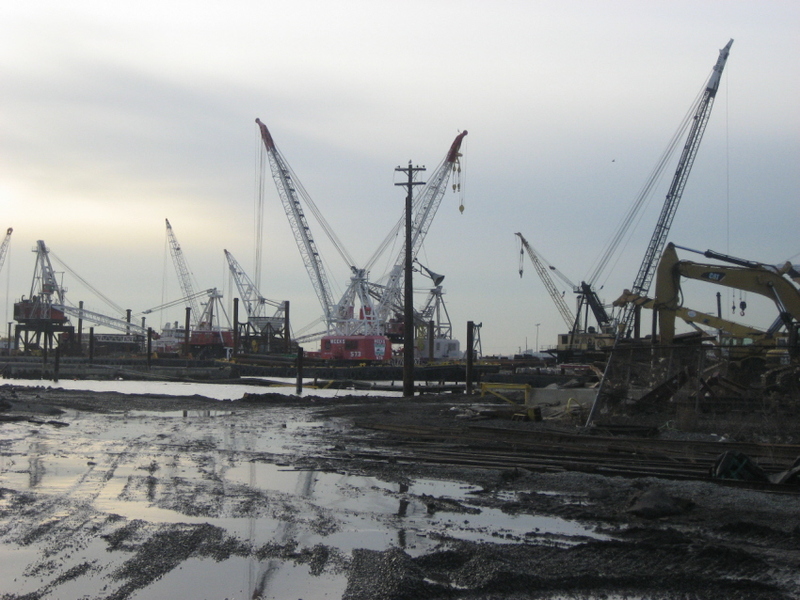 A few hours after the floating crane left Bush Terminal, Paul Strubeck shot these photos of the empty float bridge slip. Reliable internal sources have honored their promise to keep this author in the loop on the ongoing reconstruction of the Greenville facility. Throughout the Greenville reconstruction phase I have been kept abreast of the details by a very reliable high placed source within the organization, but could not publish them. On 21 December, my contact (to whom I remain eternally grateful for keeping me in the loop! ); contacted me via telephone once again: the embargo was lifted off New York New Jersey Rail Operations as of this day, with revenue service is expected to return following the holiday season. 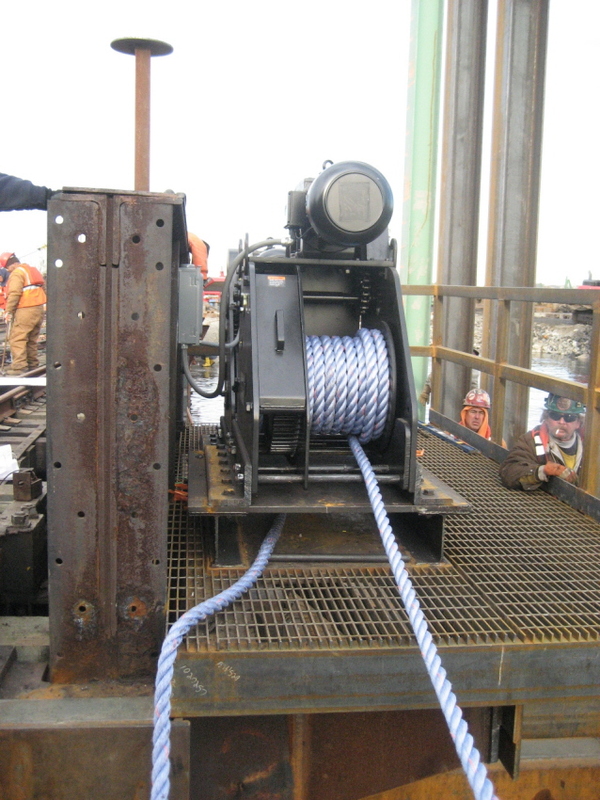 A test run on 20 December including loading, unloading and carfloat mooring took place, and was successful. While many other details and support infrastructure still remain to be completed (yard lighting, access roads, offshore mooring piles for the carfloat(s), operations / crew office, etc. ), construction is anticipated to continue throughout the winter (barring any severe weather). However, this rapid completion of the essential services allows New York New Jersey Rail to lift the embargo and return to revenue freight service. 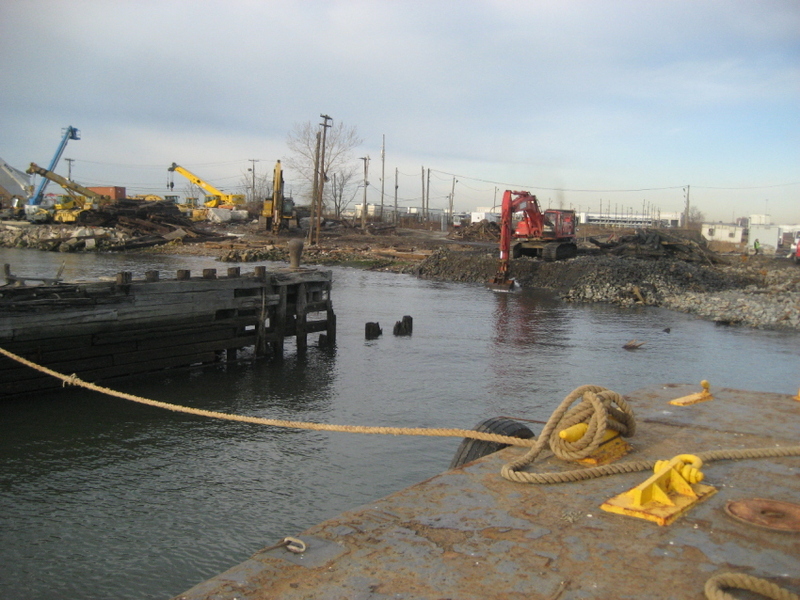 If you would make mention that in 52 Days from October 29, 2012 when Hurricane Sandy hit and the surge caused massive damage to the NYNJR infrastructure at Greenville Yard Jersey City and also to 65th Street Brooklyn NY - we are able to do an amazing recovery - using an outstanding plan of action which finished on December 20, 2012 in success. 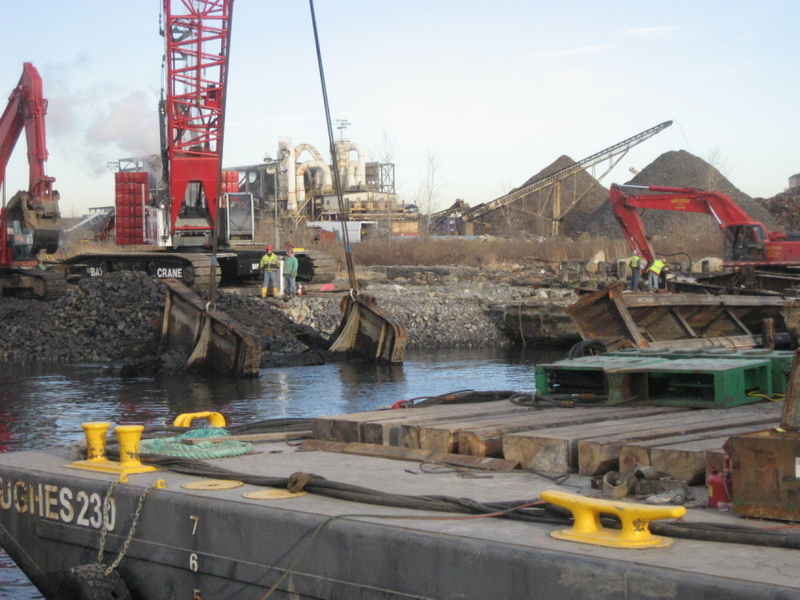 The taking of the 51st Street Float Bridge in Brooklyn, taking down and removal of the severely damaged Greenville Yard Liftbridge and and redeployment of the new "Greenville Pontoon Bridge" will go down as one of the most incredible recovery stories. Truly our railroad forefathers would have been proud." 52 days... When you realize this is less than two months, and the amount of work involved, it is truly astounding what was in fact accomplished. NYNJ Rail employees worked many extra hours and through the Thanksgiving holiday. Many sacrificed personal time with their families, and all deserve a huge round of credit for their accomplishment! 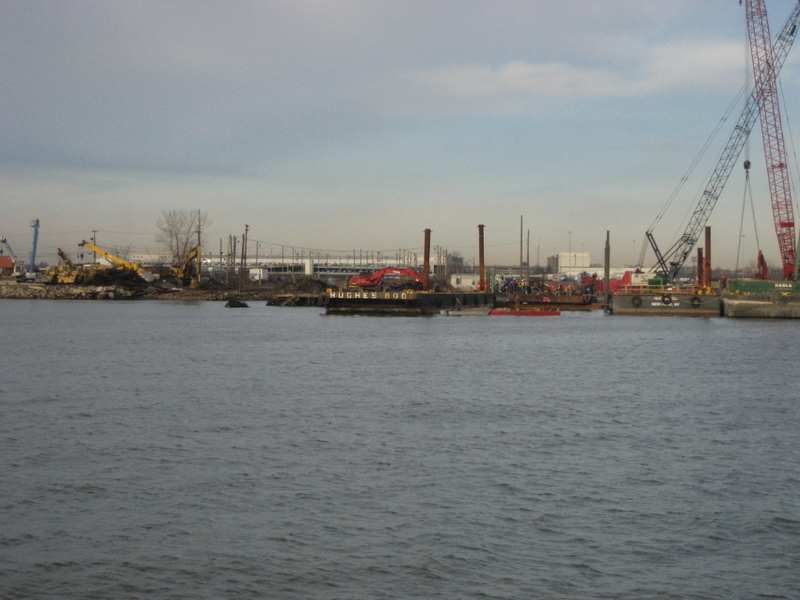 Empty gondolas loaded aboard Carfloat 16 in Brooklyn at the 65th Street Yard, floated across Upper New York Bay to Greenville, where the carfloat was moored to the float bridge, and cars unloaded successfully and without incident. Upon completion of such, the freight embargo which was instituted by NYNJ Rail on October 29, has been officially lifted. Revenue service is expected to resume to NYNJ Rail customers after the Christmas holiday. The former 51st Street float bridge or "Bush 2 Bridge", is being officially referred to now as "Greenville Pontoon Bridge". I have been forwarded many images taken by this reliable source for publication here as well as by NYNJ Rail employee J. Lada, to whom I am also grateful. 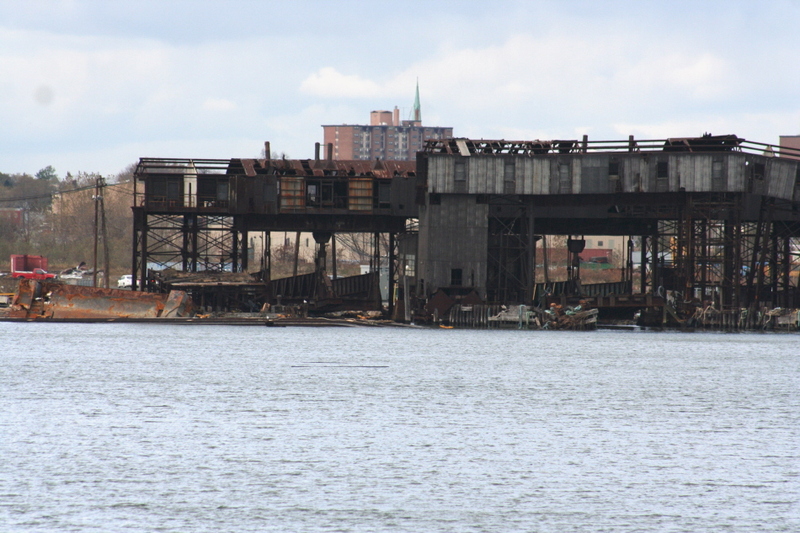 I am now able to share all these images with the New York Harbor Rail - Marine community. Without further ado; here are the images of the construction, debris and test run. Please refer under images for dates. "Bush 2" at it's new home! 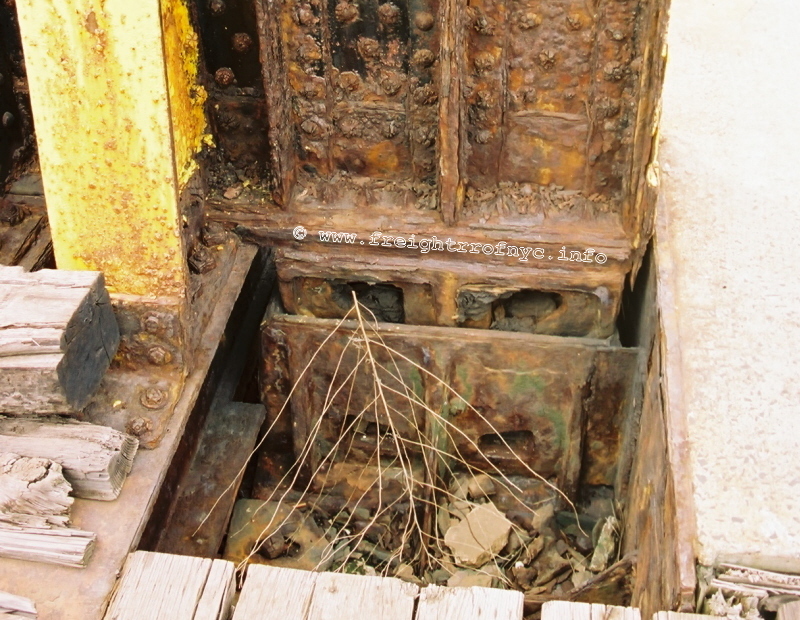 Remains of a section of one of the old float bridges. I'll bet the train crews are ecstatic! The new pier trestle with float bridge lead trackage. NYNJ Rail #2293 waiting patiently! Toggle bar and toggle bar sockets. apron had collapsed into the water many years prior to Hurricane Sandy. 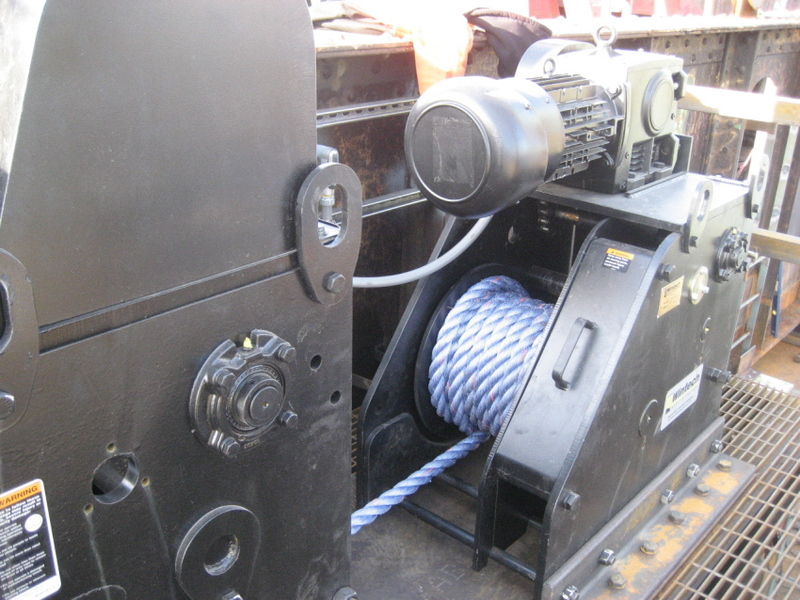 Winch, center equalizing yoke, eyebars and lifting screws. 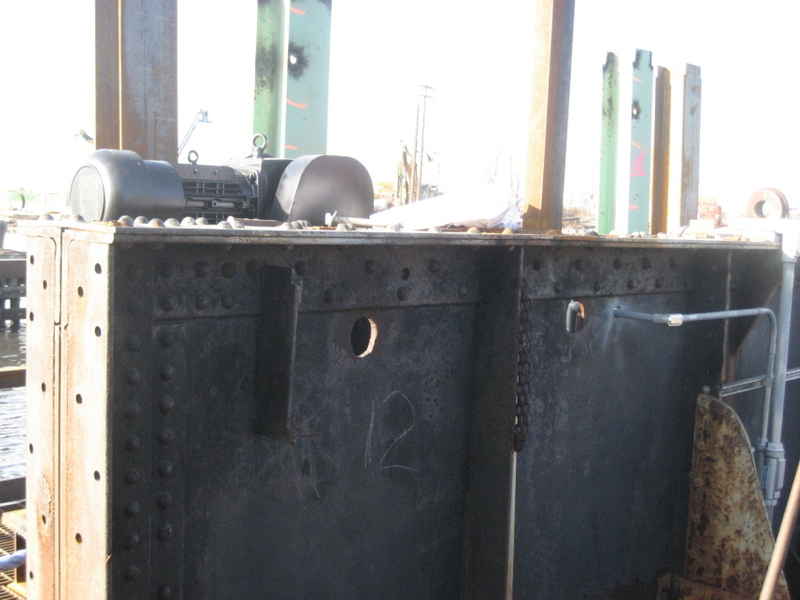 Electrical service panels and junction boxes on the old float bridge jack A frame. 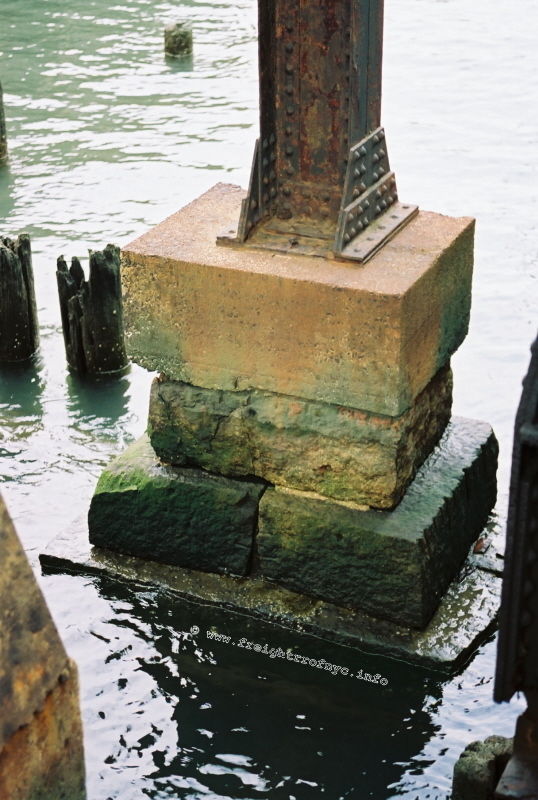 Remains of one of the original fender piers. for the first time during test run. 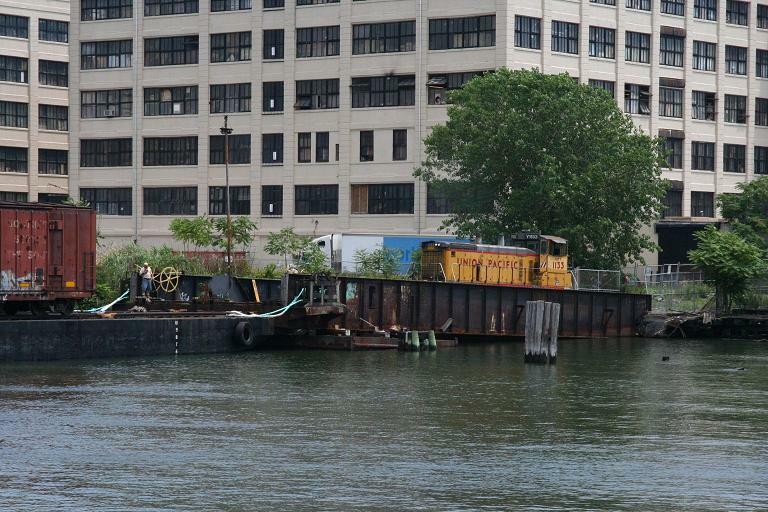 NYNJ Rail #2293 begins to drill the test carfloat. Note walkway grating has been installed up the center of the pier trestle. The author once again would like to thank his "internal source" for the images, and constant updates! As the years march on, subtle but important changes are taking place at NYNJ Rail. As a result of the demolition of the old PRR Greenville transfer bridges, designs for a modern transfer bridge system and associated carfloat were put forth, reviewed, approved, put out for bid and the budget allocated. While the construction of the transfer bridge system is still ongoing, I am however pleased to report that one of the new four track carfloats was launched by Metal Trades in Yonges Island, South Carolina on November 10, 2017. This also has the benefit of allowing the current design of three track carfloats to continue to be used as well, if so desired. It should go without stating, that we are keeping a close eye on the developments, and stay tuned for further updates as they take place. 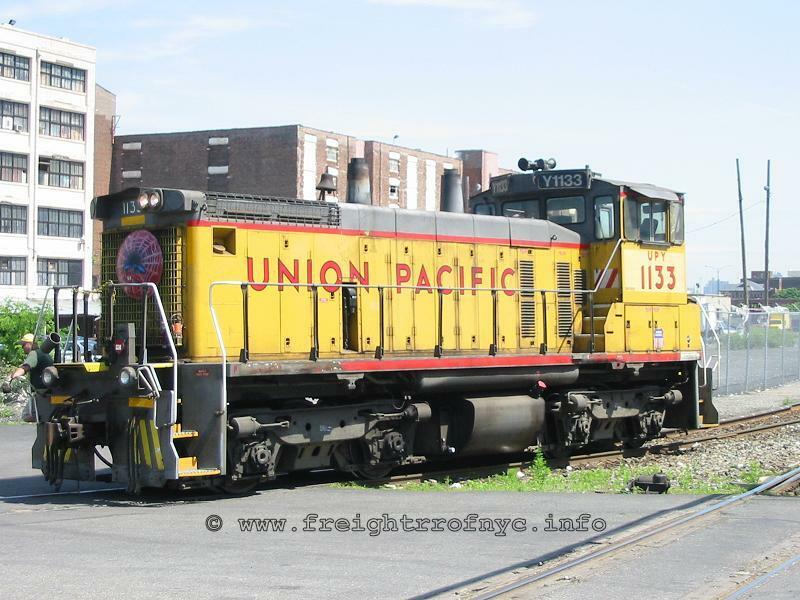 In 2004, the predecessor of New York New Jersey Rail: New York Cross Harbor Railroad purchased two ex-Union Pacific Yard (UPY) Electro Motive Division model SW-1500 Switchers. One of these locomotives remains in service today. 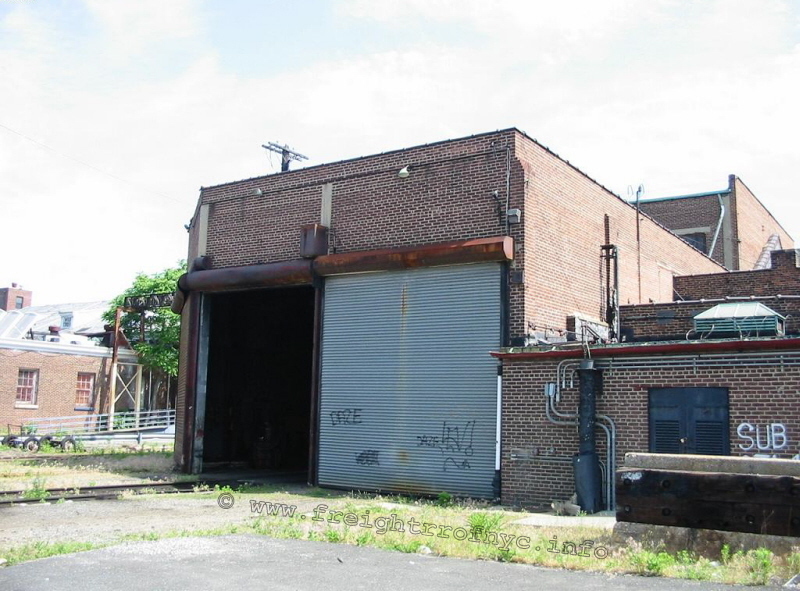 The other unit was sold / traded to Juniata Terminal and is no longer on the property. 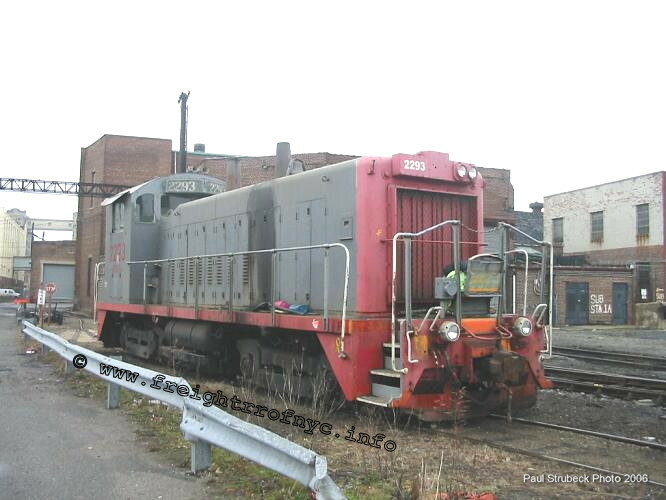 BDLX #2293 would arrive in 2000 in red & gray primer, and would not be repainted by the New York Cross Harbor Railroad. 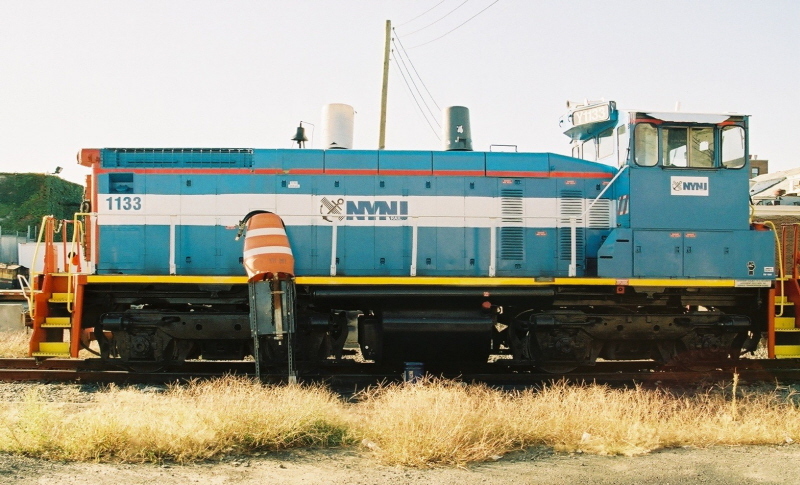 In 2006, upon the New York New Jersey Rail purchase, this locomotive would be painted in a red and green livery by New York New Jersey Rail. This livery was euphemistically called the "Christmas" livery by area railfans. 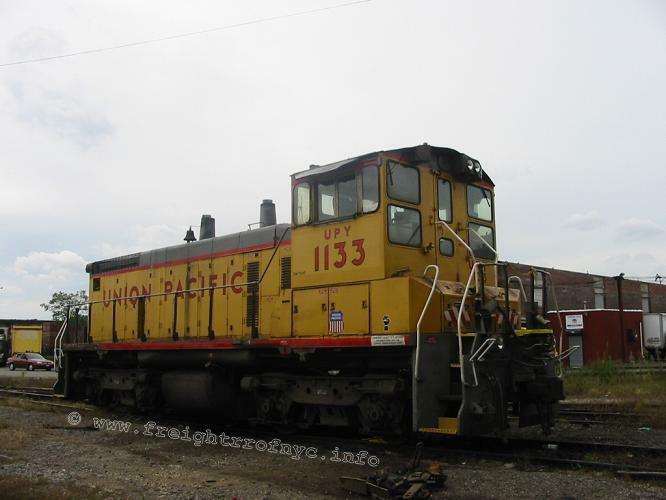 UPY #1133 was to remain in Union Pacific Yard livery (yellow with red lettering) right up until May 2010. Fortunately, pictures were taken the very weekend that the locomotive was repainted and this webpage has the first photographs of the new but incomplete livery. 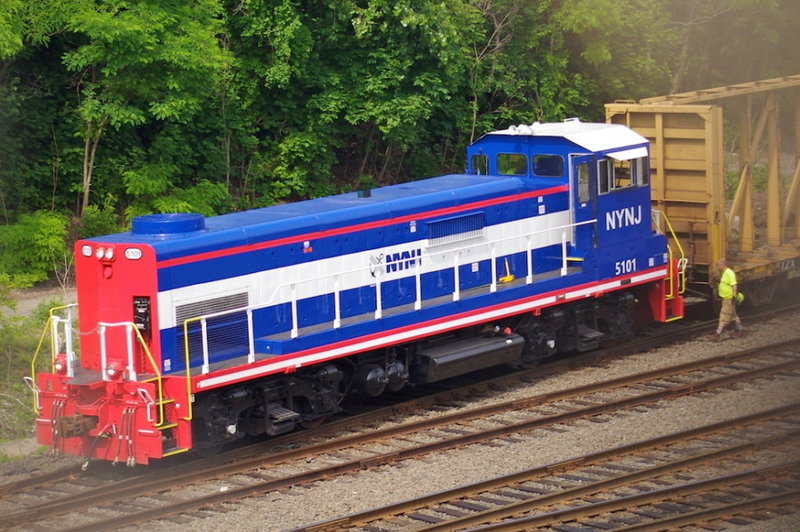 It is now red, white and blue: blue body, red ends with a white stripe and the NYNJ Rail logo within the white stripe. 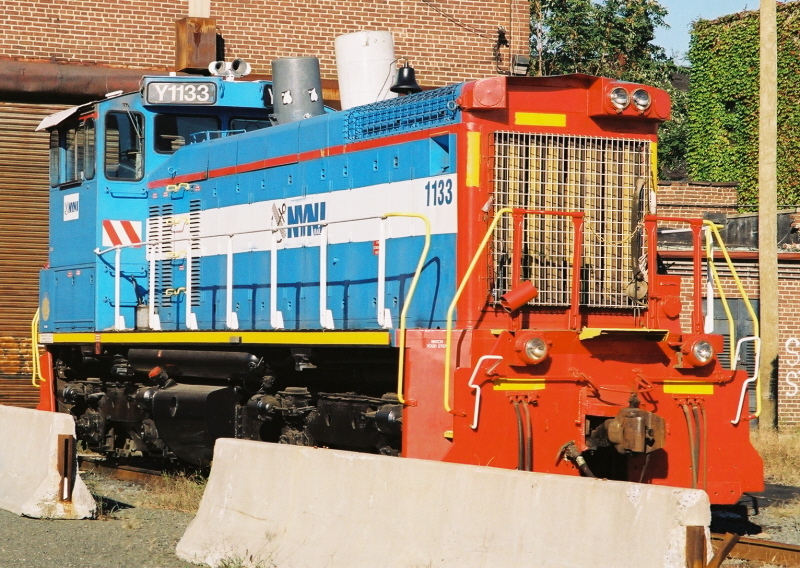 In May 2010, it was learned that NYNJ Rail has once again repainted locomotive #2293 and now both locomotives (#2293 and #1133) are in a unified NYNJ Rail livery. This would mark the first time in 12 years that two locomotives operating for the sole remaining New York Area carfloating operation would share the same livery! 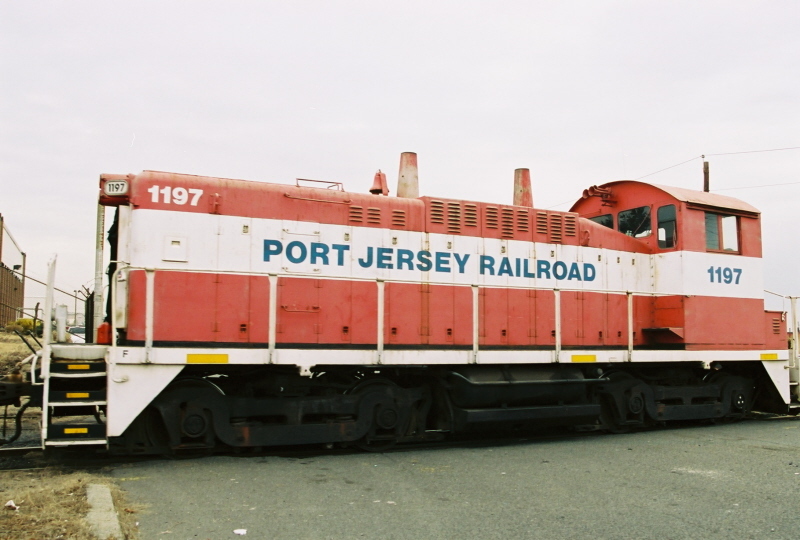 As a result of the Port Jersey Railroad purchase of December 2010, PJRR #1197 has been seen operating on the New York New Jersey Rail's Greenville float bridges. Therefore, that locomotive is now included in the roster and photos. 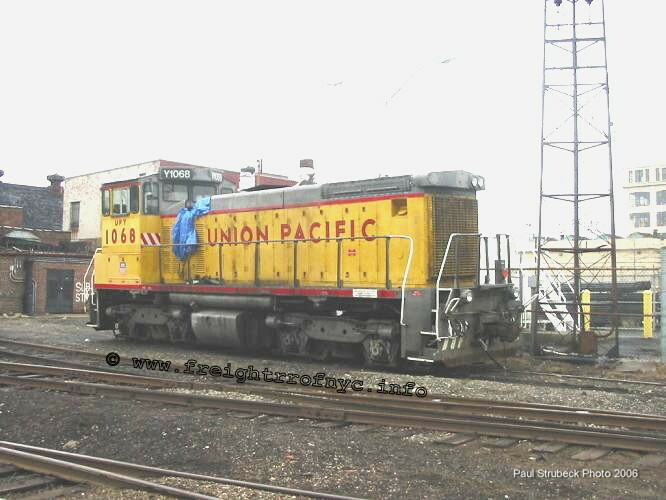 Whether it will be painted in NYNJ Rail livery or will continue to have it's own identity remains to be seen. 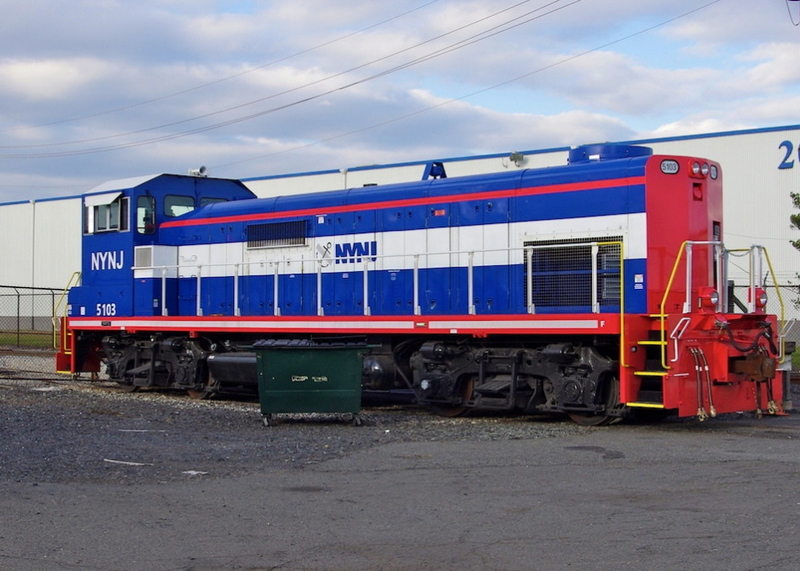 August 2011: I have just learned via Paul Strubeck that the Port Jersey locomotive has been repainted quite recently (like within last few weeks) into the blue - white - red livery as the other two New York New Jersey Rail locomotives are painted. Following that, it has now been seen lettered for Port Jersey. On or about July 2013, two EMD GP38-2 locomotives were leased from GMTX Locomotive Leasing. GMTX #2202 arrived first and was assigned to Greenville Yard operations in New Jersey. 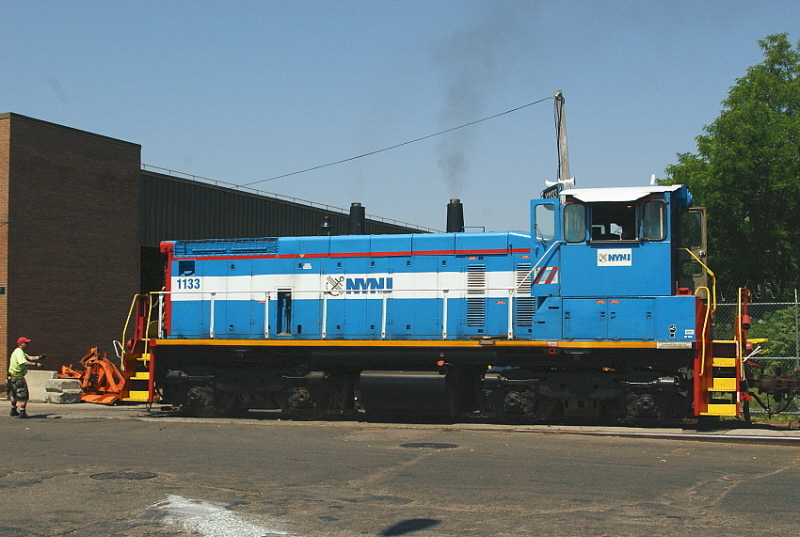 GMTX 2202 seen with NYCT R156 locomotives being delivered. A third locomotive, GMTX #2200 arrived to replace #2213. 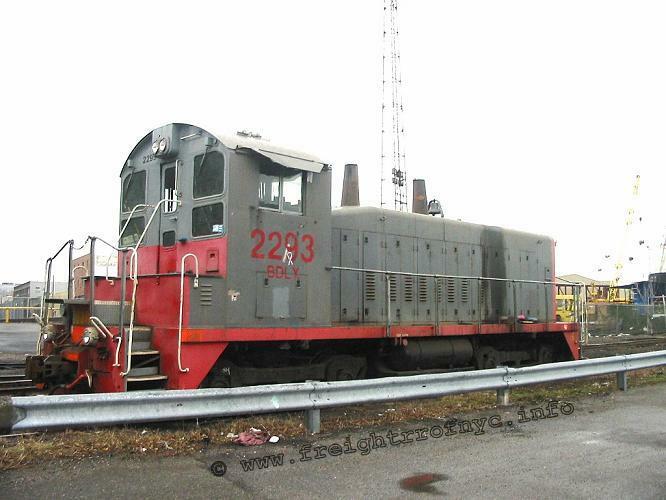 #2200 passed company inspection, and this locomotive was assigned to 65th Street Yard operations in Brooklyn, NY. 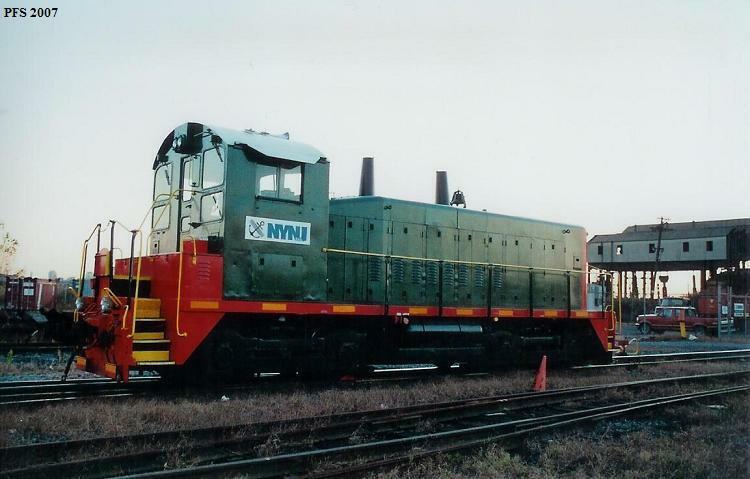 It should also be noted that sometime in late January 2014, another locomotive showed its presence in Brooklyn, NY and thereby adding some confusion and excitement to the history of NYNJ Rail. RSSX #3766, a "LEAF" locomotive, (Lower Emissions And Fuel) a/k/a an ultra low emissions gen-set locomotive. This locomotive is destined for Brookhaven Rail Terminal located on Long Island in Yaphank, NY. 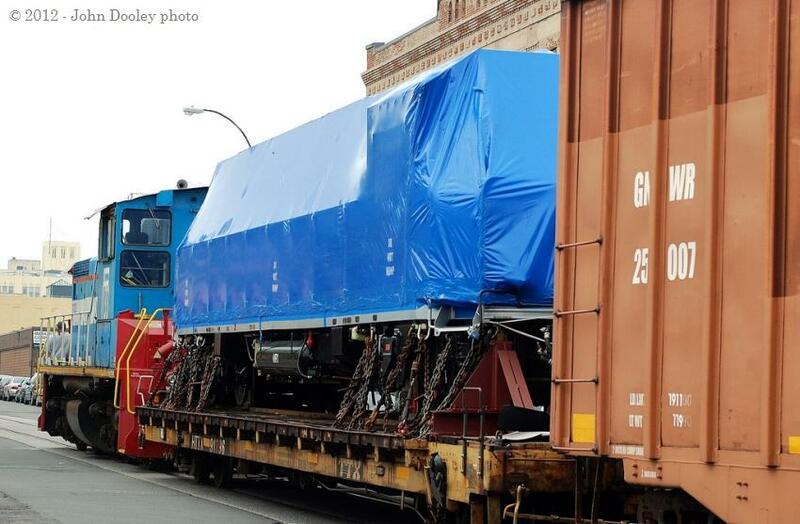 After final inspection, the locomotive will be forwarded to its destination, but this locomotive was never leased or purchased by NYNJ Rail and it is merely in transit. 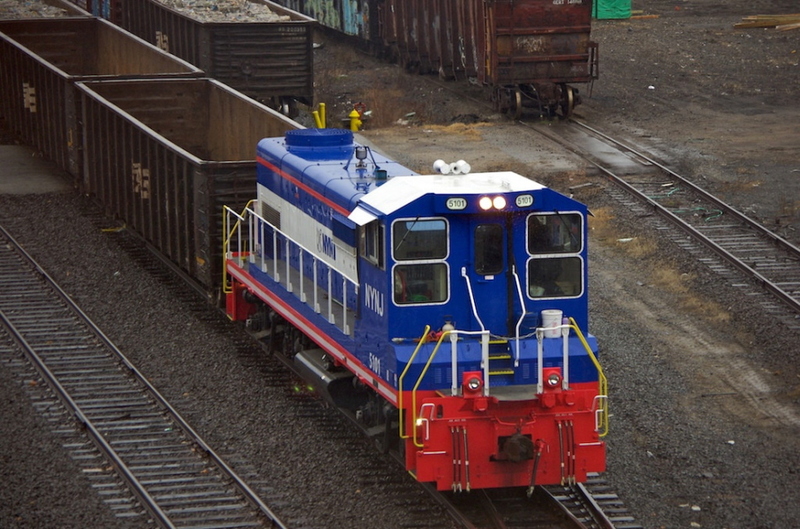 With the implementation of EPA Tier 4 Emissions, and with current industrial management thinking of "going green" for better public relations; New York New Jersey Rail applied for funding and received same for the purchase of three new locomotives meeting the EPA's tightest restrictions yet. These three locomotives would be constructed by Knoxville Locomotive Works of Knoxville, Tennessee, USA. These locomotive would be built using MTU Series 1600 12V diesel engine coupled to AR10 alternators via an intermediate gear reduction drive. These locomotives therefore are not considered "gen-sets", but I would classify them as low emissions. The first two locomotives (#5101, #5102) were seen on property in June 2015, with the third (#5103) arriving late December 2015 / January 2016. With the arrival of the third unit; #1133 was seen with it NYNJ lettering covered and heading southwest in an Norfolk Southern freight consist through Bristol, Tennessee. Whether it was sold outright to unknown firm or not has not be learned. 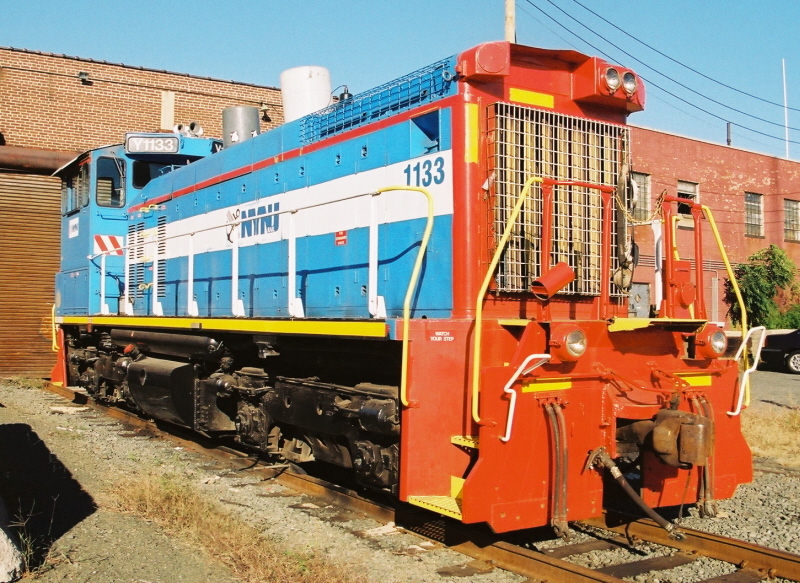 It is hypothesized however, that #1133 might be being used as a trade in toward one or or more of these three new locomotives, but this has not been confirmed as of yet. 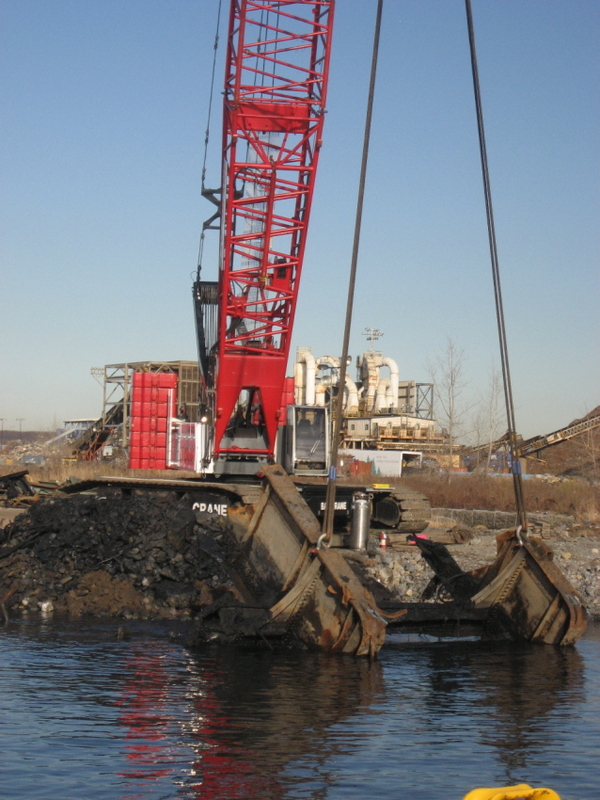 As these units are broken in, it has been heard through the grapevine that they are underpowered for the required work of drilling the carfloats in Greenville, NJ. Therefore two of the locomotives are MU'ed together. This information should not come as a complete surprise to anyone, however. 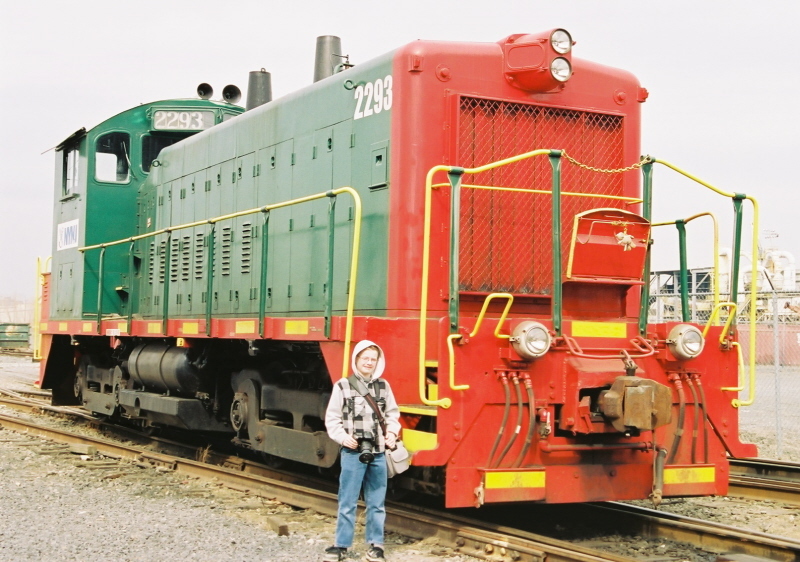 As I have been told firsthand from many locomotives crews throughout the US that operate low emissions switchers or gen-sets; the newer "green" switchers/road switchers tend to be underpowered in an effort to reduce emissions, with the result in having to be connected in multiple units with similar / sister locomotives to accomplish what one older switching locomotive accomplished. It is similar the ecologically conscious thinking of a watersaving toilet. The new toilets flush at 1.6 gallons, old models at 3 gallons per flush. But with the reduction in water flow in the effort to "save water"comes the problem of not flushing a "full bowl" satisfactorily, requiring multiple flushes. So 1.6 gallons times two flushes equals 3.2 gallons: A negative of .2 gallons (about a quart of water). Three flushes is 4.8 gallons resulting in the additional usage of 1.8 gallons over an older toilet. So where is this water savings? This correlates in regard to the rationale of ultra low emissions / gen set locomotive operations: if you need two or even three locomotives to do the job of one locomotive (even if the newer locomotives are cleaner), that potential return in lower emissions and fuel saving is put off even longer. Plus you now have two or more operating assemblies instead of one for increased cost in maintenance and repair. Seems kind of like backwards thinking. It is also understood that with the arrival of these locomotives, minor changes to idling and start up operating procedures have been made to the delivered locomotives. Information I have received (if correct), has it that the Port Authority of New York and New Jersey (the owning agency of NYNJ rail) requested to have the locomotives be shut down when not in use. Therefore this required the installation of "HotStart" engine block coolant and lubricating oil heaters, as well as battery maintainers. 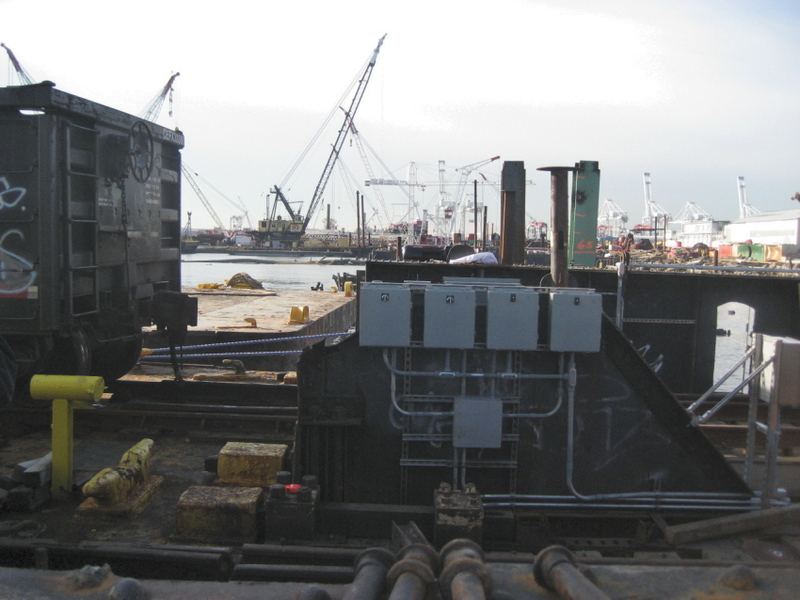 This required the installation of appropriate electrical connections in the yards at Greenville, NJ and Brooklyn, NY. In fresh NYNJ "Christmas" livery. Waiting on an incoming carfloat. In front of the enginehouse. Spotting an empty bulkhead flat from Davidson Pipe. Heading down to the float bridge. Ready to refuel at the diesel pump. "John P. Brown" with carfloat. 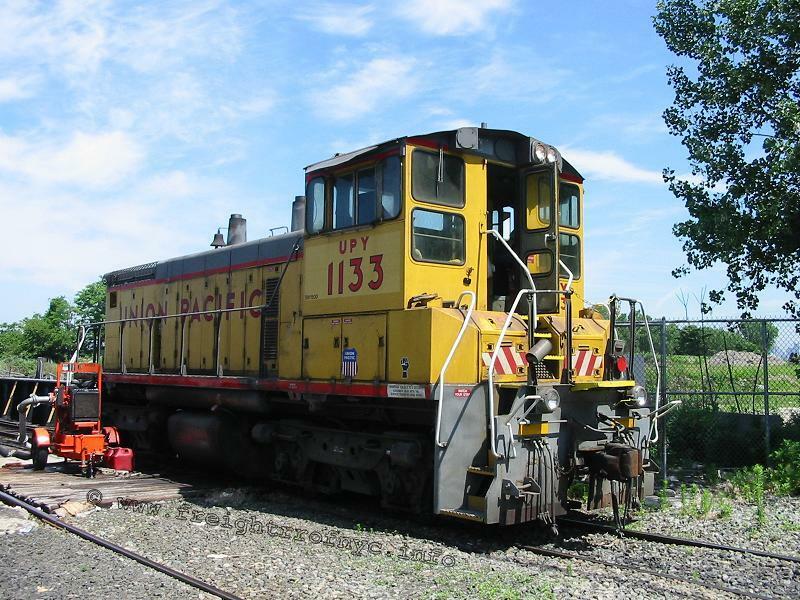 All locomotives listed in the rosters above are standard gauge (56.5" / 4' 8 ½ ") and are of B-B (four powered axles) wheel arrangement..
New York New Jersey Rail does not own any tugboats for the transport of carfloats to / from Greenville, NJ or Bush Terminal, Brooklyn, NY. 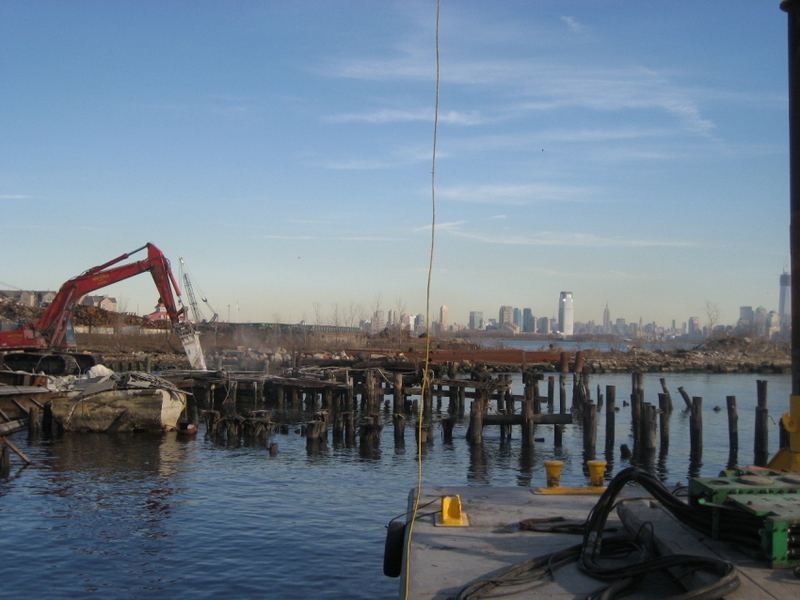 Instead, the Port Authority of New York and New Jersey contracts with established towing companies in New York Harbor. 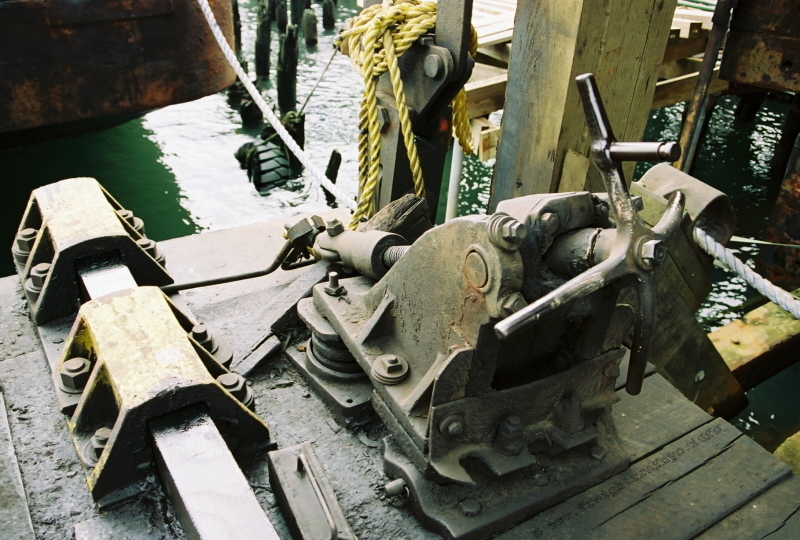 The first towing company contracted by PANYNJ was Brown Towing. 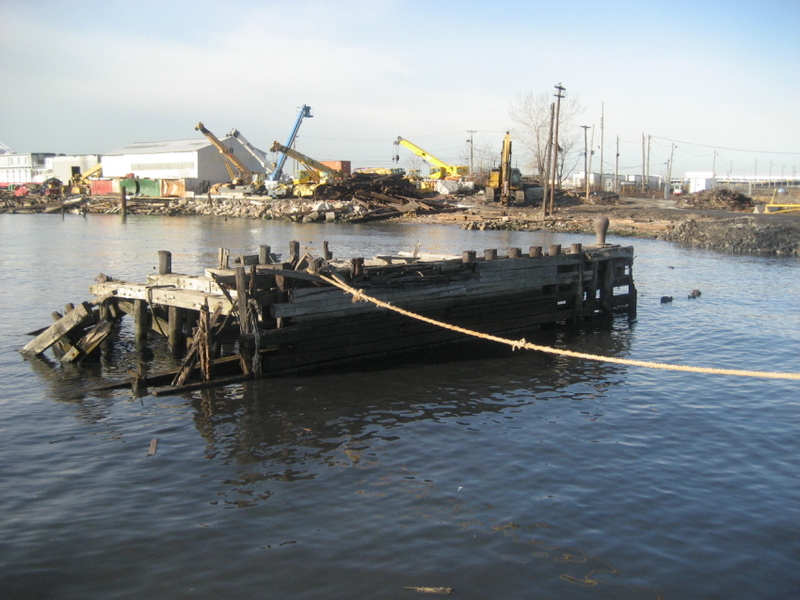 Currently as of 2011, the contract is assigned to McAllister Towing & Transportation. 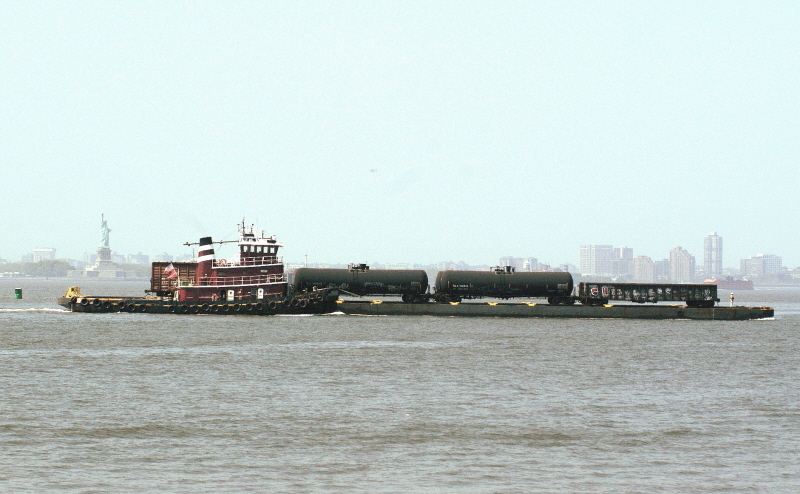 The "John P. Brown" of Brown Towing prepares to moor a loaded float to Bush 2. 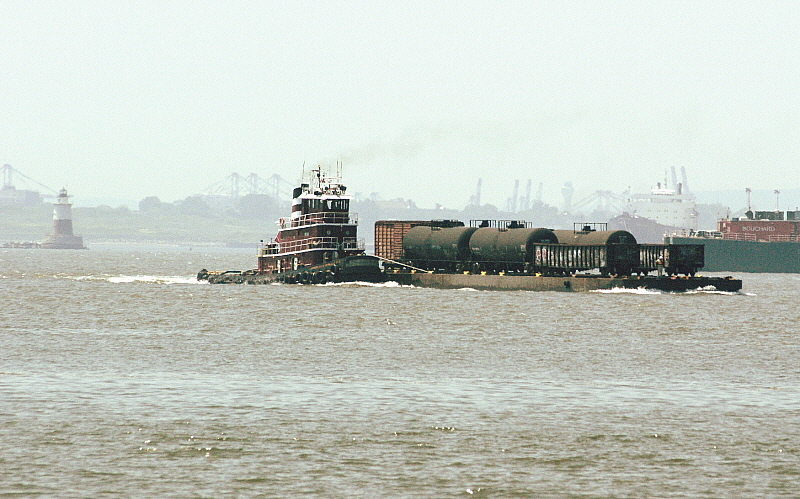 The "John P. Brown" taking a loaded float across the upper bay. Robbins Reef lighthouse on left. In front of Statue of Liberty. 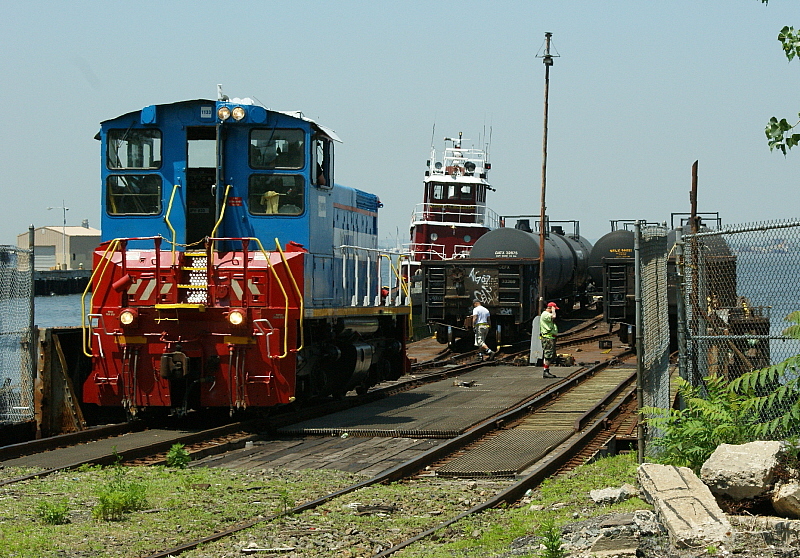 Three of the four New York Cross Harbor Railroad carfloats were transferred to New York New Jersey Rail. 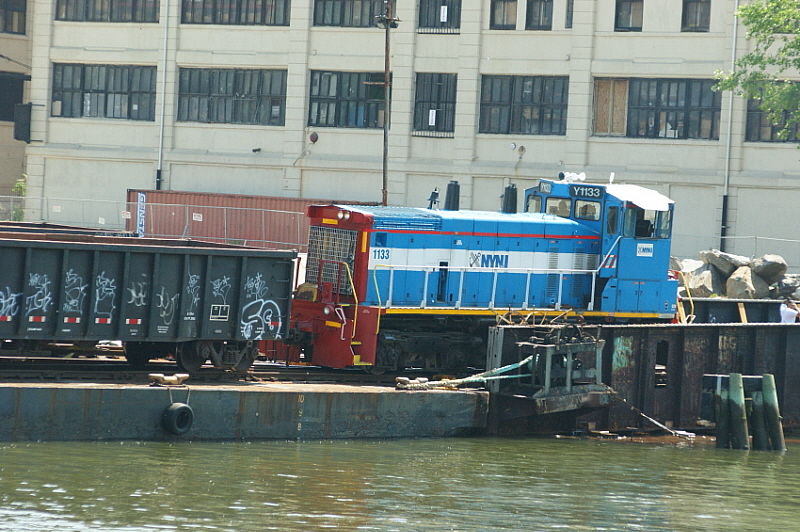 Unfortunately the fourth carfloat, #30; sunk in January 2006, just prior to the formation of New York New Jersey Rail. As of 2011, only two carfloats are known to be in service: #16 and #29 with #16 being used as primary. The disposition of #17 is not known. As constructed, carfloats can range from 200 to 350 feet long and each carfloat can hold between 10 to 20 cars, depending on the car lengths and loads. 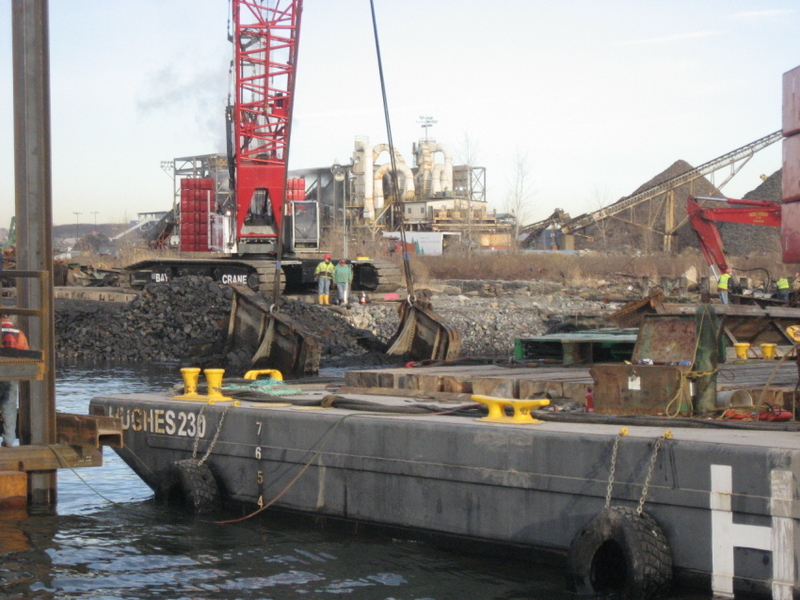 As of end of 2012 and following the loss of Carfloat #29 due to Hurricane Sandy, NYNJ Rail commenced in having Weeks barge #278, reconstructed as a carfloat. This is most ironic as Weeks #278 itself was a former carfloat. 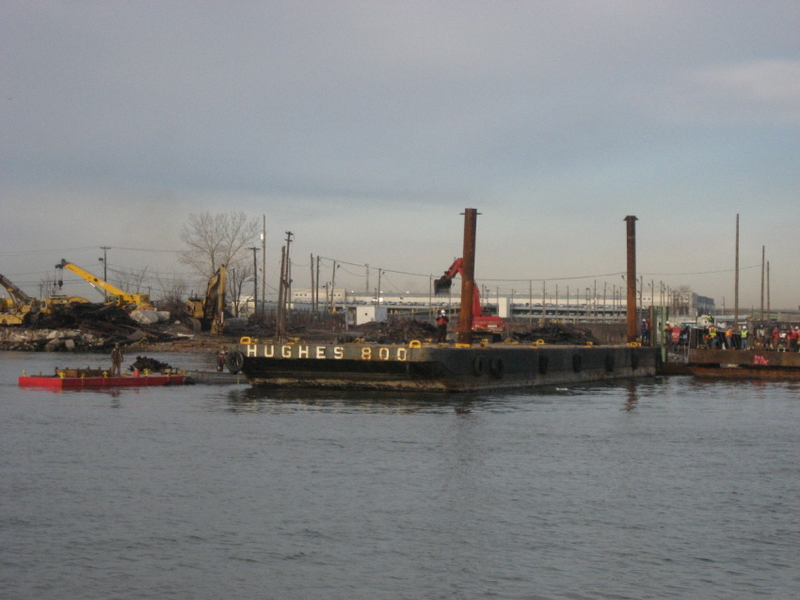 With the downturn of rail-marine interchange traffic in New York Harbor, it was surplussed and sold to Weeks Marine, the rails removed and pressed into service as a flat top barge. Therefore with this recent refit, it has returned to the duty of which it was originally designed and built for. 16 290' 41' New York Dock in service "11 car capacity"
rehabilitated in 1998 with new rail. 278 354' ex-Weeks acquired 12/2012? New York New Jersey Rail has inherited a caboose by way of the New York Cross Harbor RR. 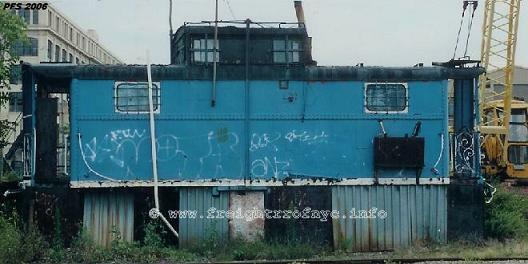 This caboose, which was used as a Yard Office at Bush Terminal, is now vacant. 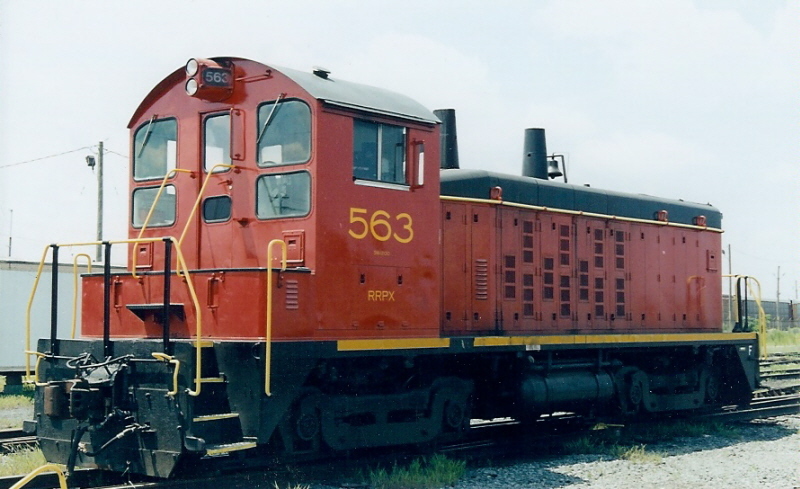 It was originally a Pennsylvania Railroad N5 class caboose. Careful examination by both this author and fellow historian Philip M. Goldstein in July 2007 and again in February 2009 has revealed that this caboose has a layer of red paint and then green paint under the current blue paint. 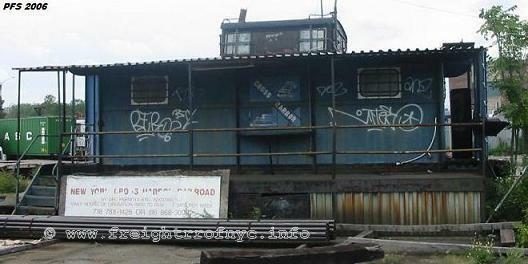 Therefore, this caboose is in all likelihood the caboose formerly used as the master mechanics office of the Brooklyn Eastern District Terminal, and of which was located behind the enginehouse and shops of that railroad at North 8th Street and the East River Bulkhead. Like what you see? Suggestions? Comments?